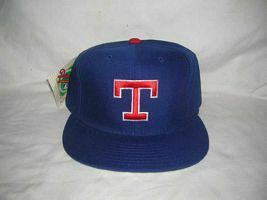 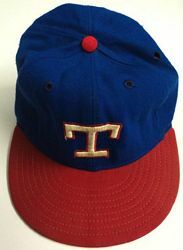 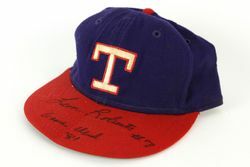 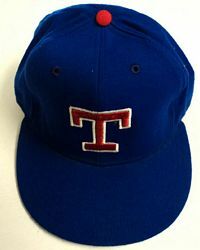 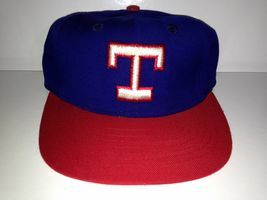 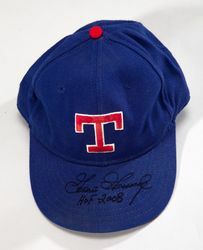 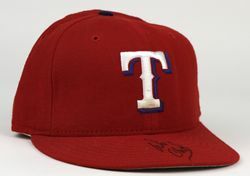 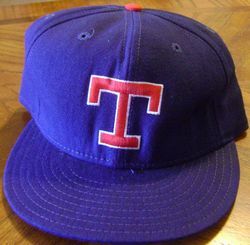 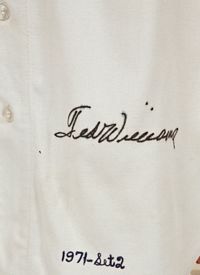 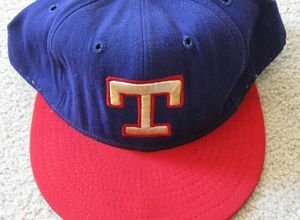 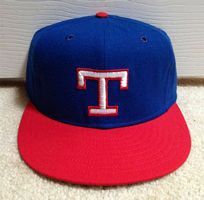 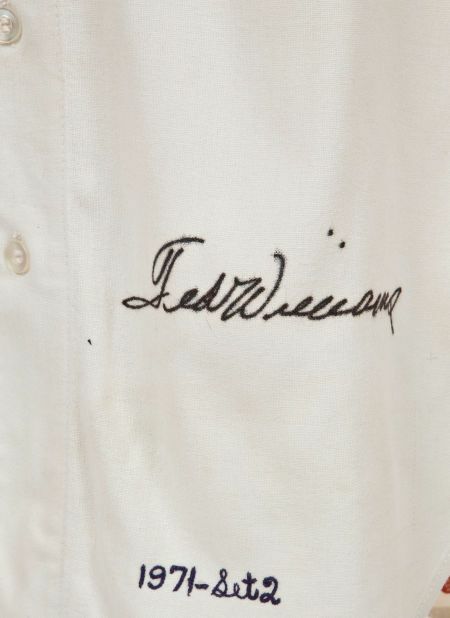 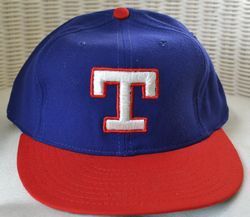 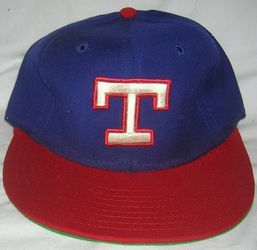 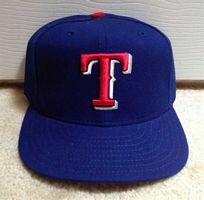 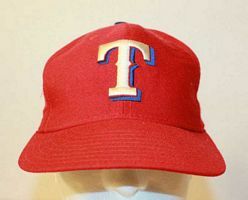 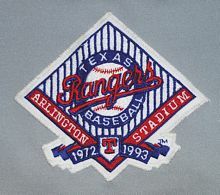 The Expansion Washington Senators moved to Dallas for the 1972 season. 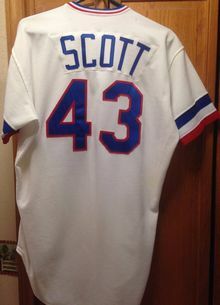 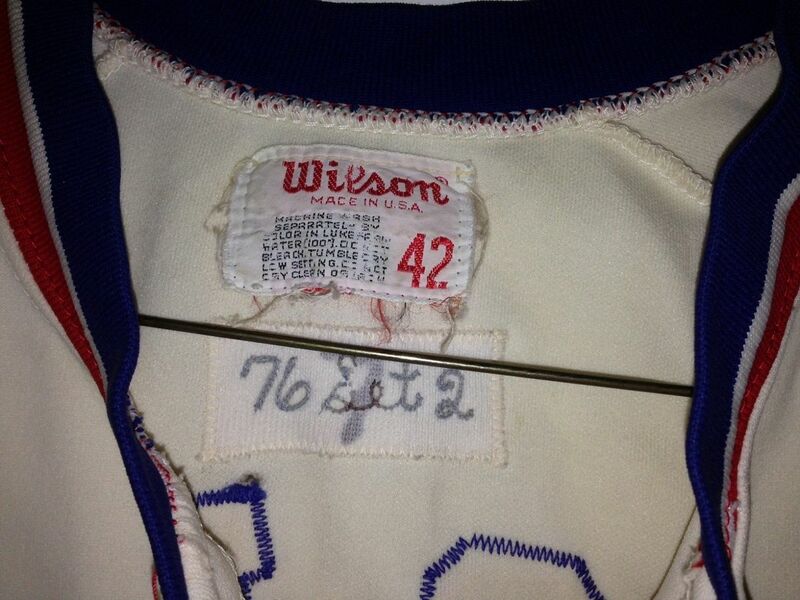 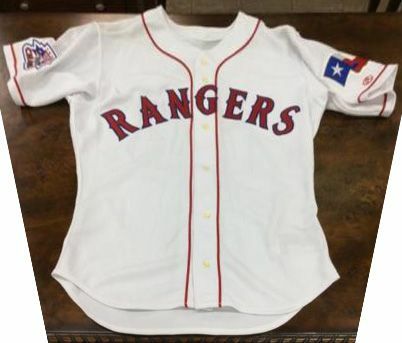 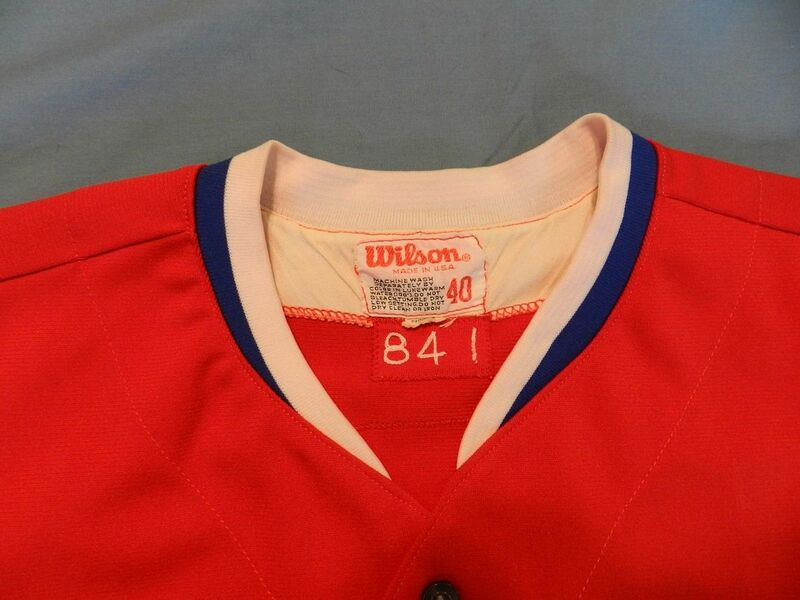 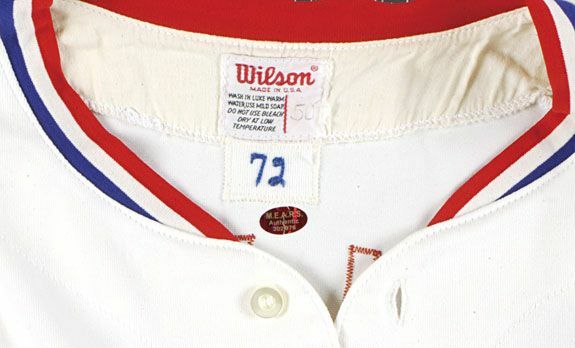 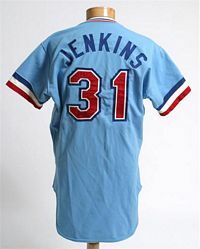 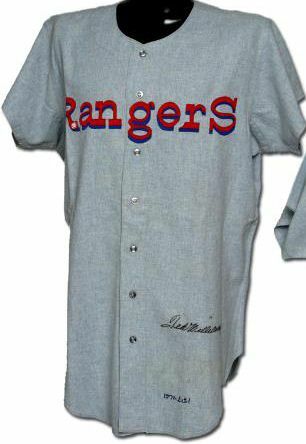 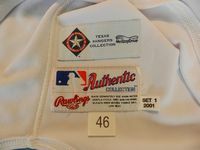 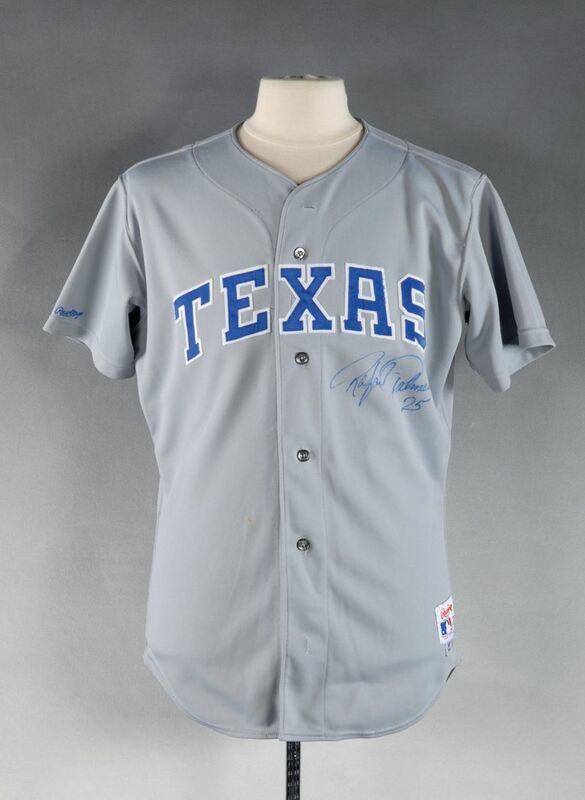 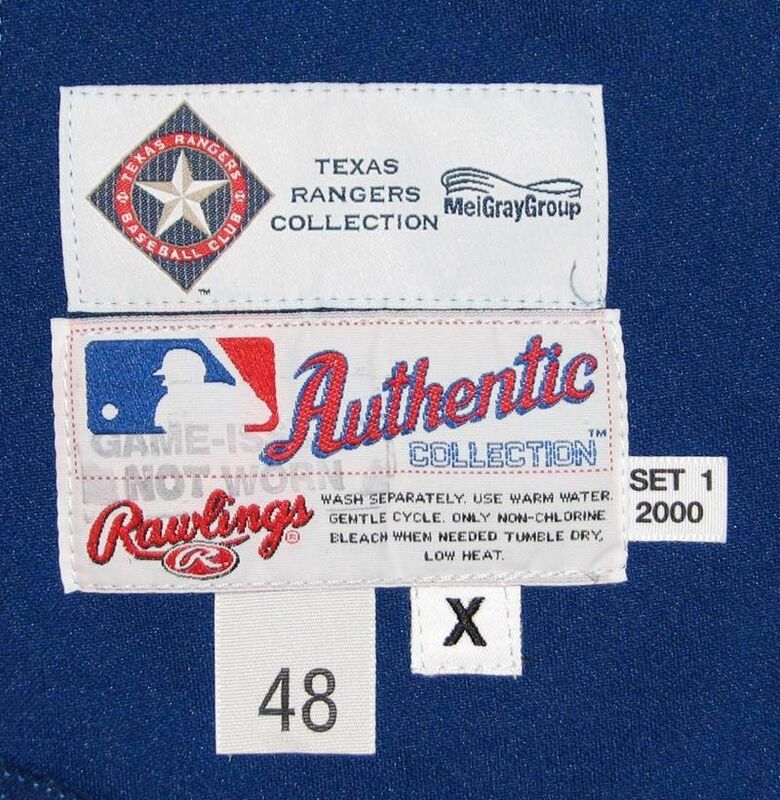 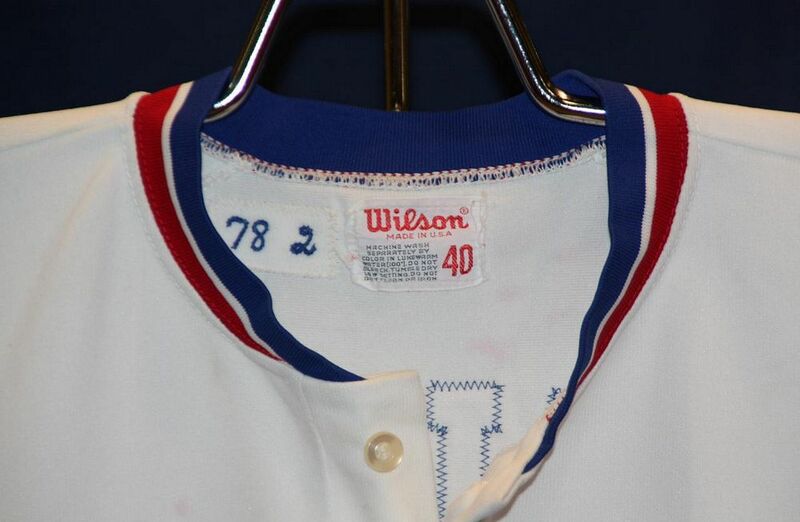 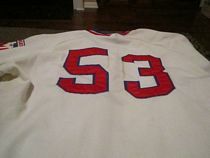 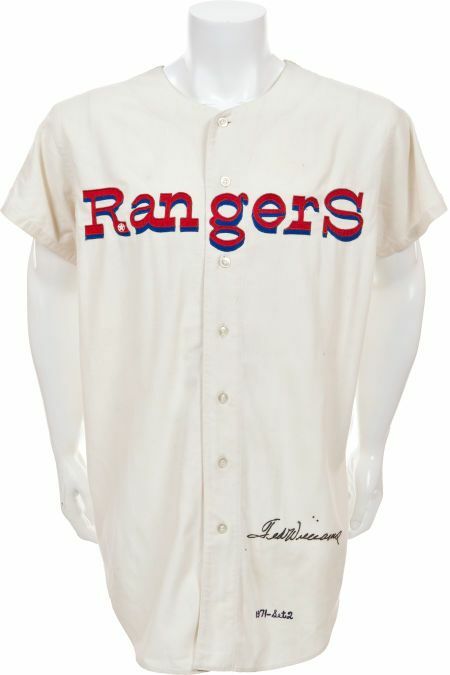 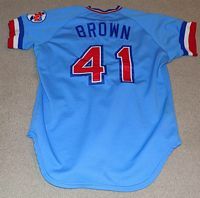 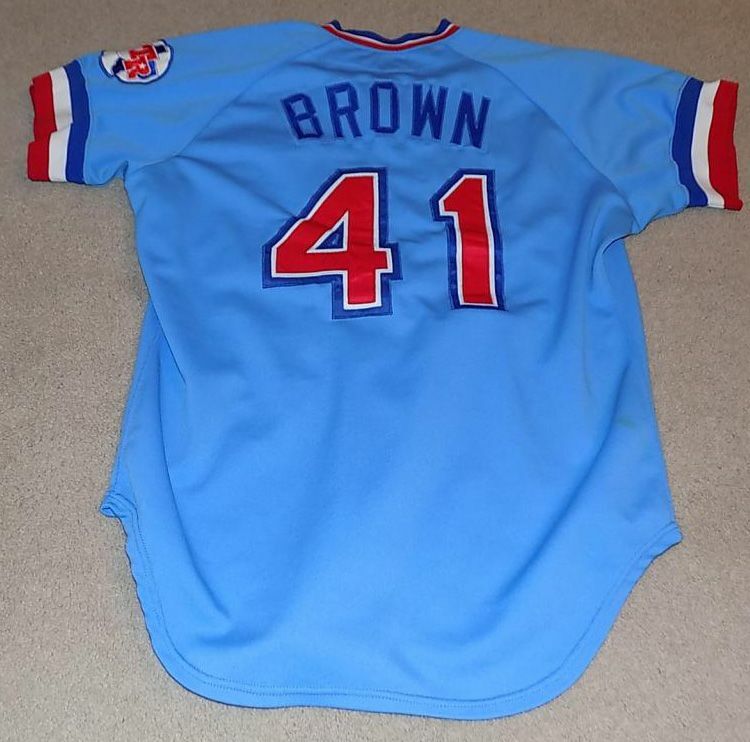 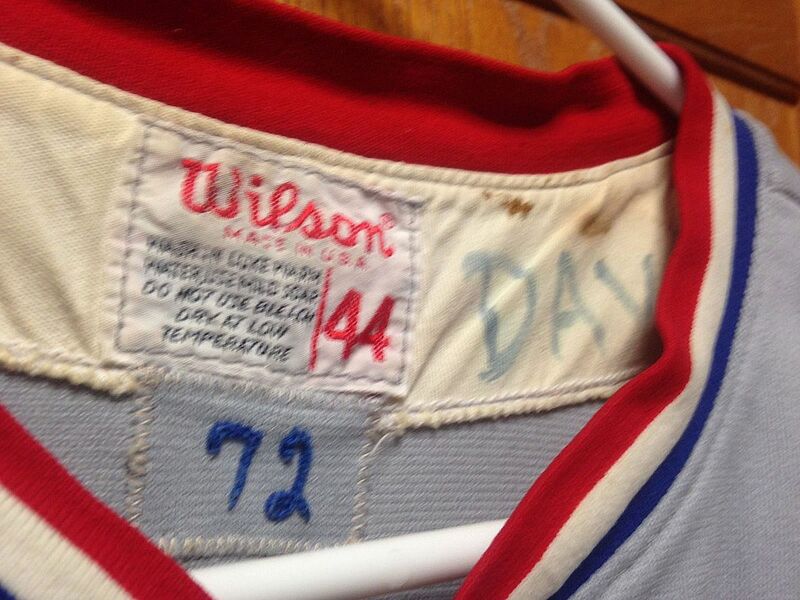 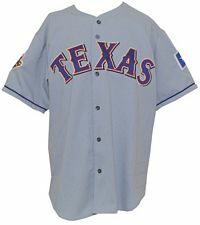 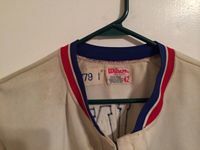 1971 flannel Senators jerseys are converted to "RangerS" jerseys for Spring Training. 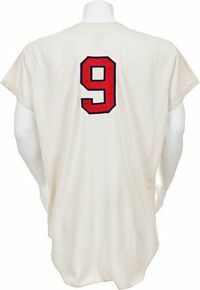 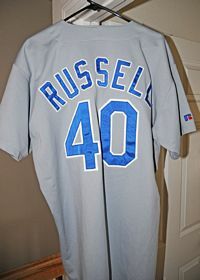 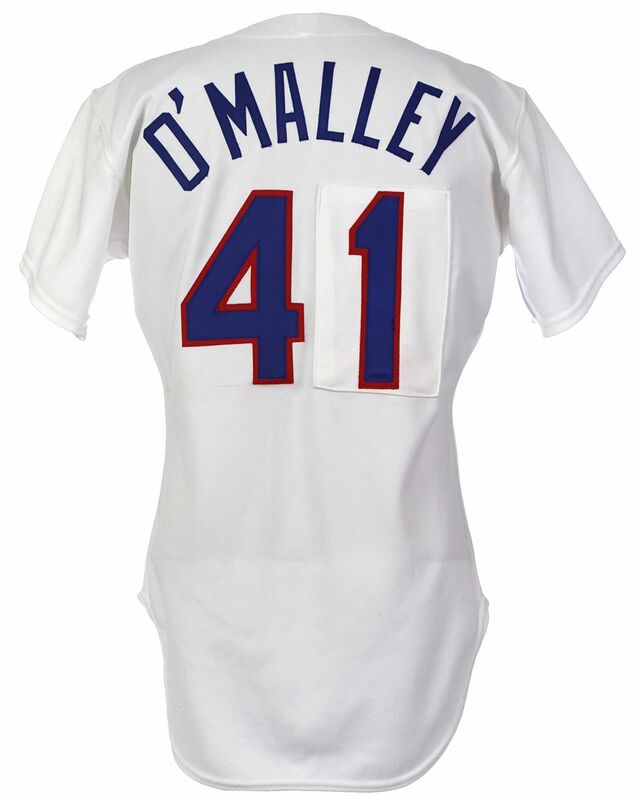 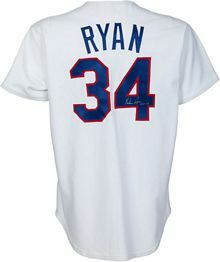 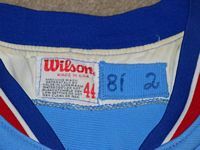 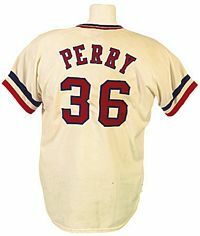 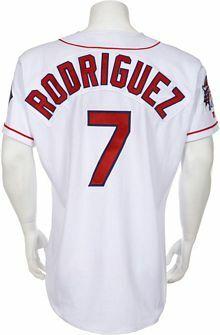 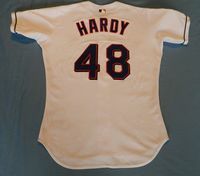 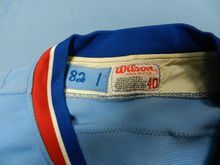 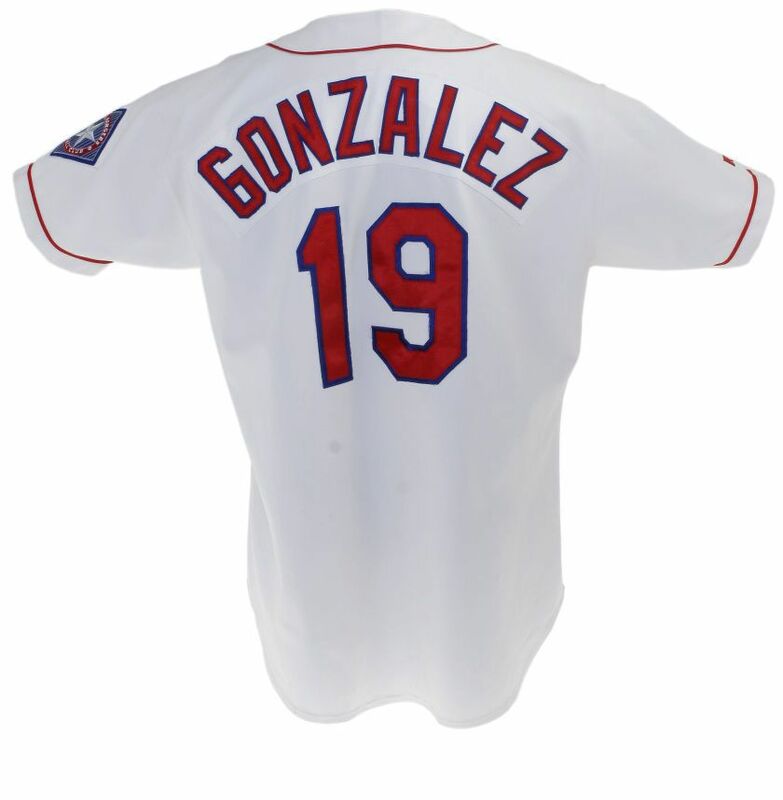 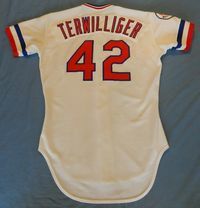 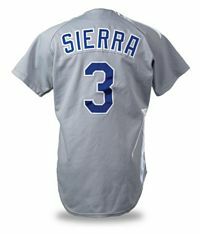 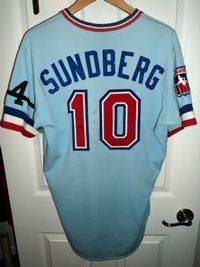 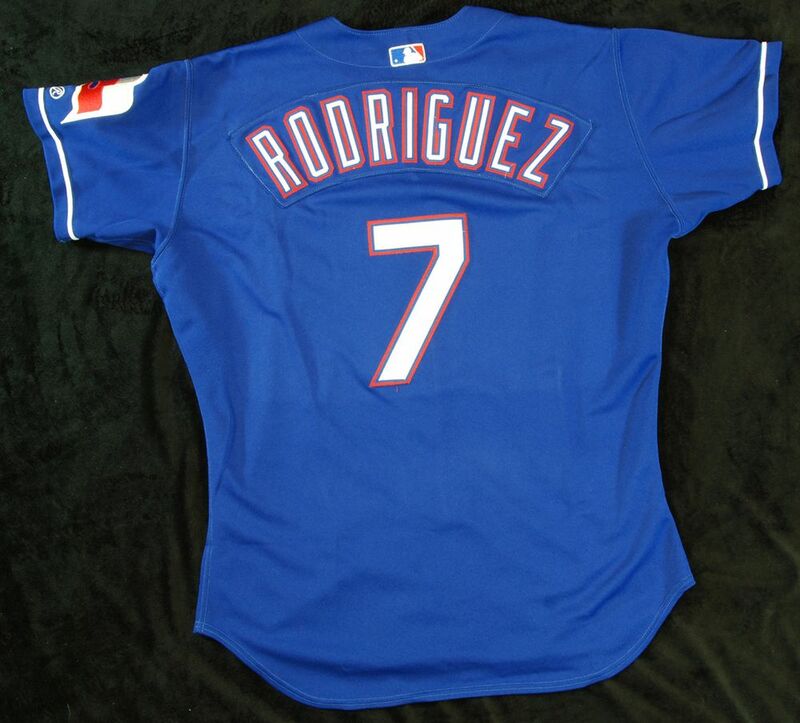 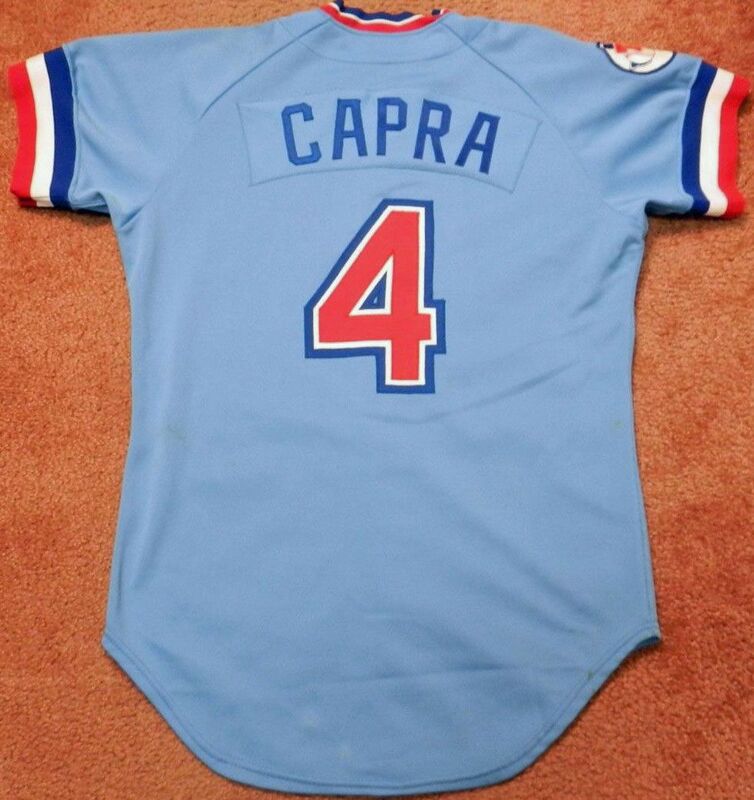 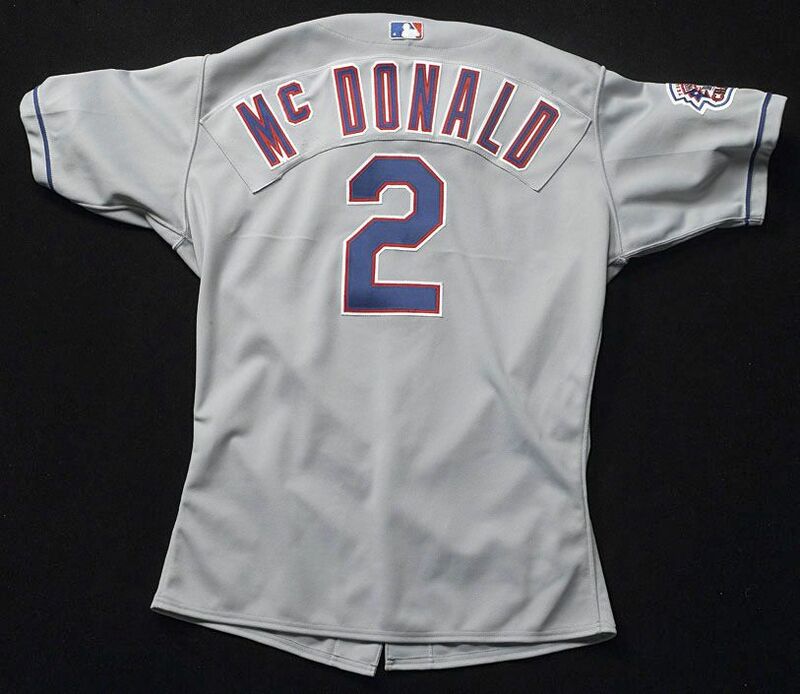 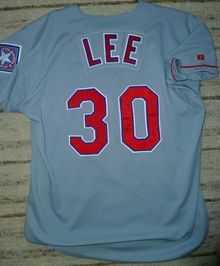 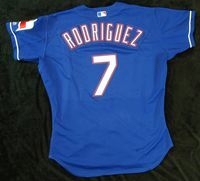 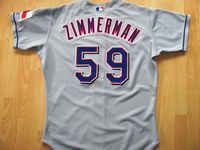 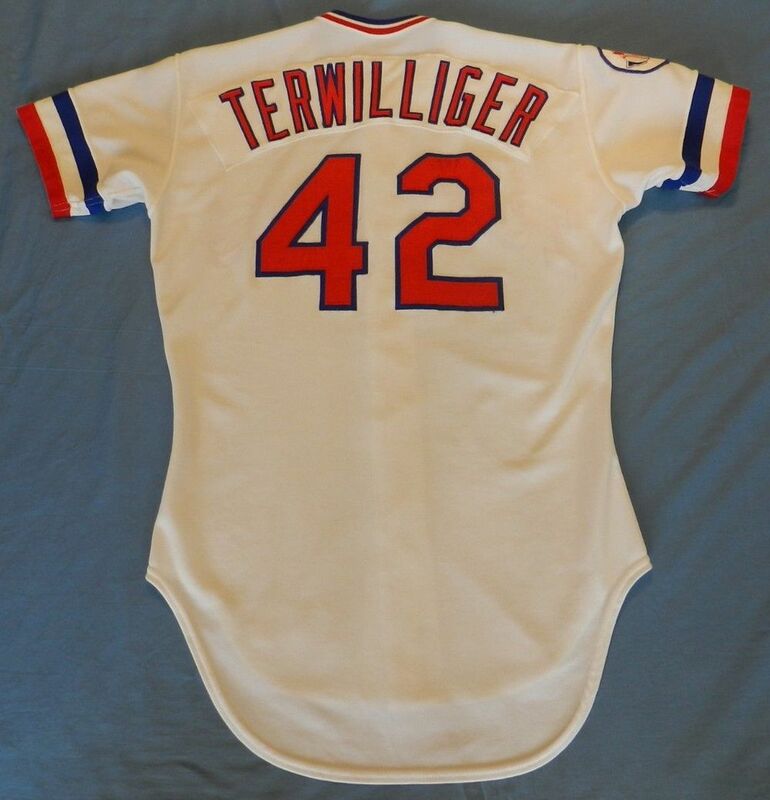 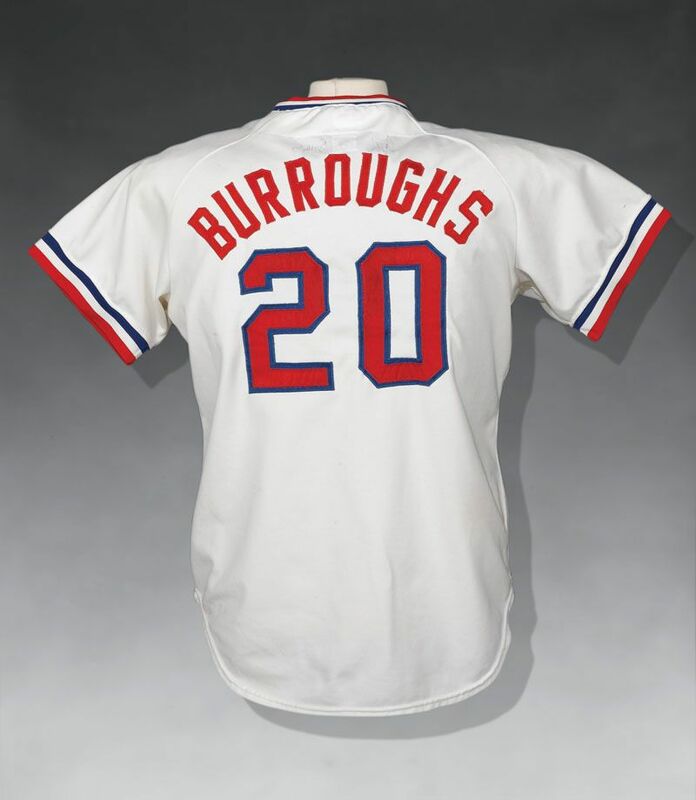 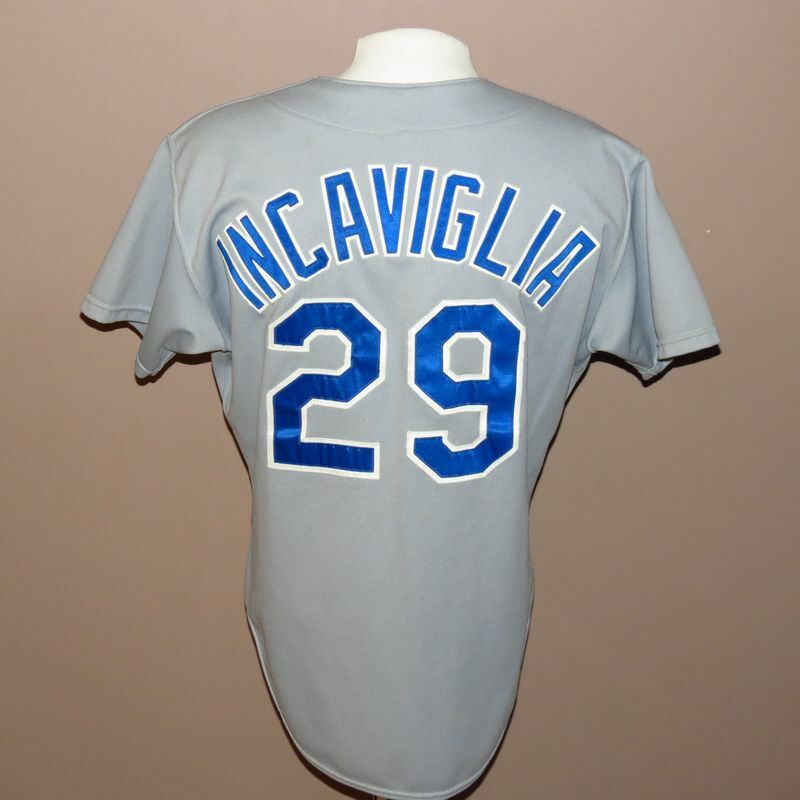 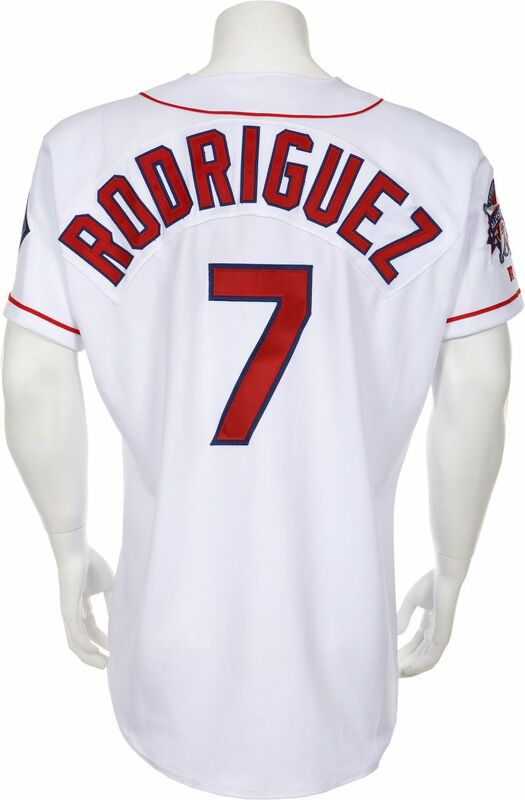 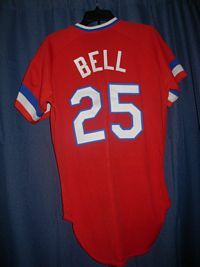 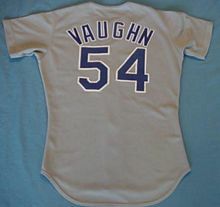 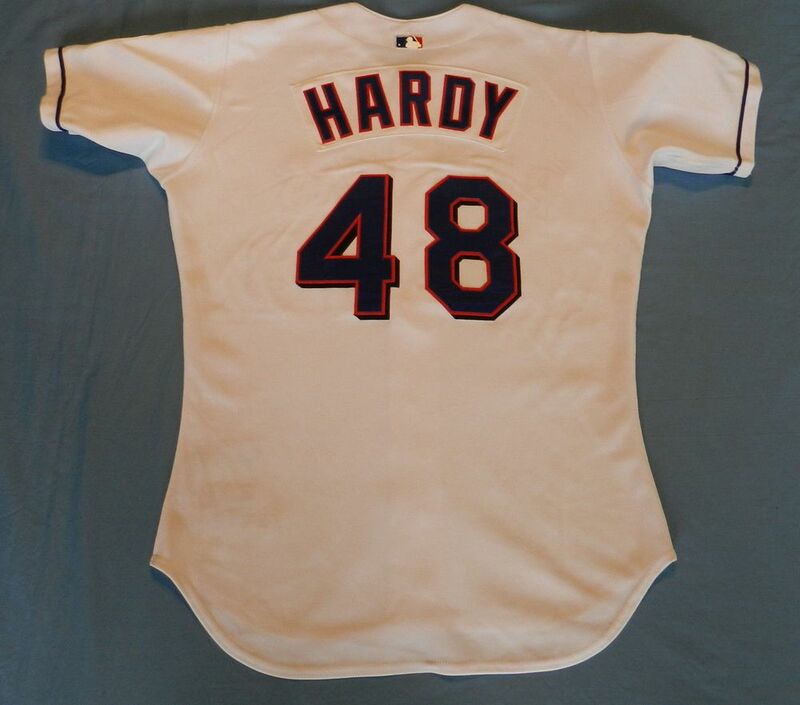 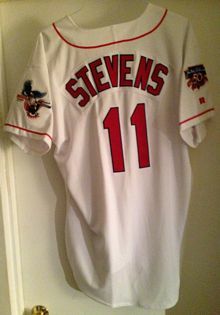 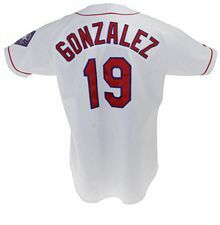 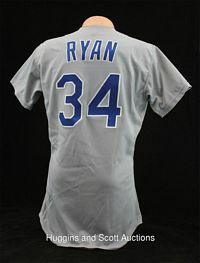 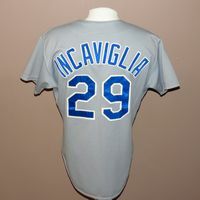 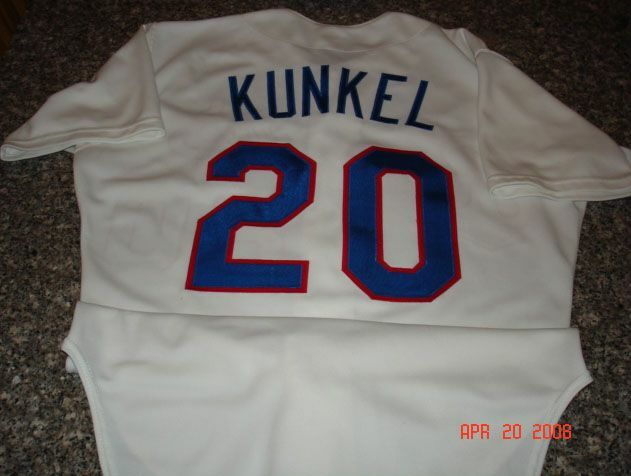 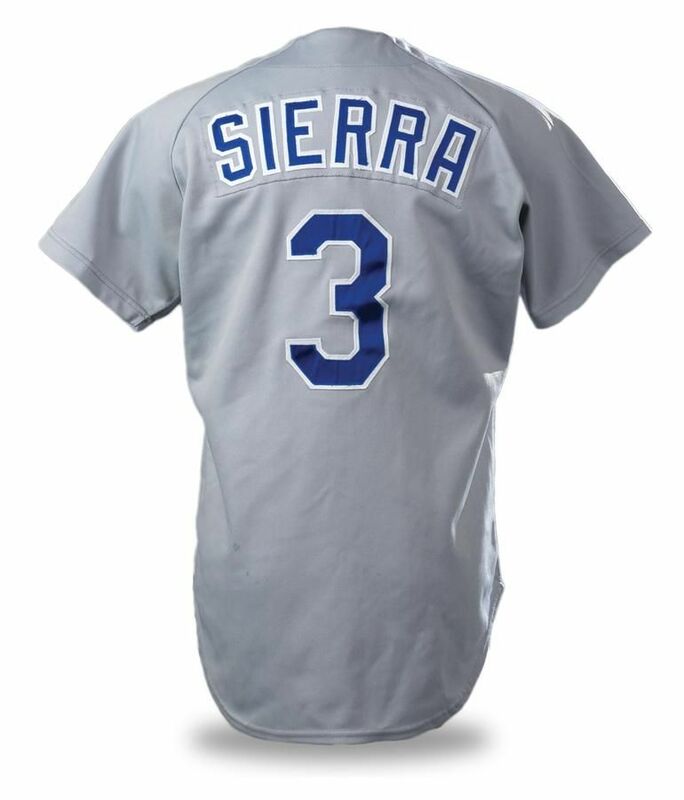 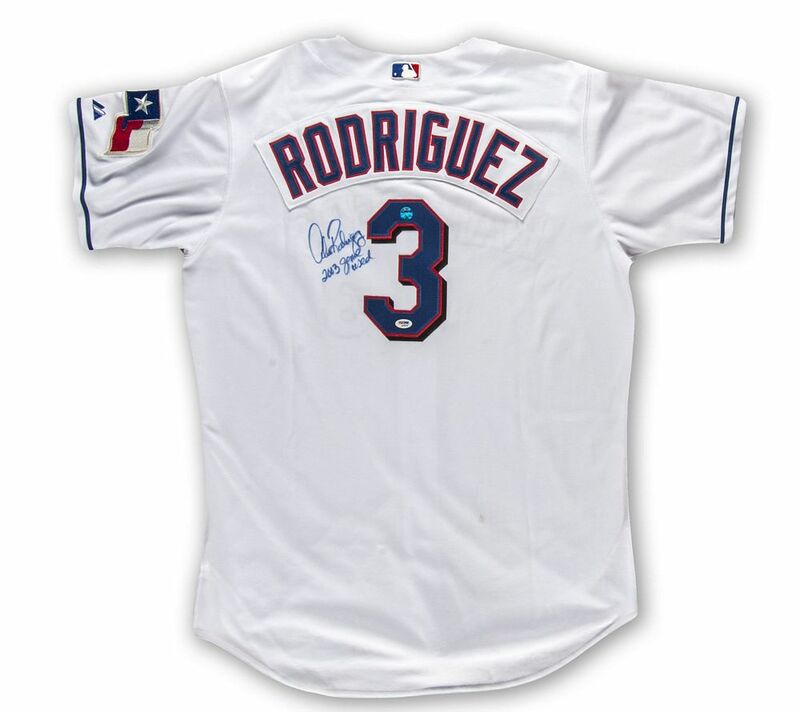 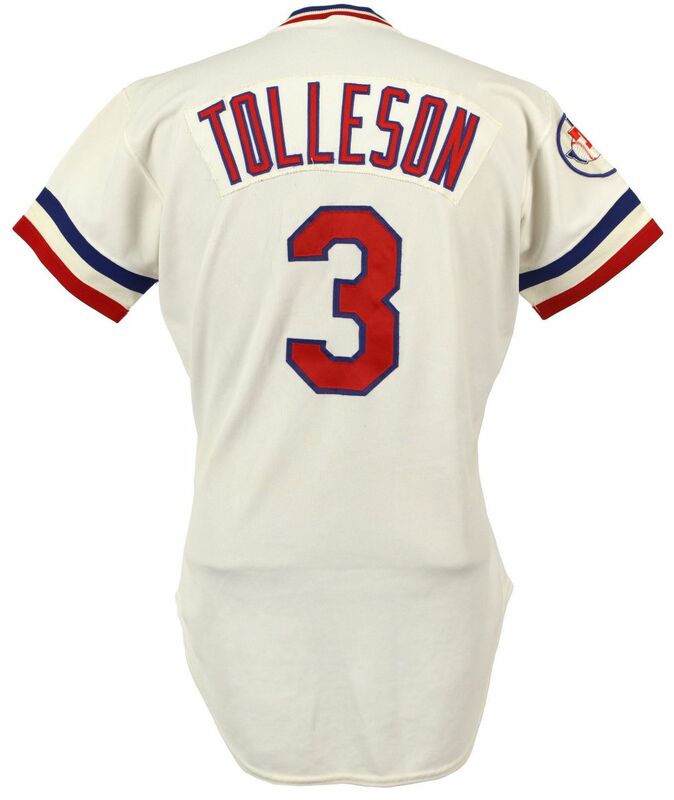 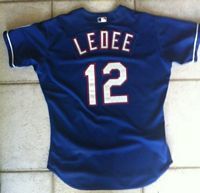 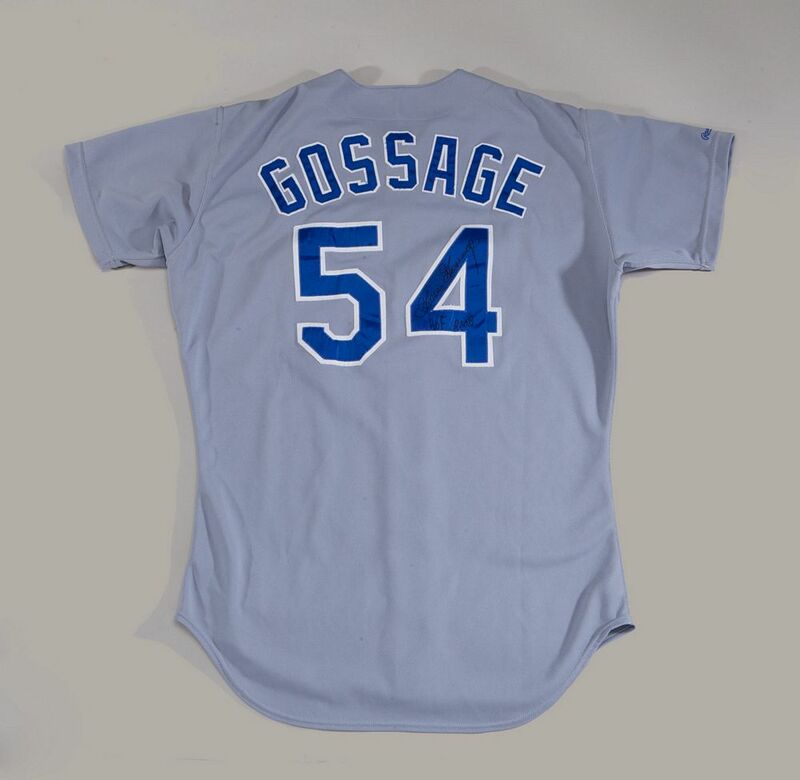 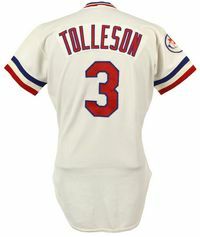 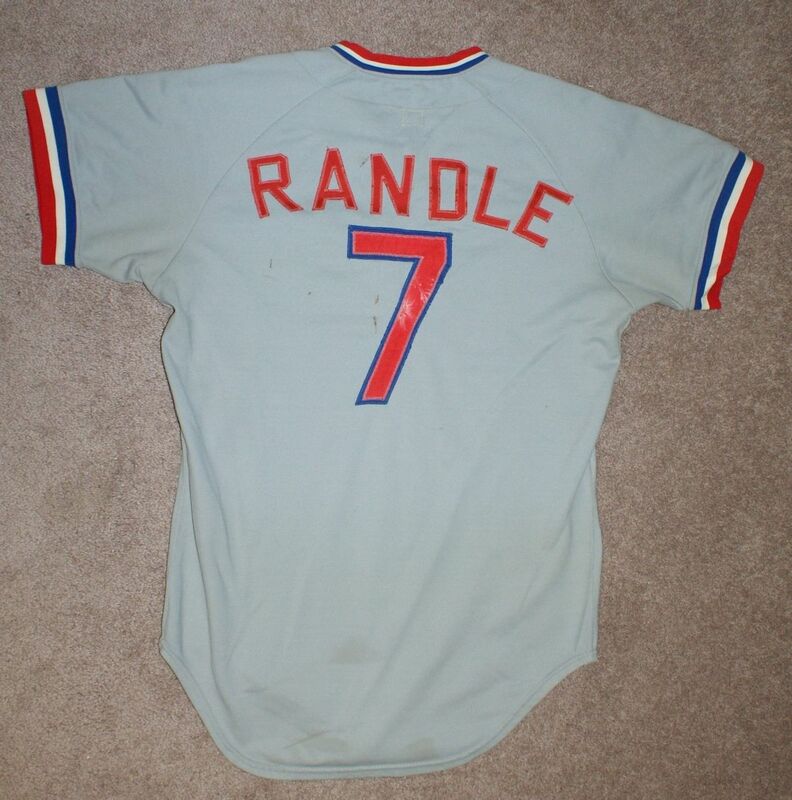 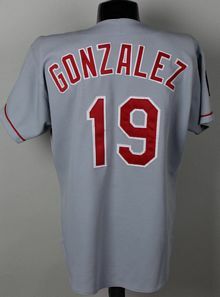 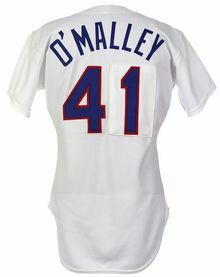 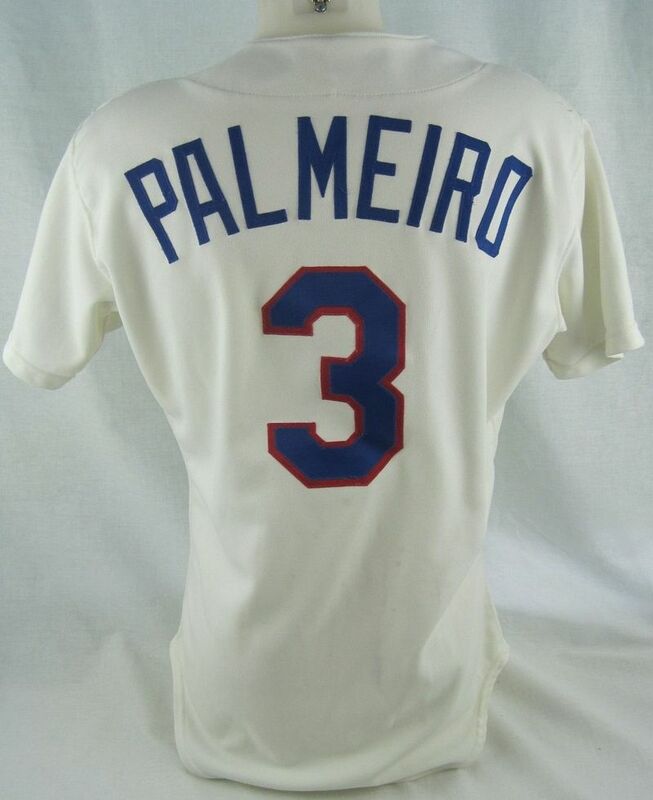 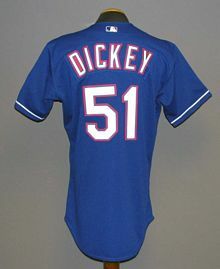 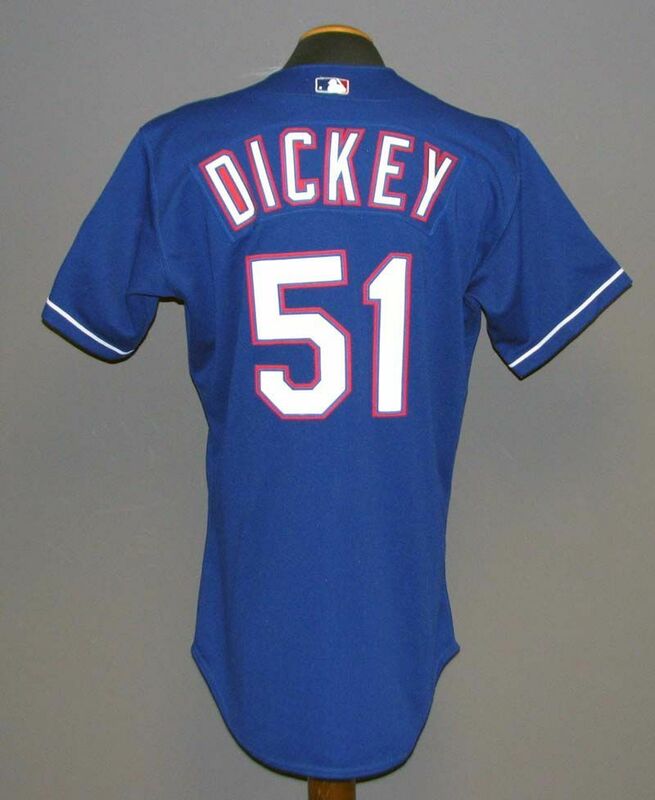 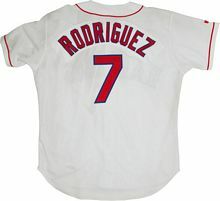 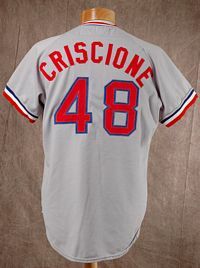 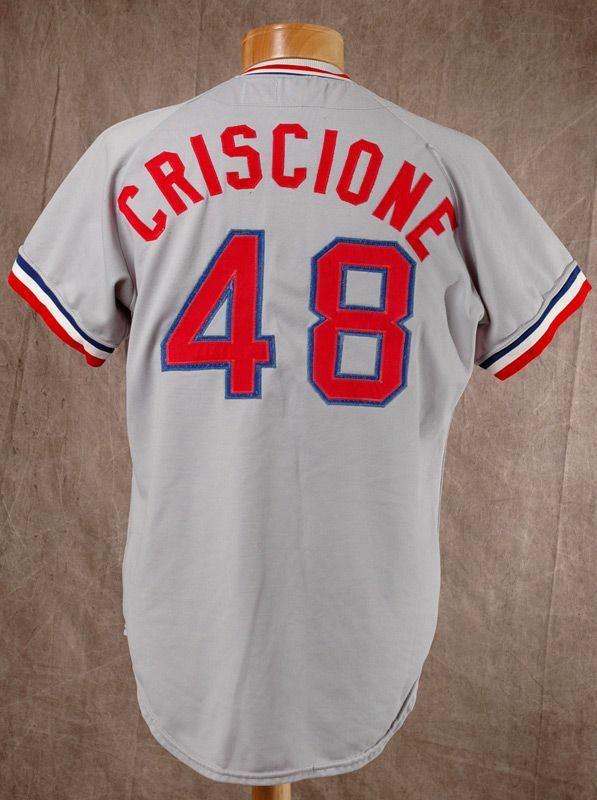 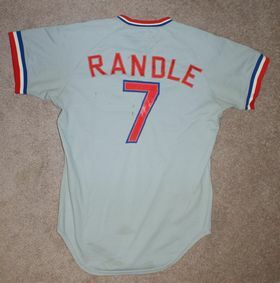 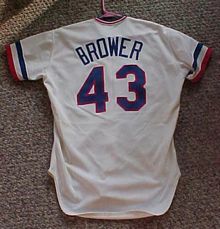 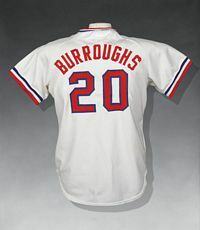 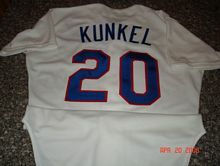 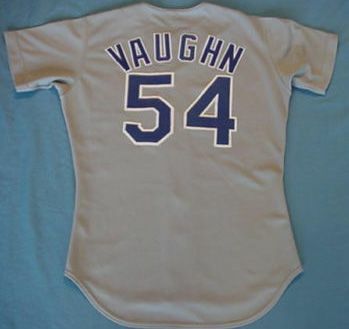 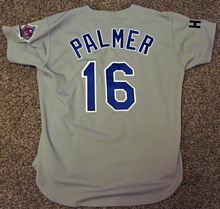 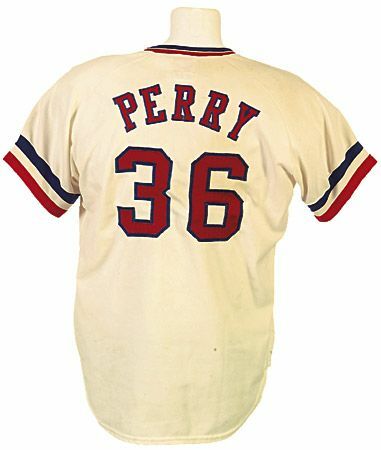 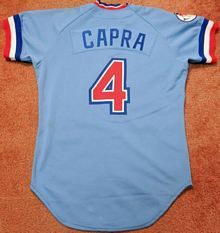 The front lettering has blue trim while the back numbers were not replaced and have navy trim. 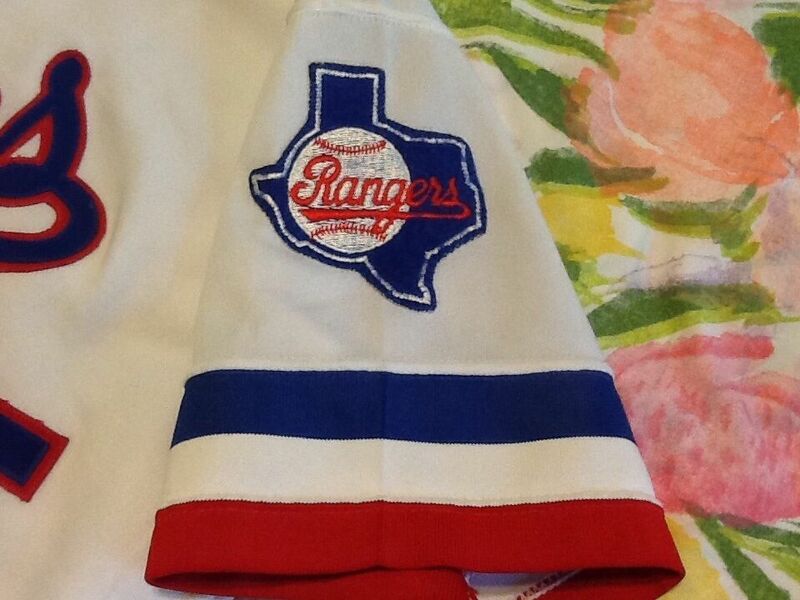 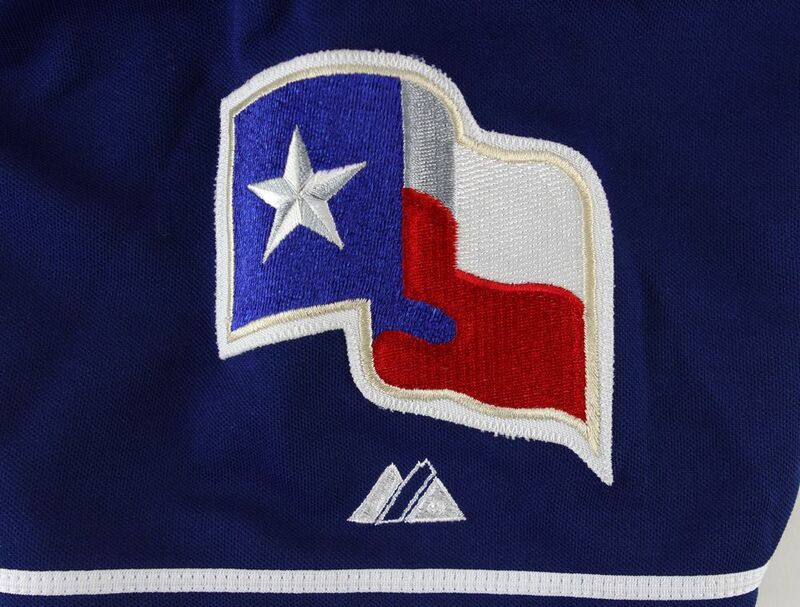 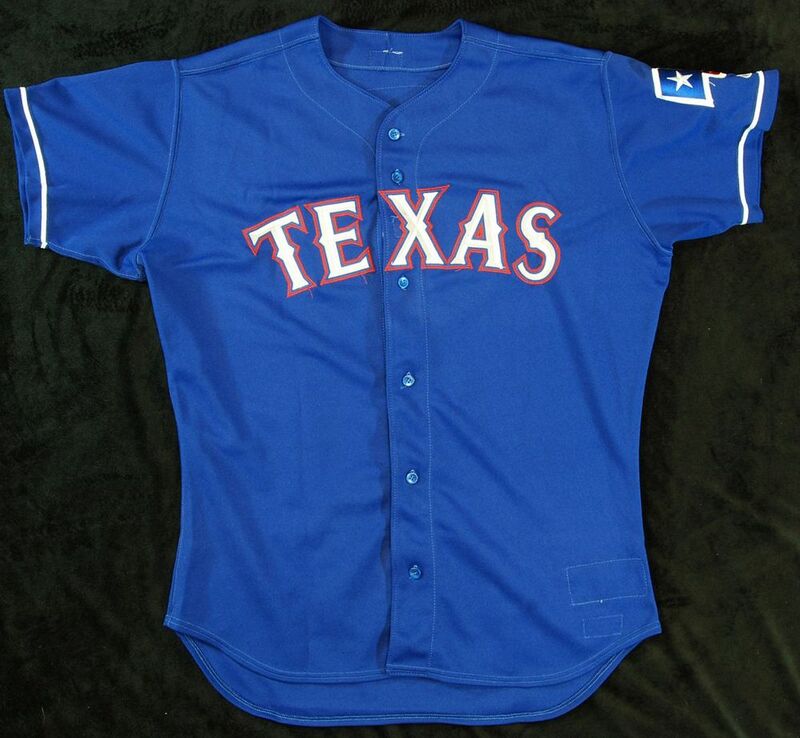 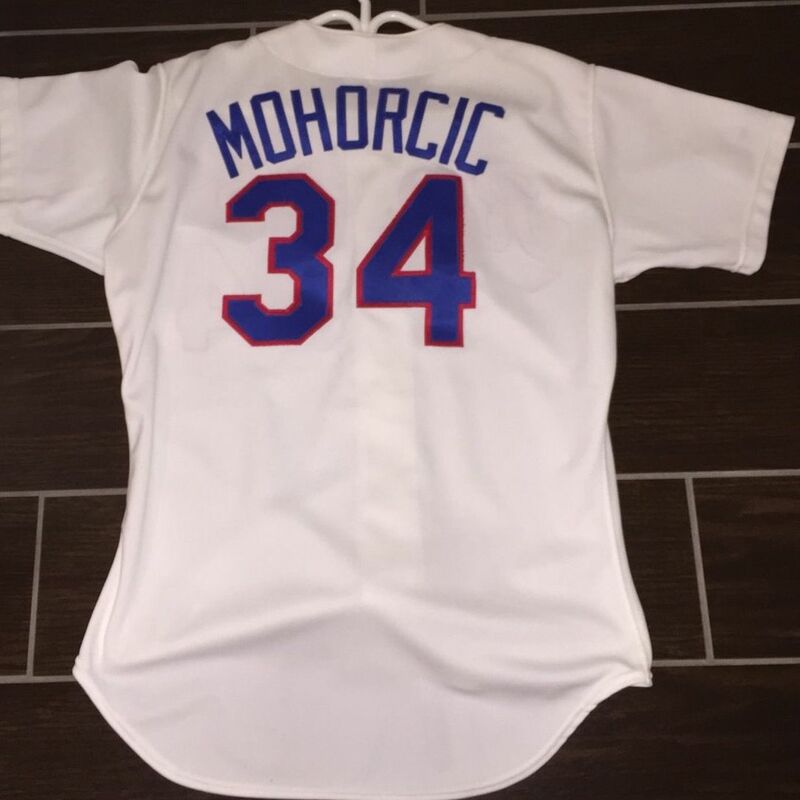 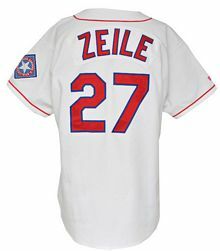 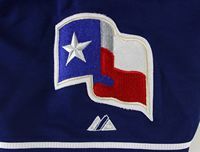 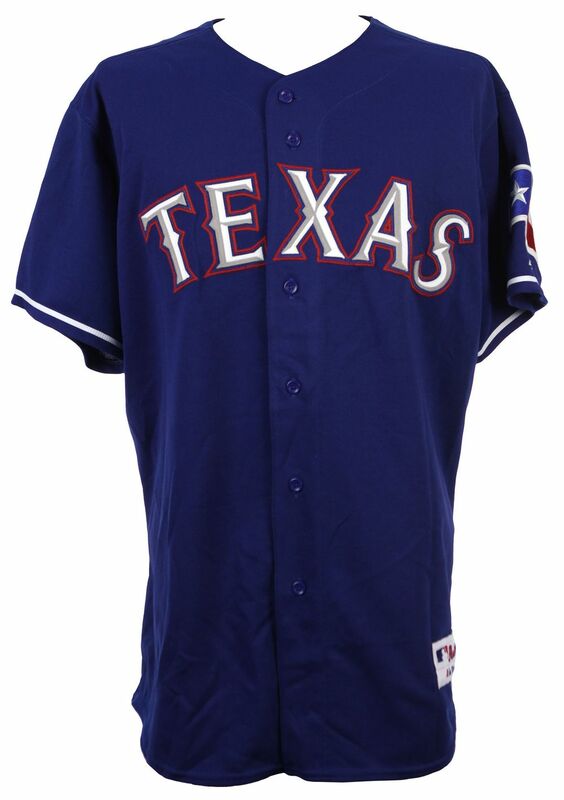 The Rangers' first regular season jersey is double knit. This one's had a number change for reuse in a later year. 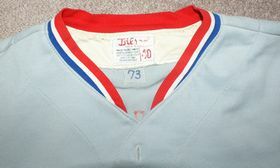 Jerseys change to two-button pullovers. 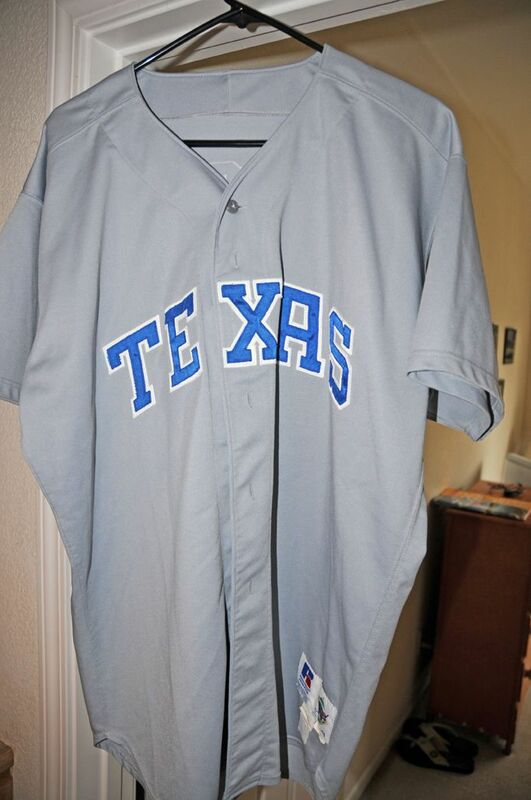 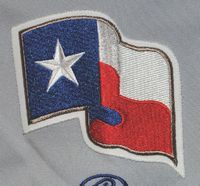 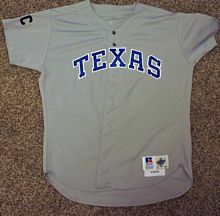 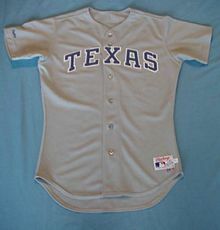 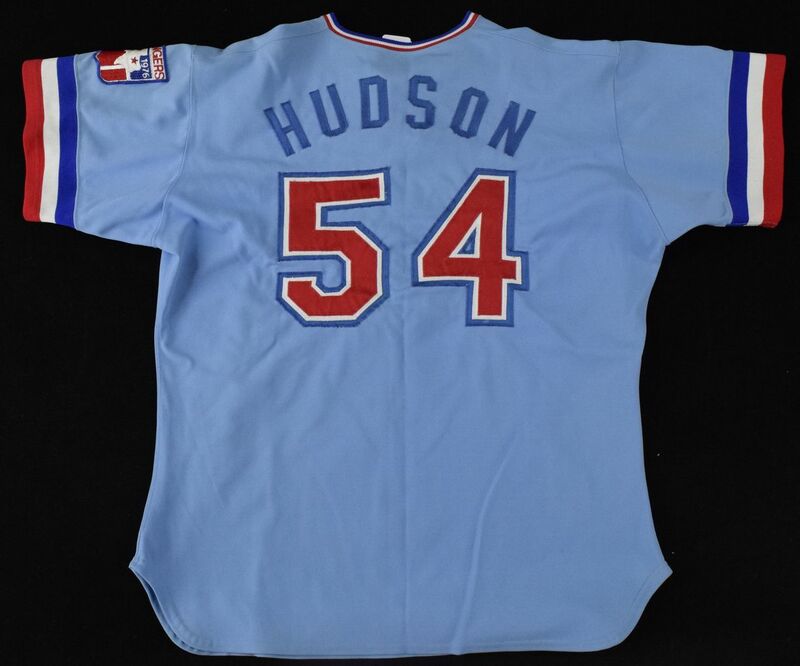 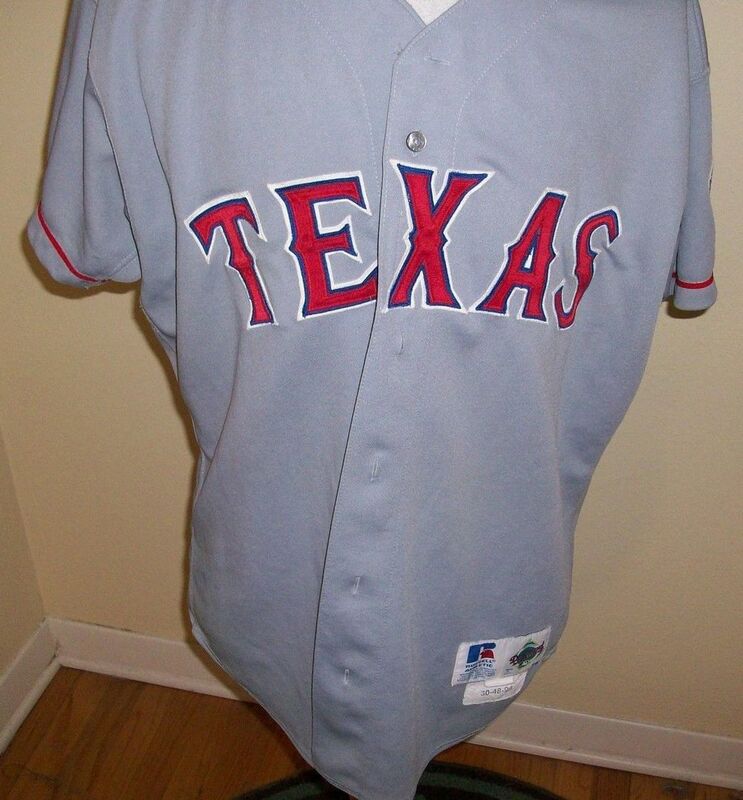 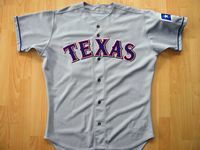 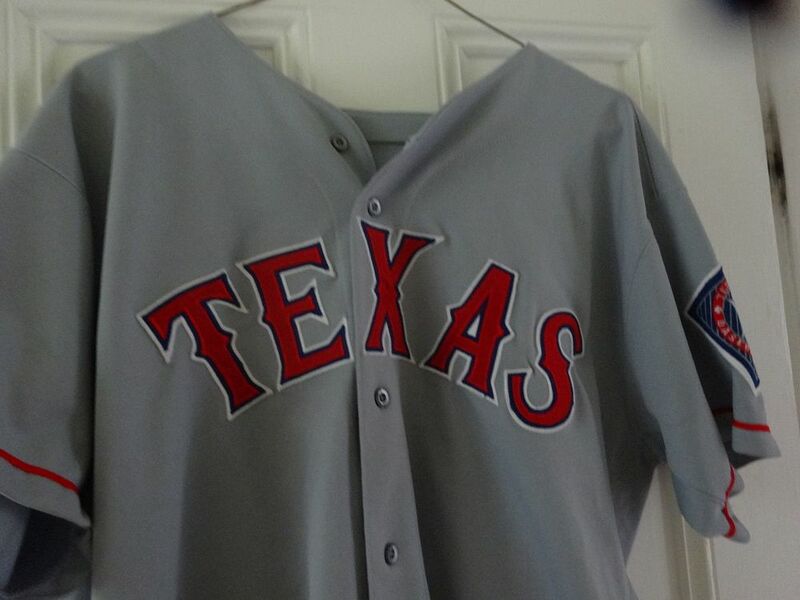 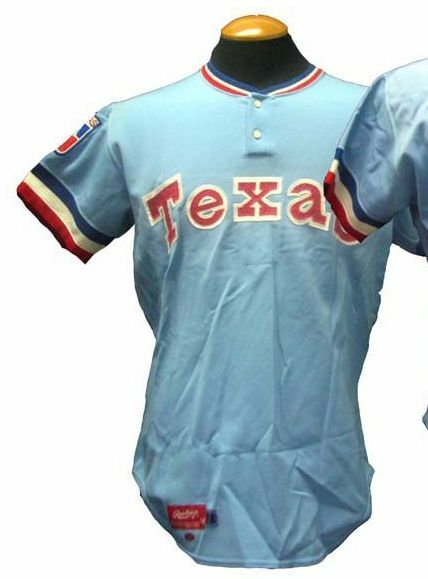 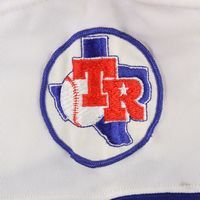 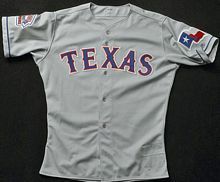 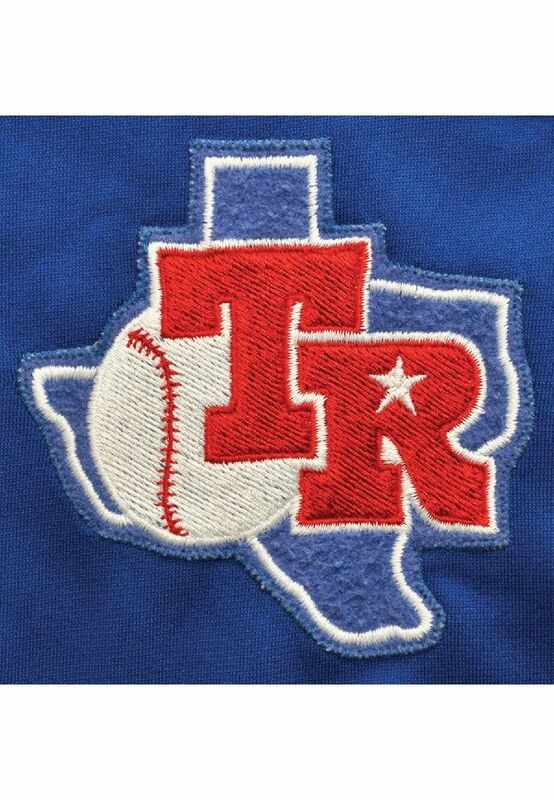 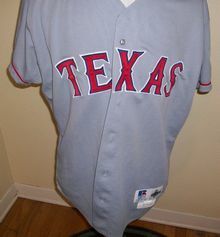 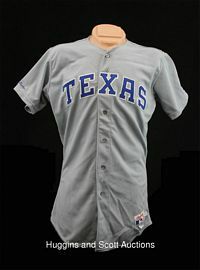 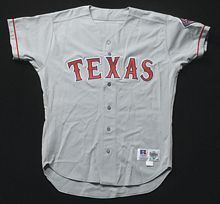 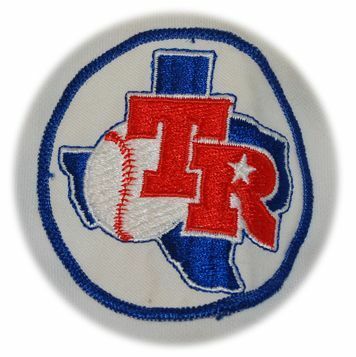 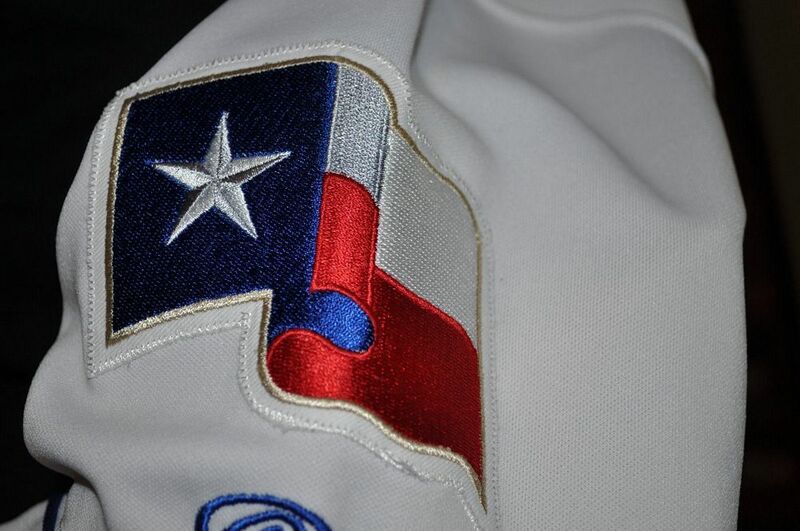 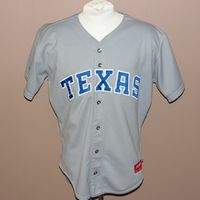 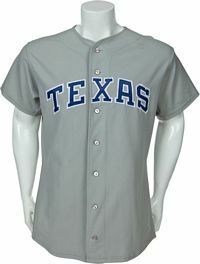 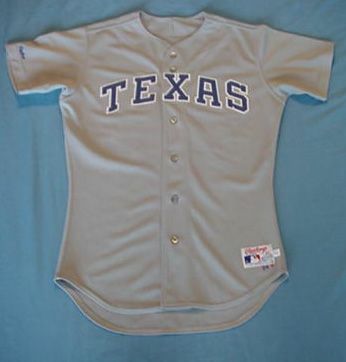 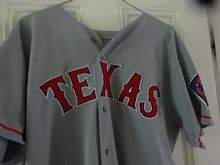 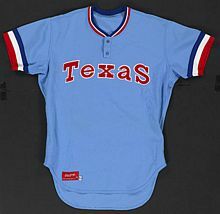 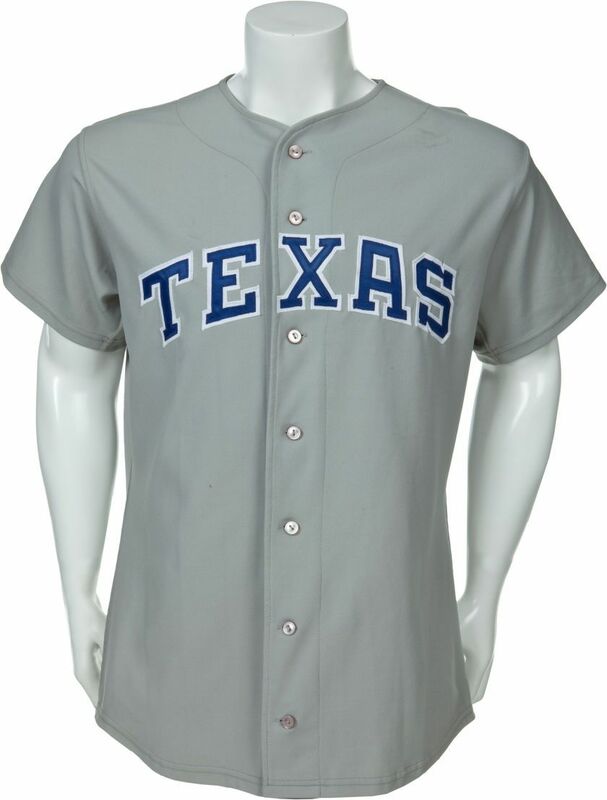 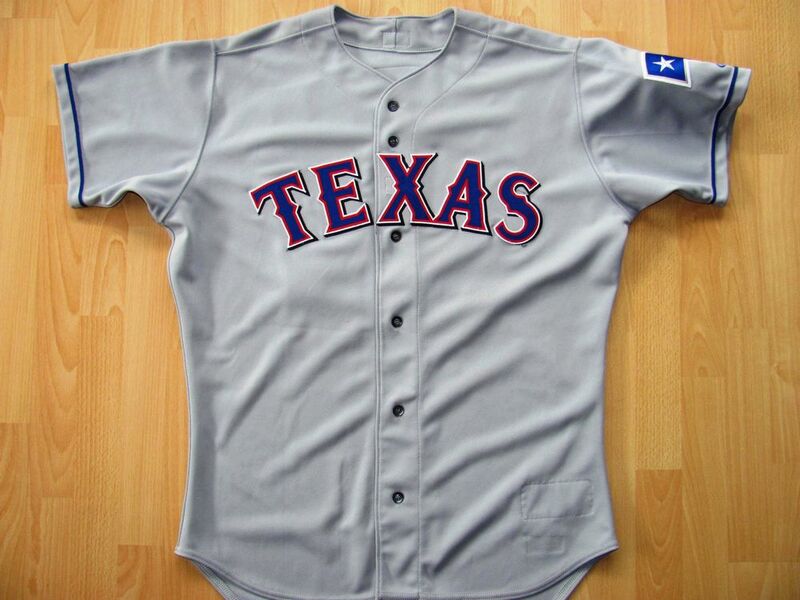 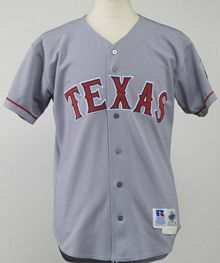 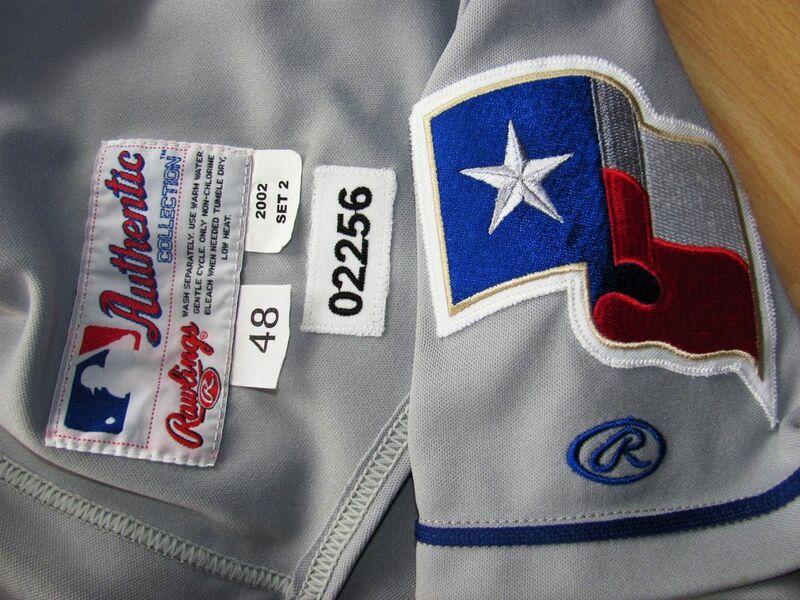 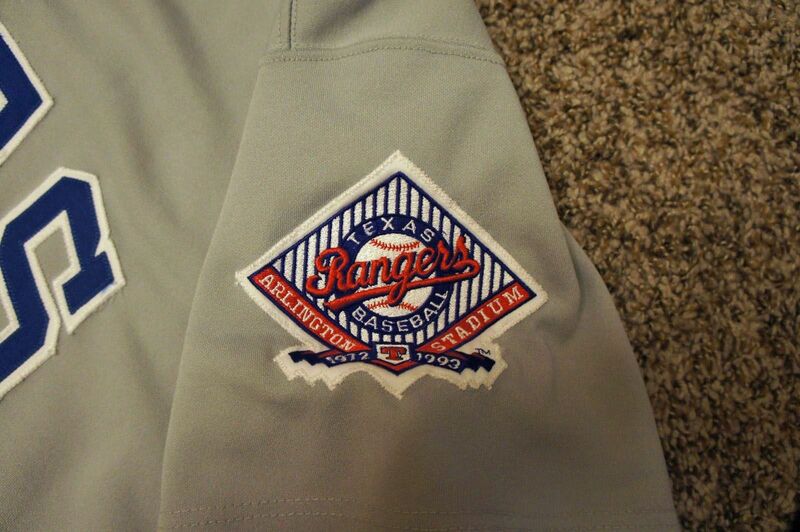 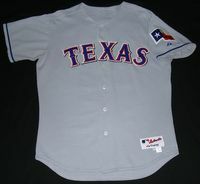 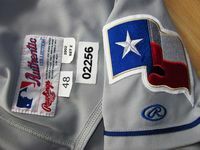 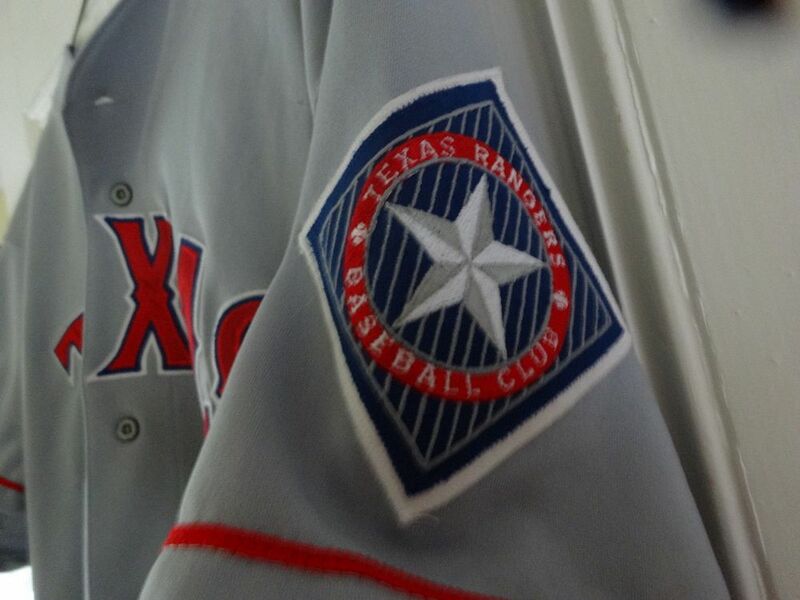 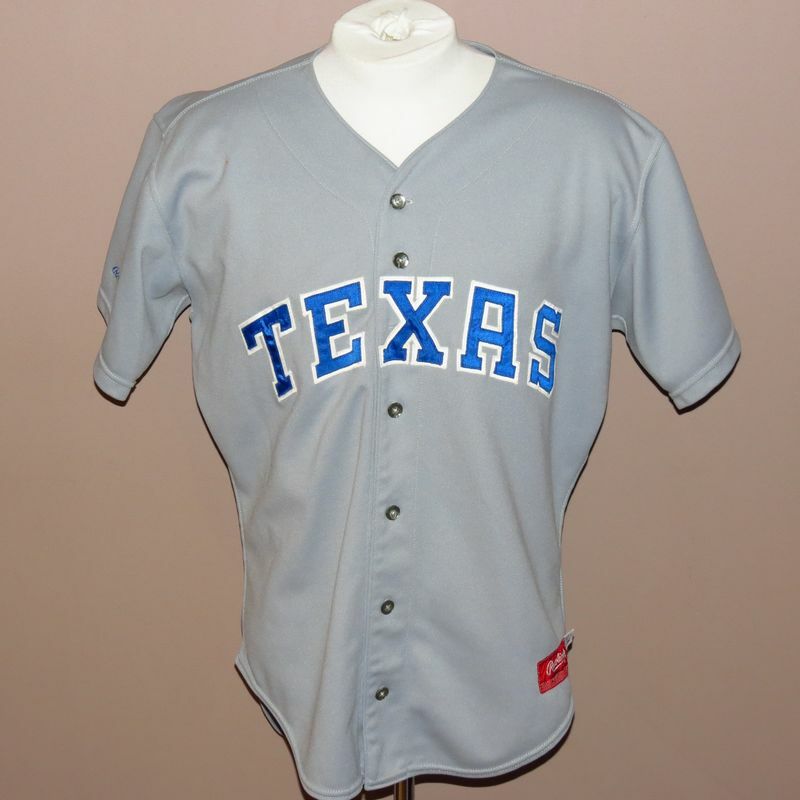 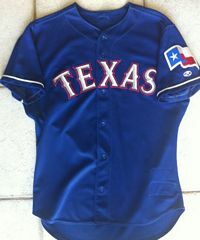 Road jersey goes powder blue and the wordmark changes to "TEXAS". 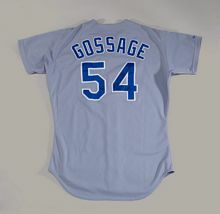 Road jersey wordmark (middle 3 letters) changes to lowercase and blue trim removed. 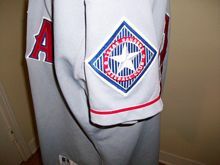 Sleeve patch added. 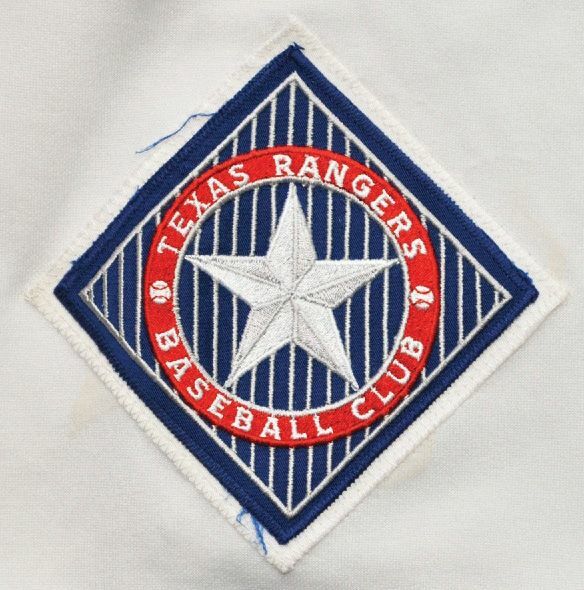 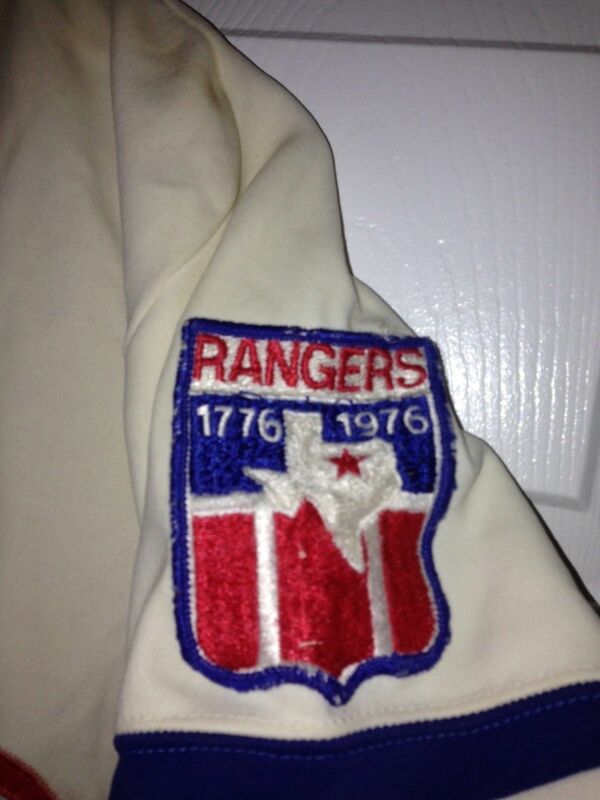 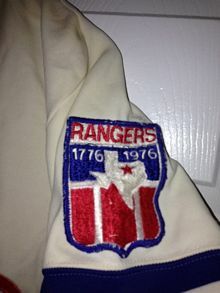 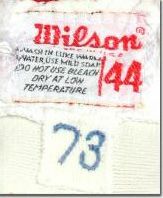 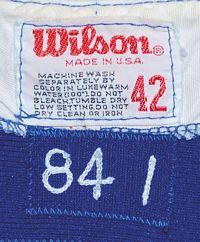 Sleeve patch changed slightly, dropping the 1776-1976. 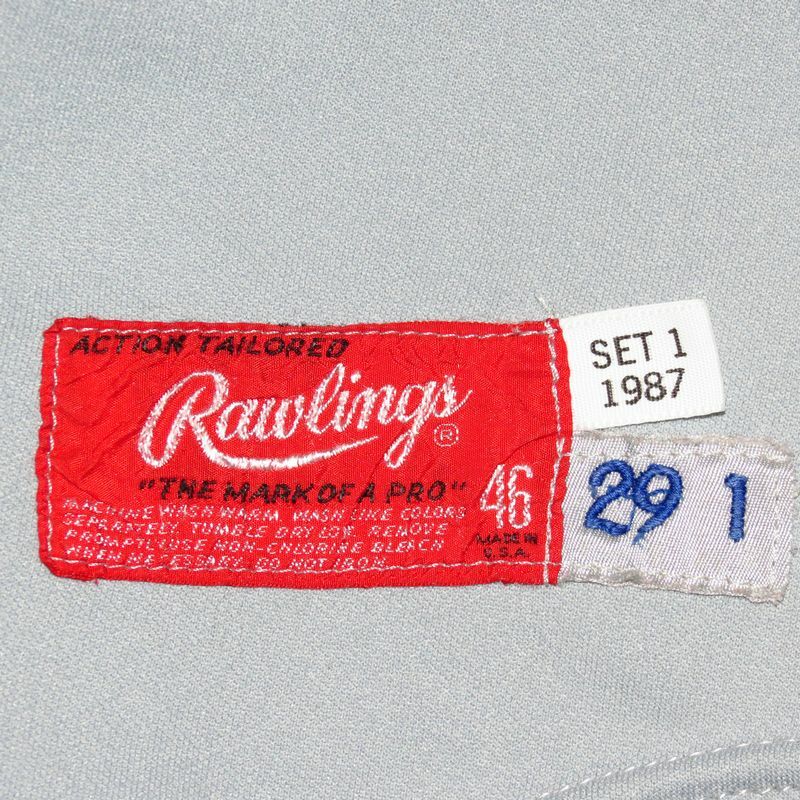 NOB is dropped in 1980. Two button style dropped in favor of full button-down. 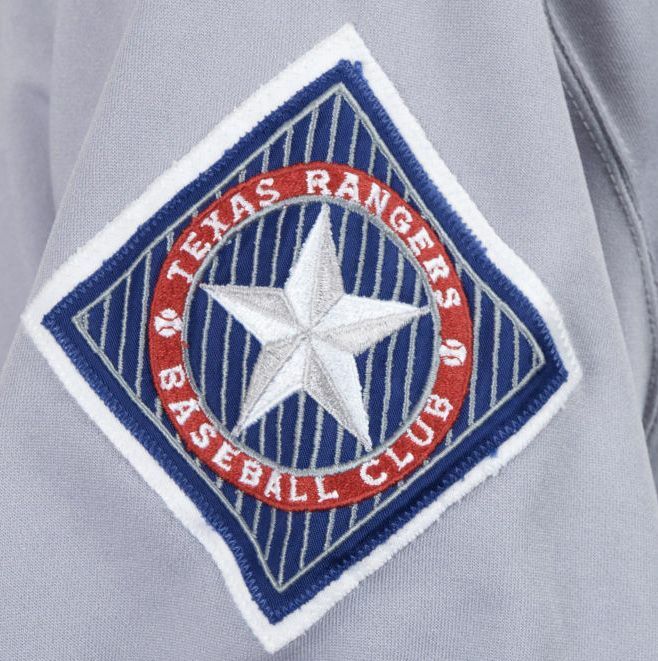 New sleeve patch. 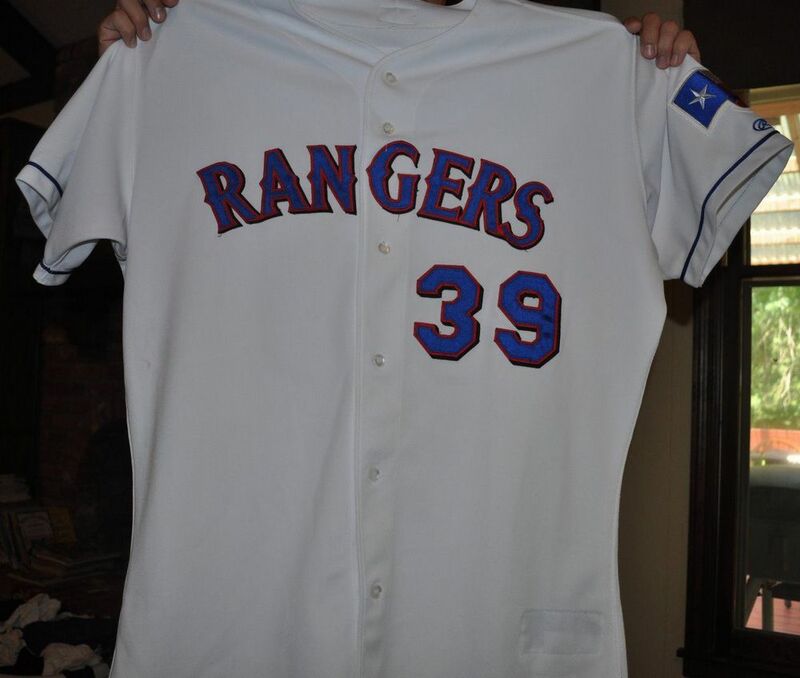 NOB returns. 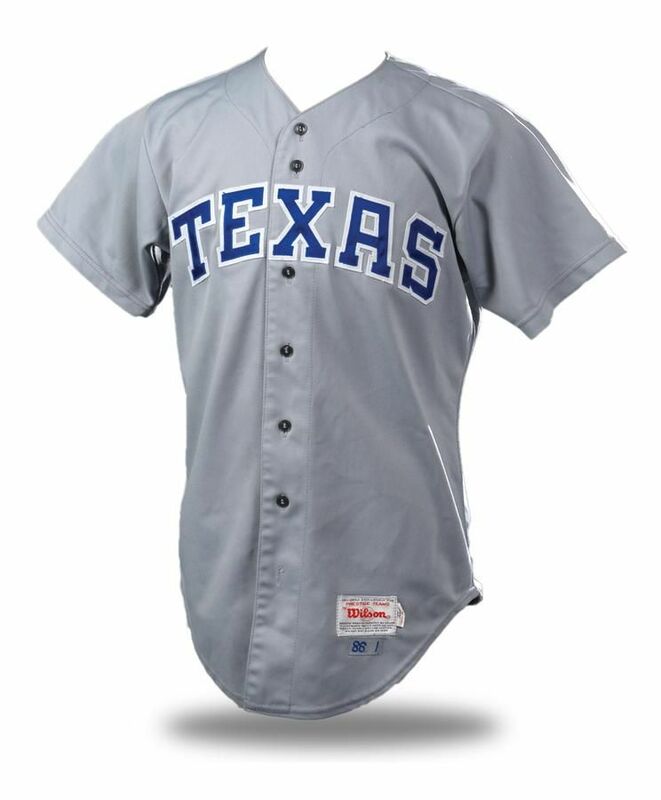 Another new, one-year style as the road jersey and cap turns to blue. 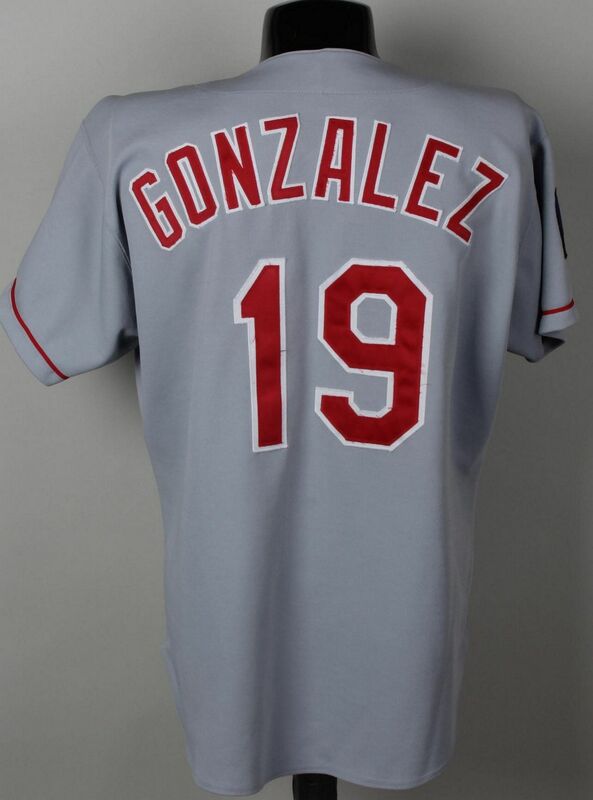 The wordmark becomes script and a red alternate debuts. 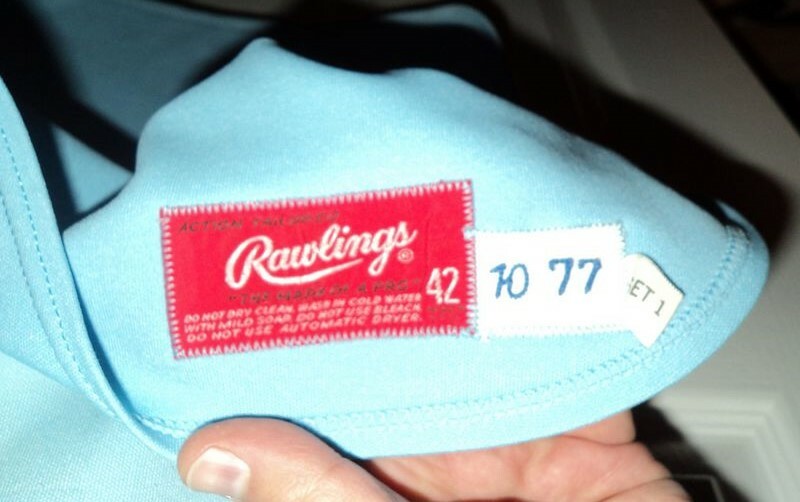 All-blue cap dropped. 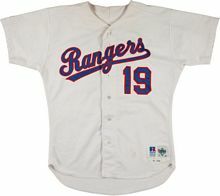 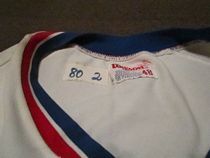 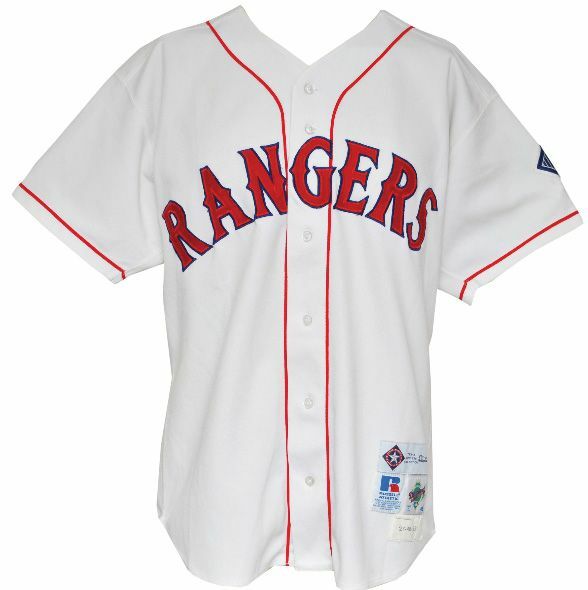 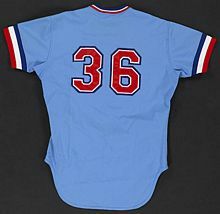 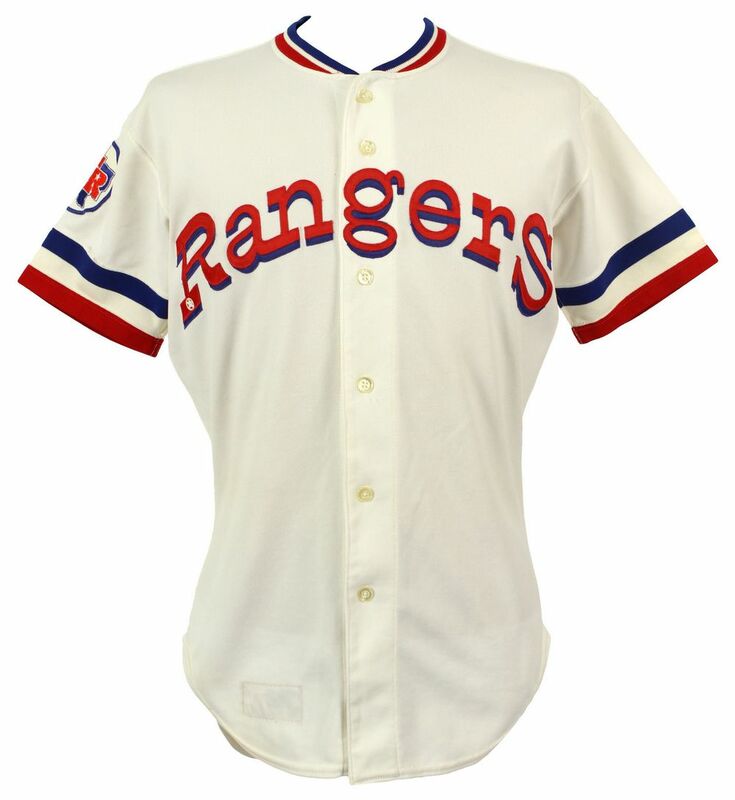 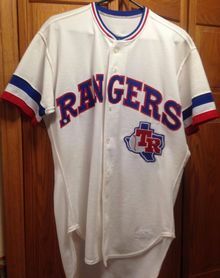 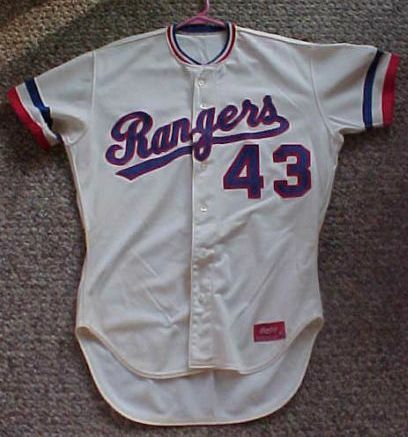 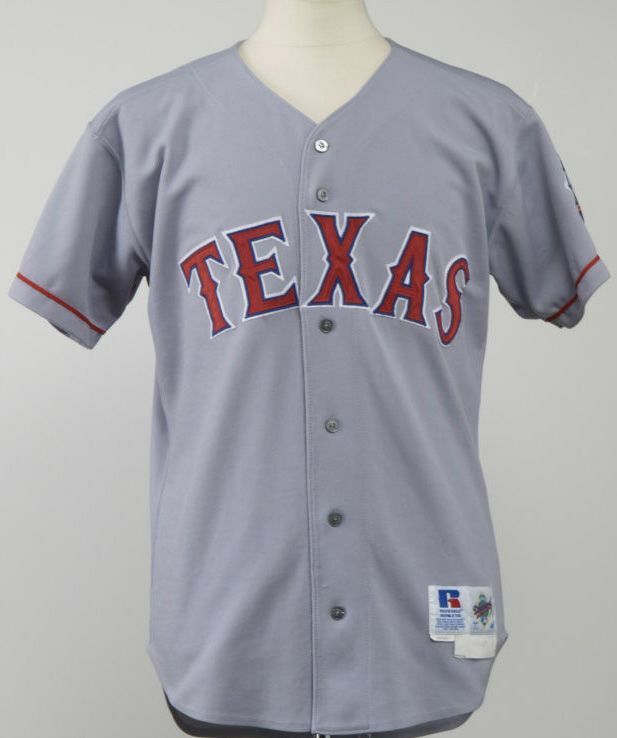 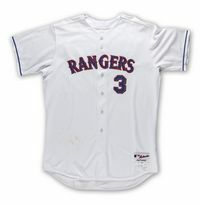 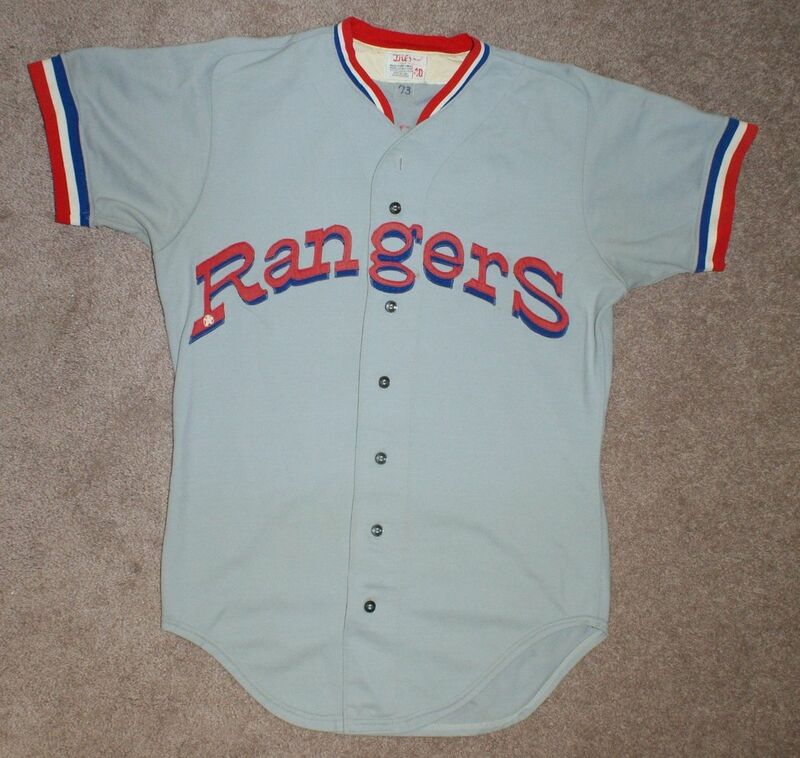 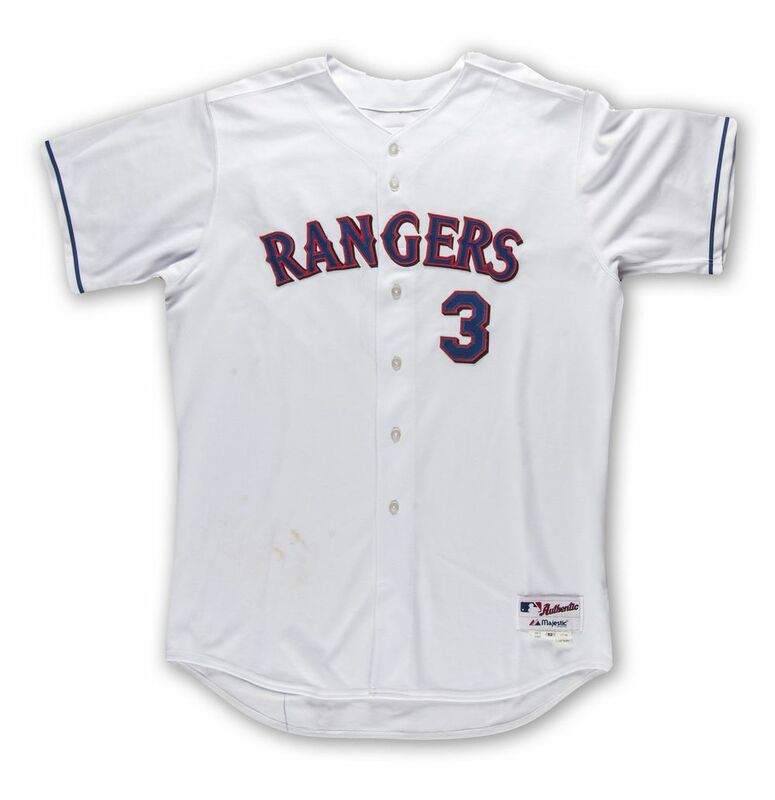 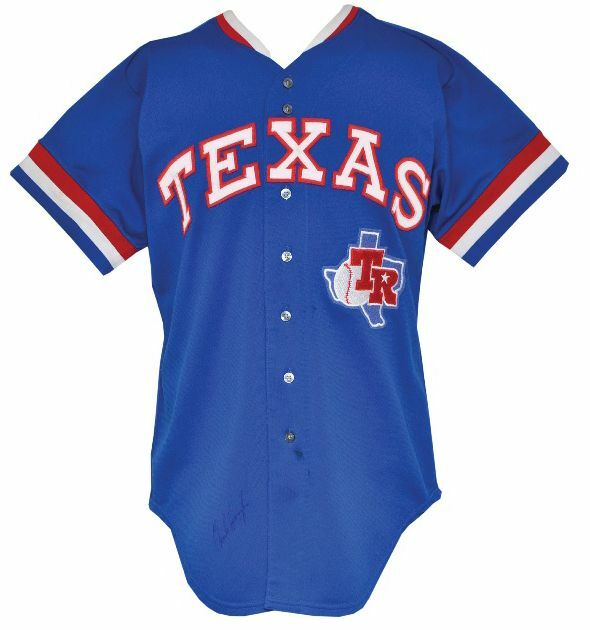 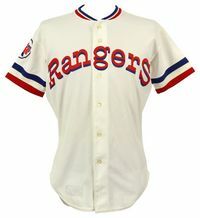 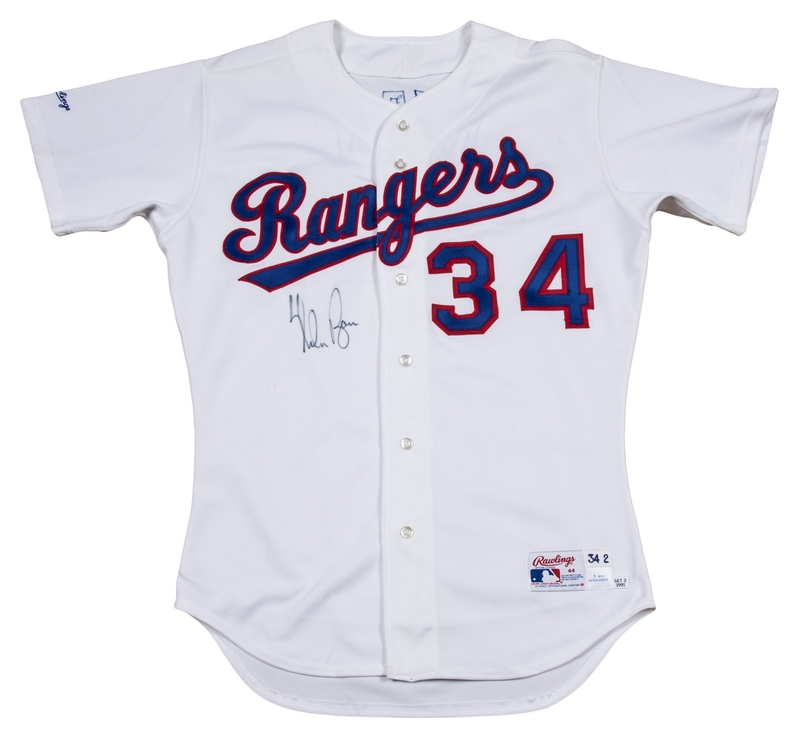 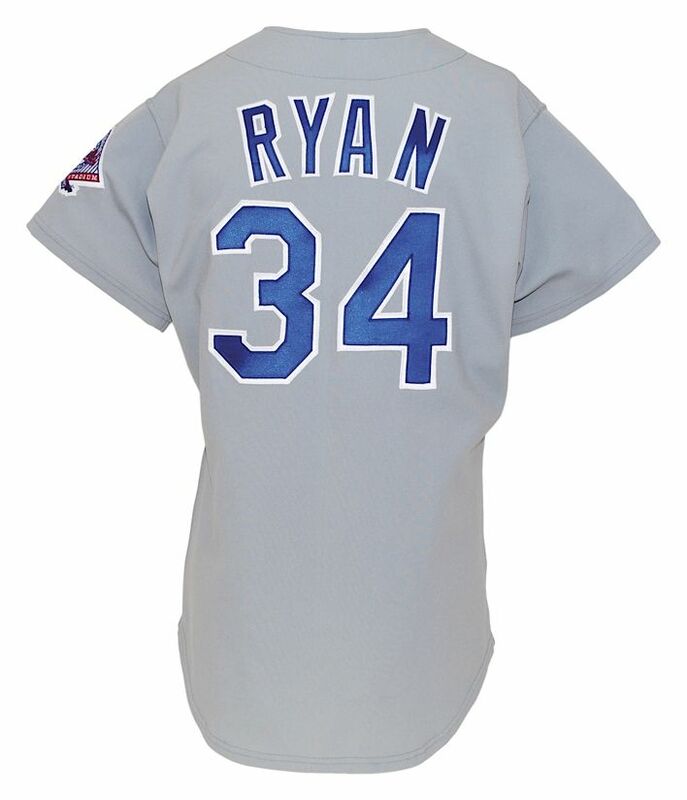 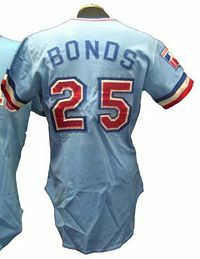 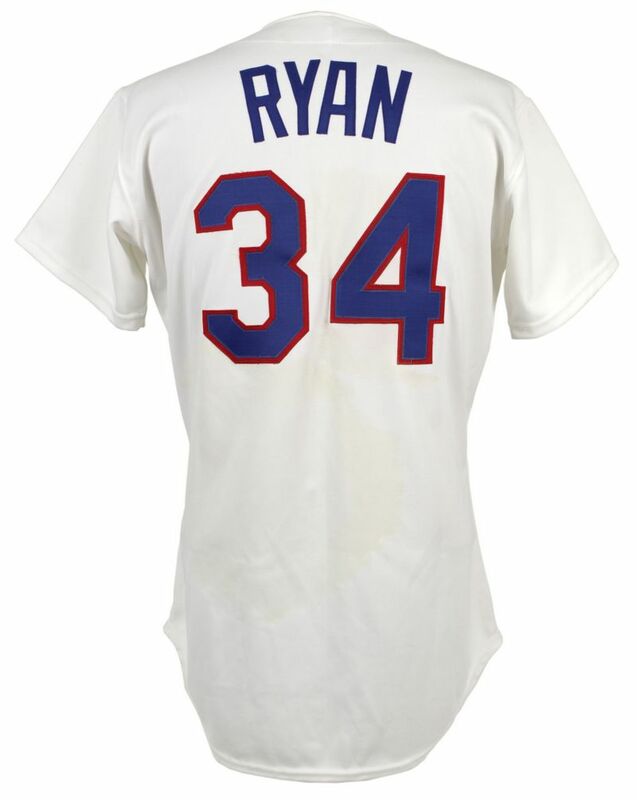 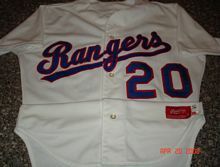 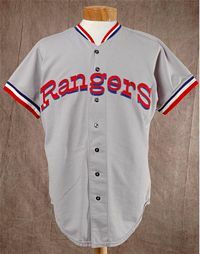 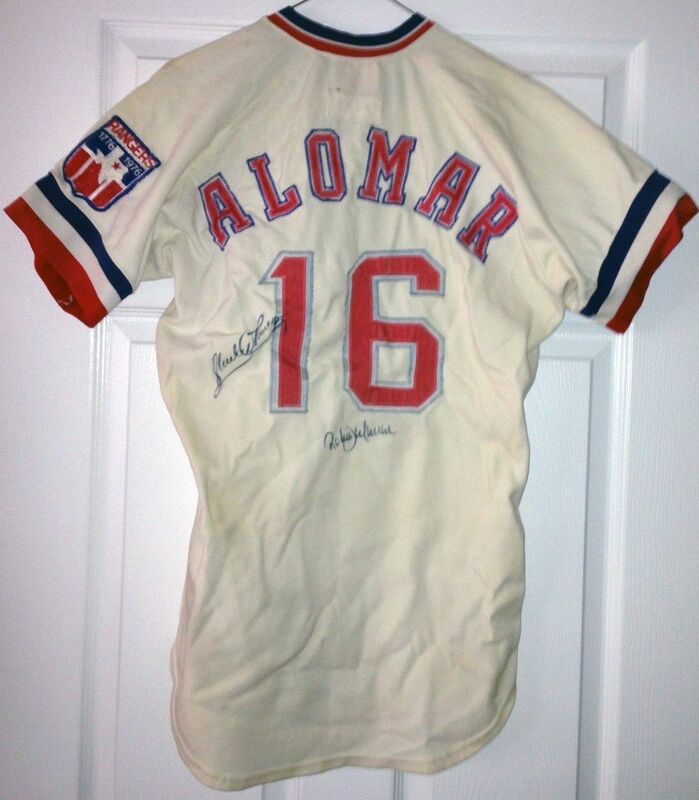 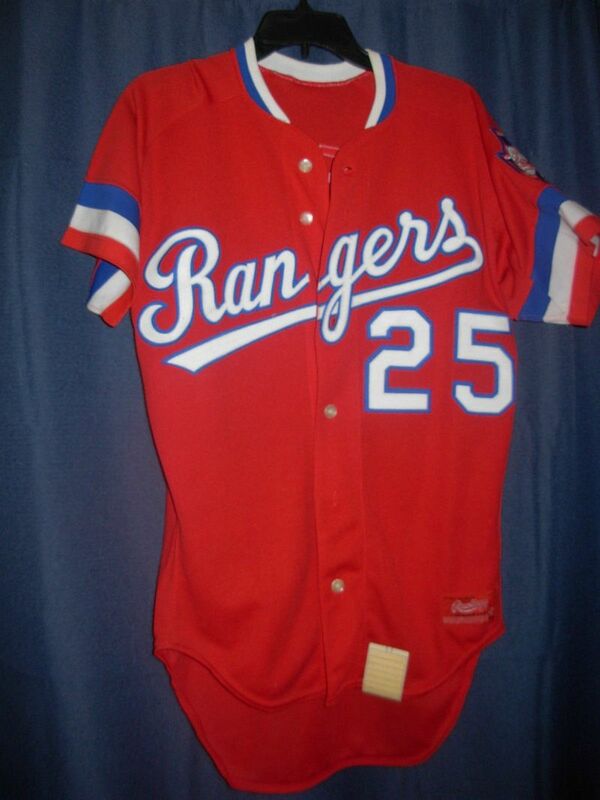 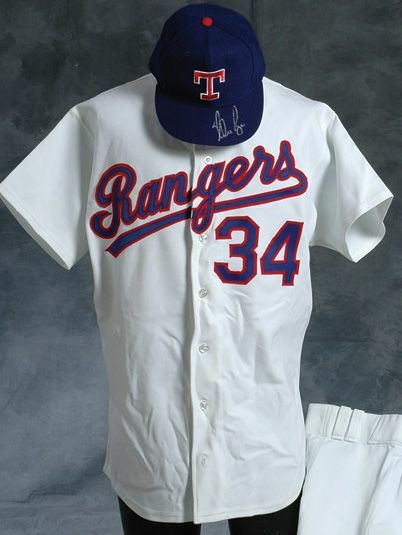 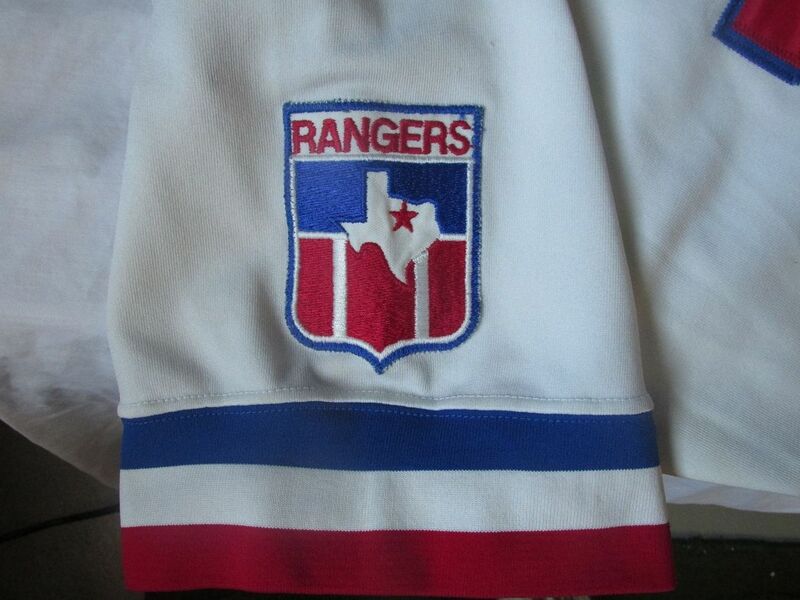 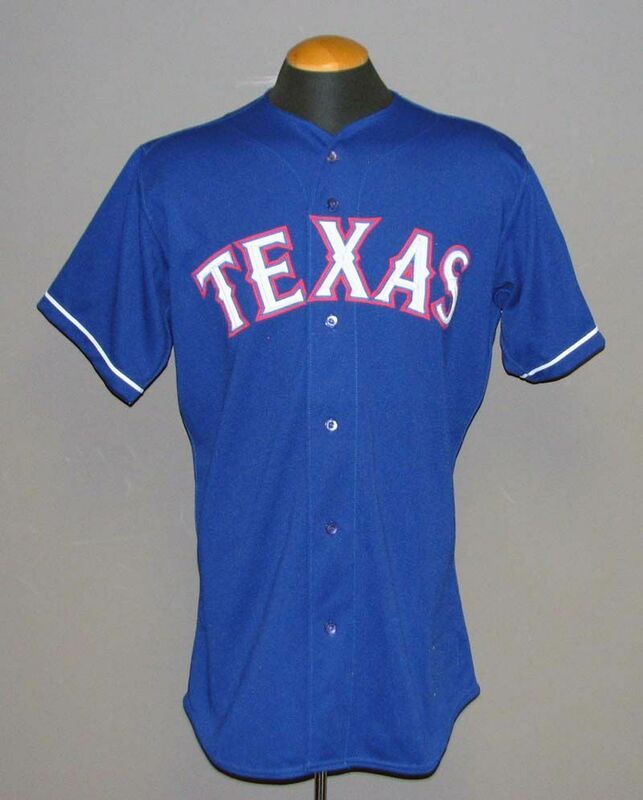 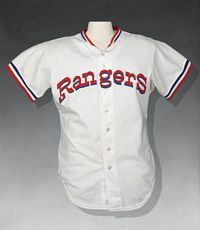 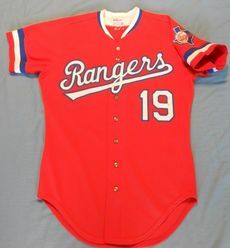 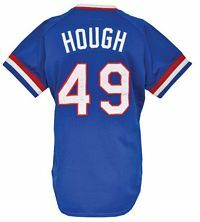 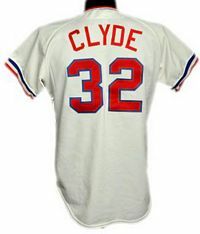 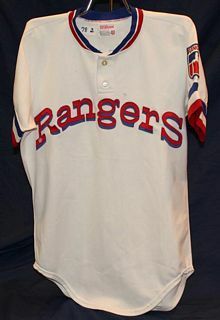 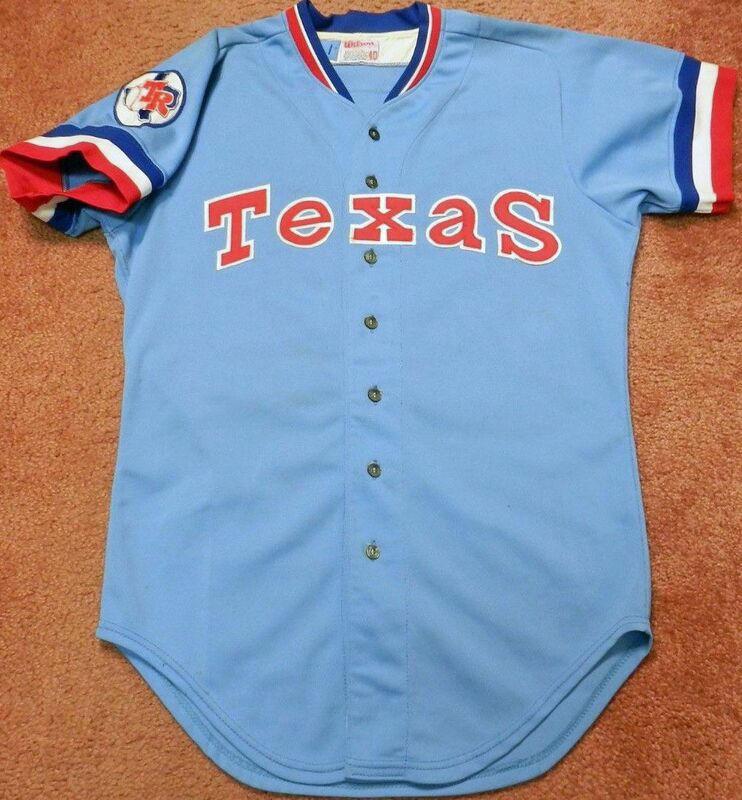 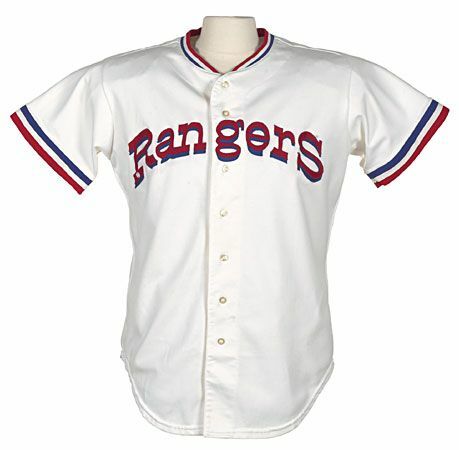 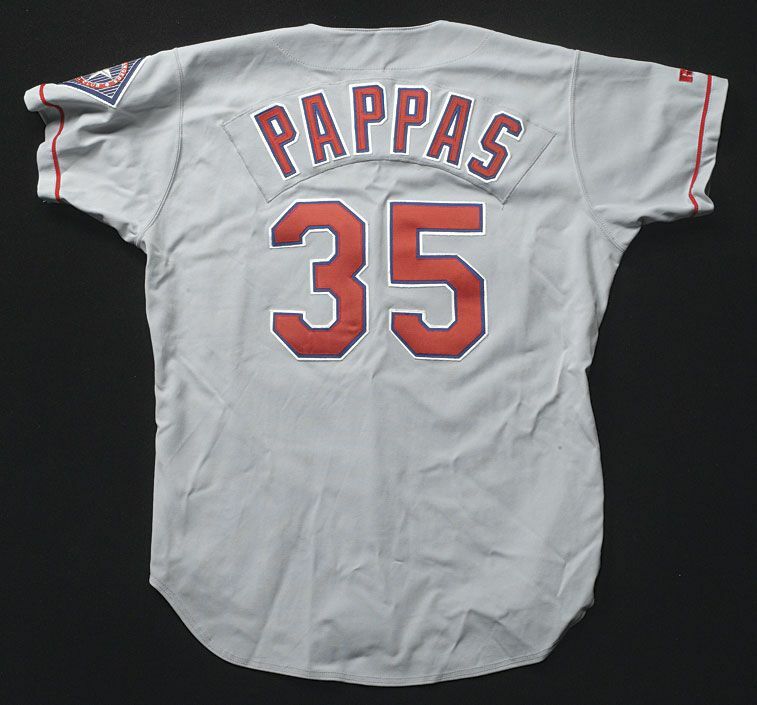 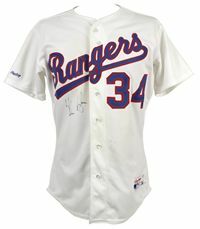 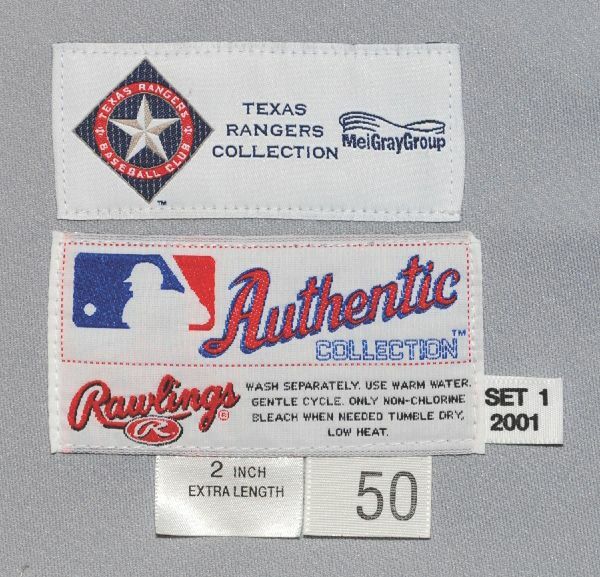 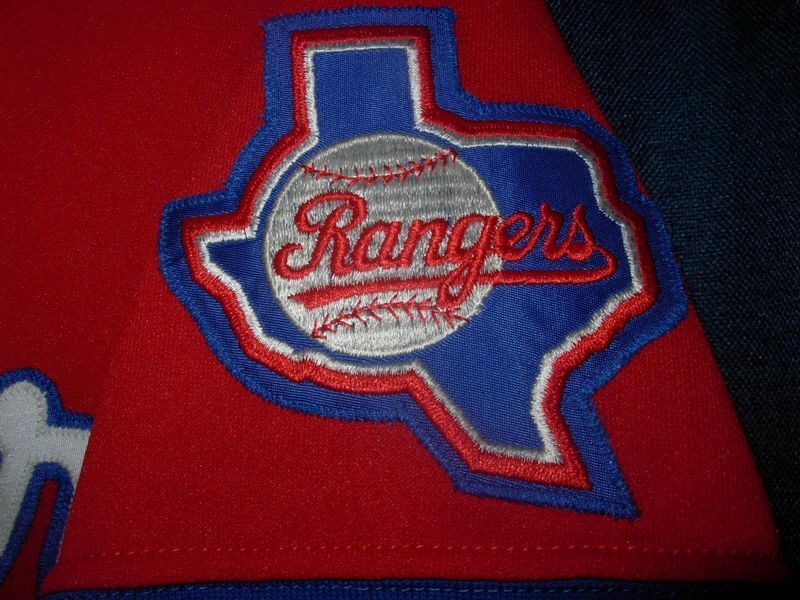 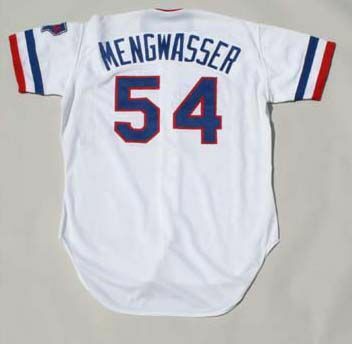 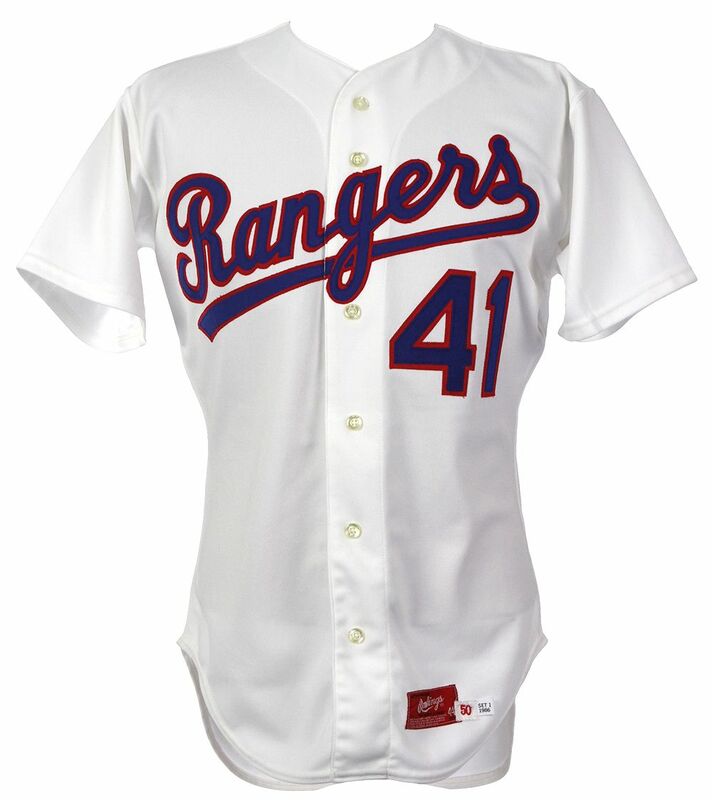 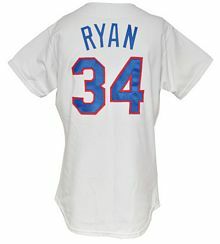 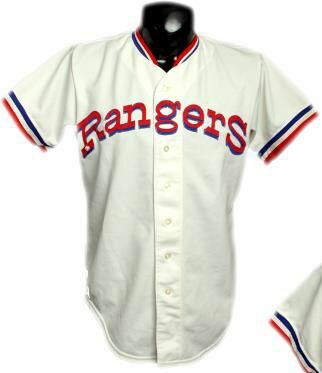 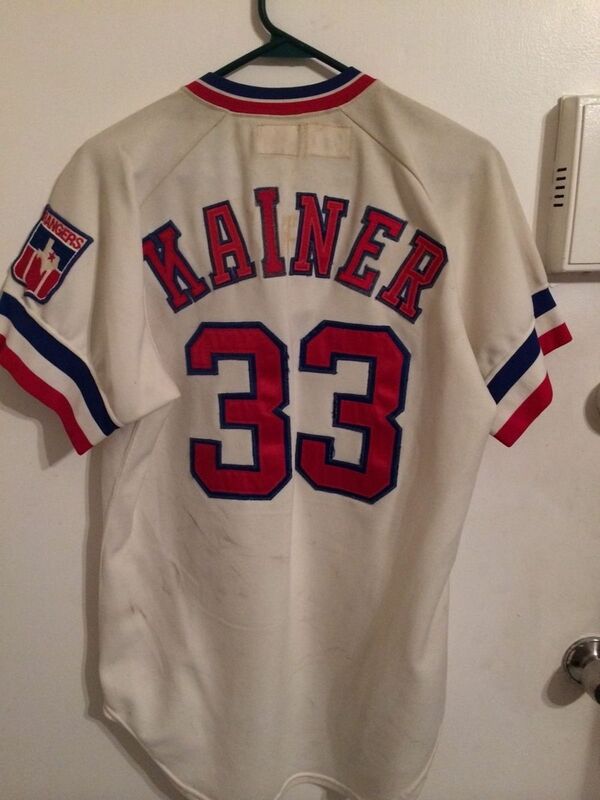 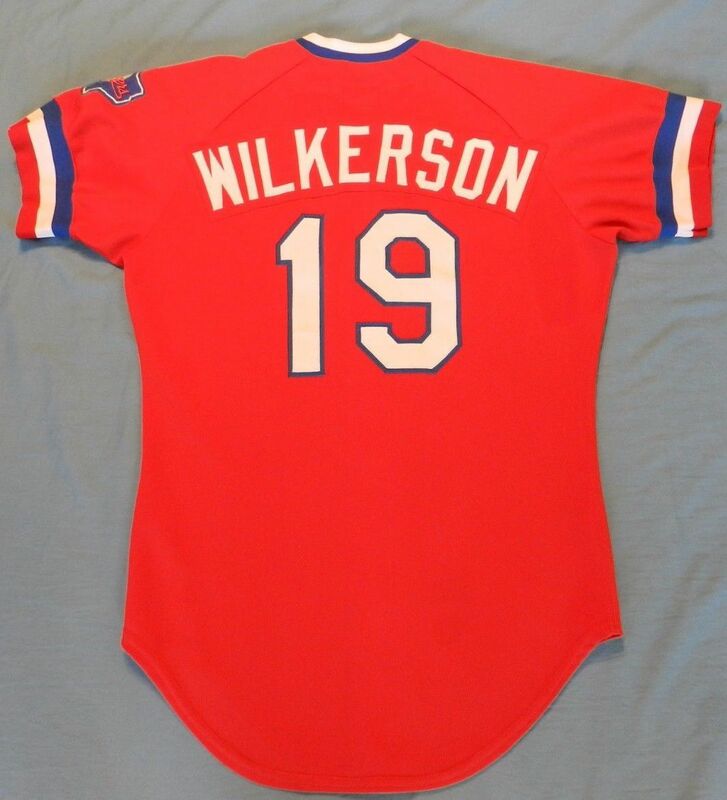 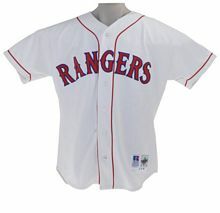 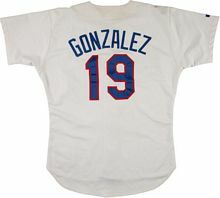 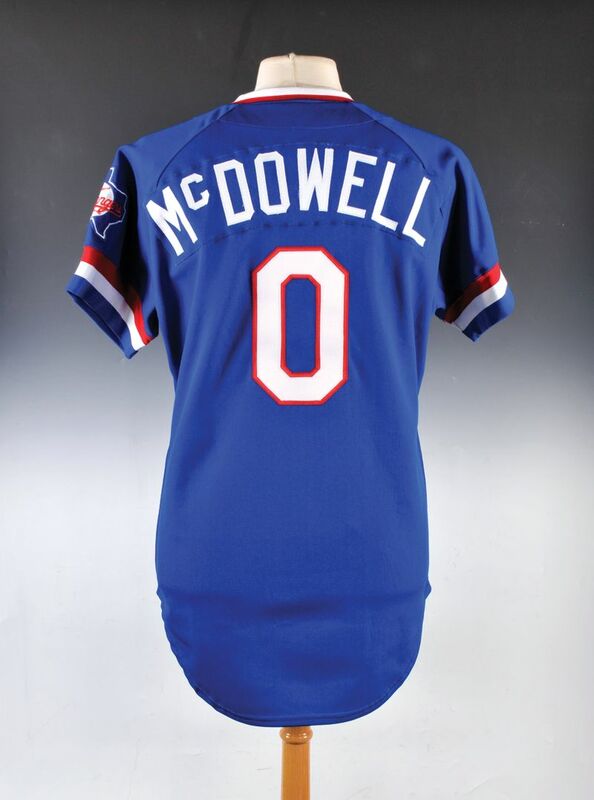 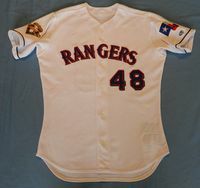 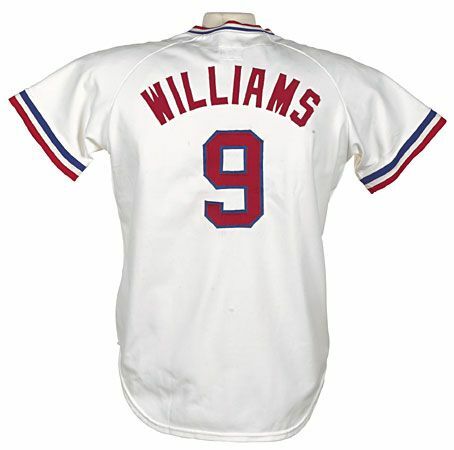 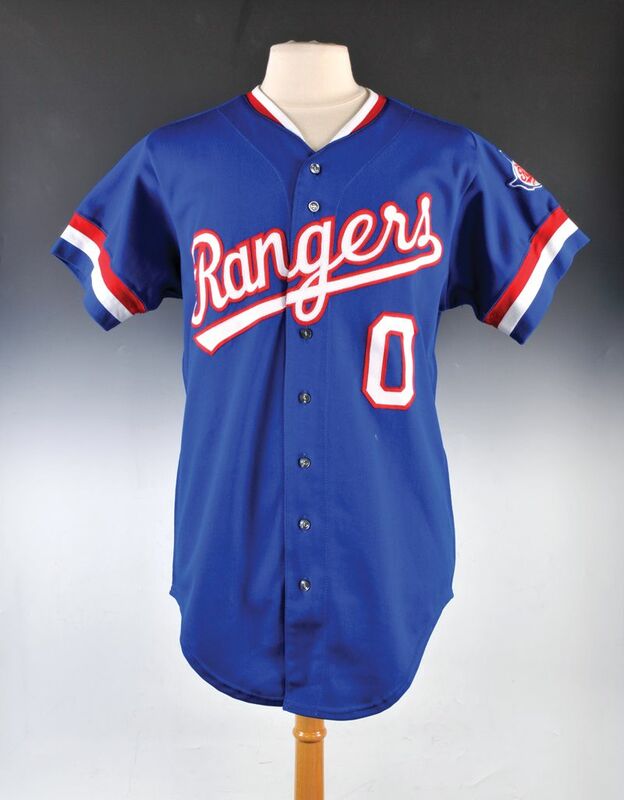 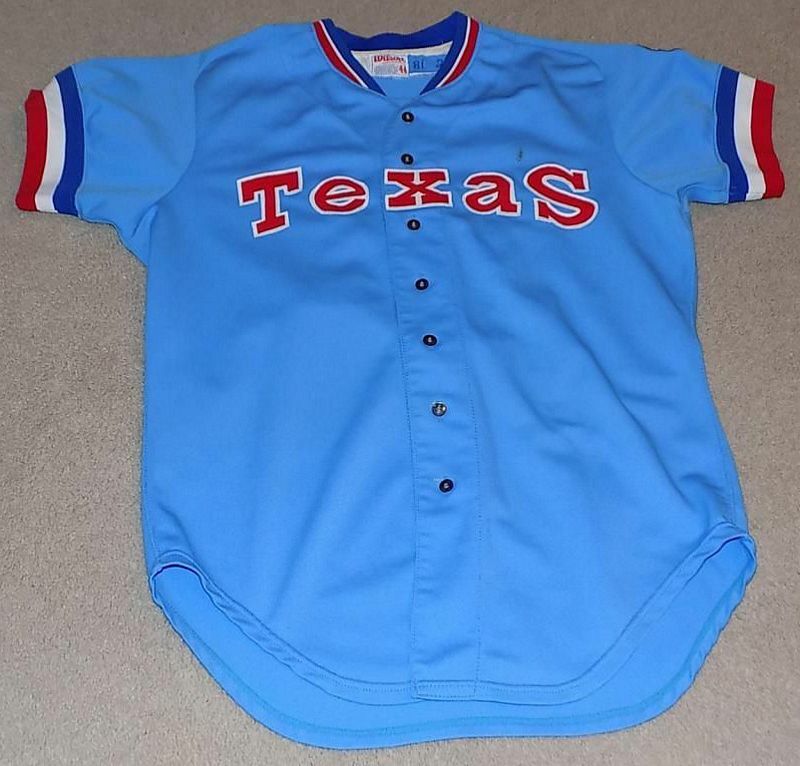 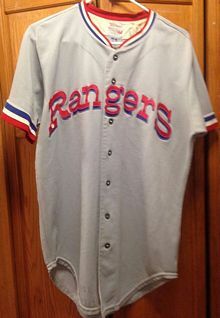 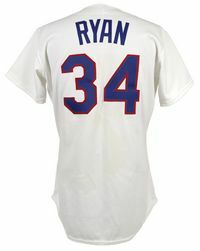 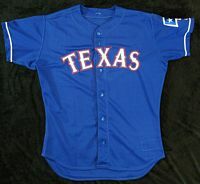 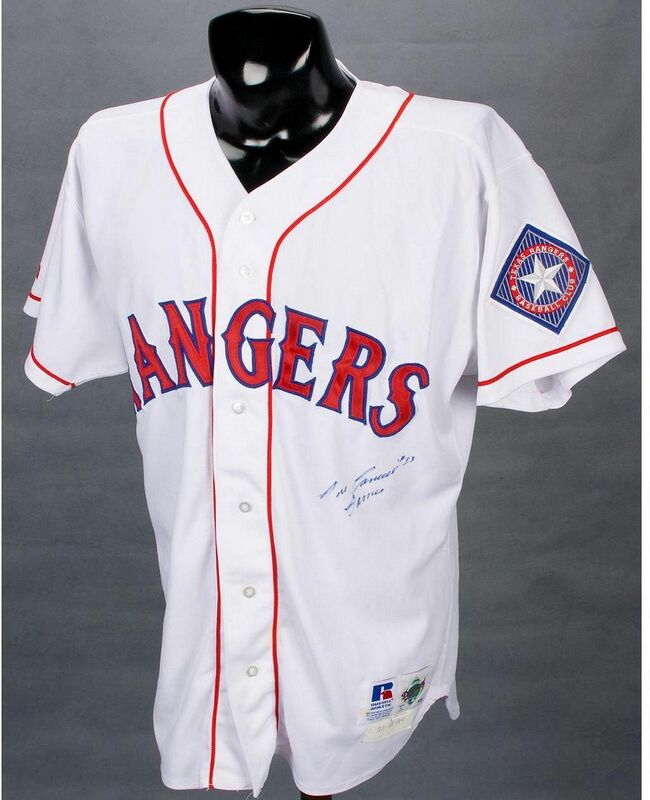 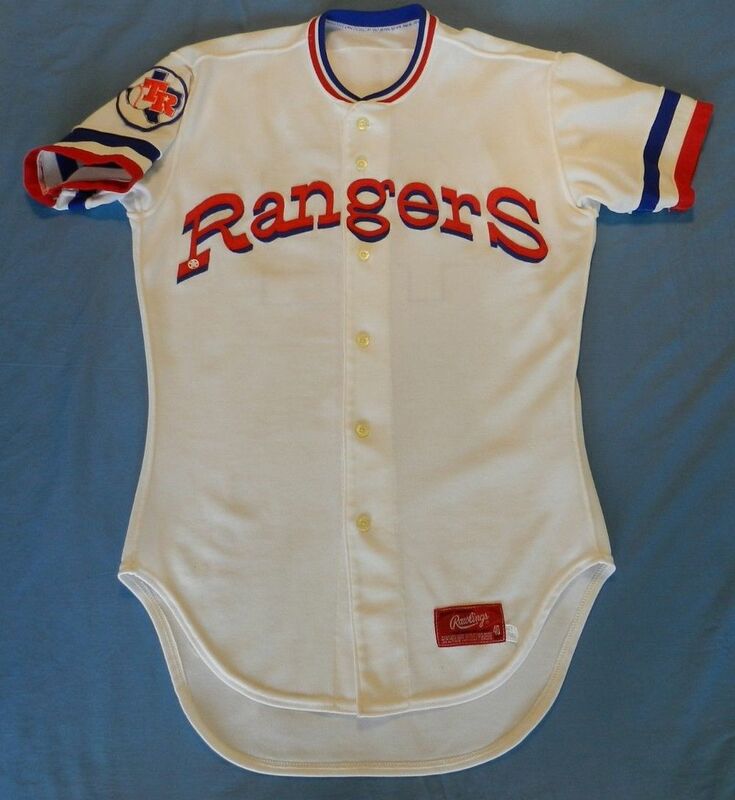 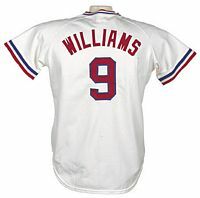 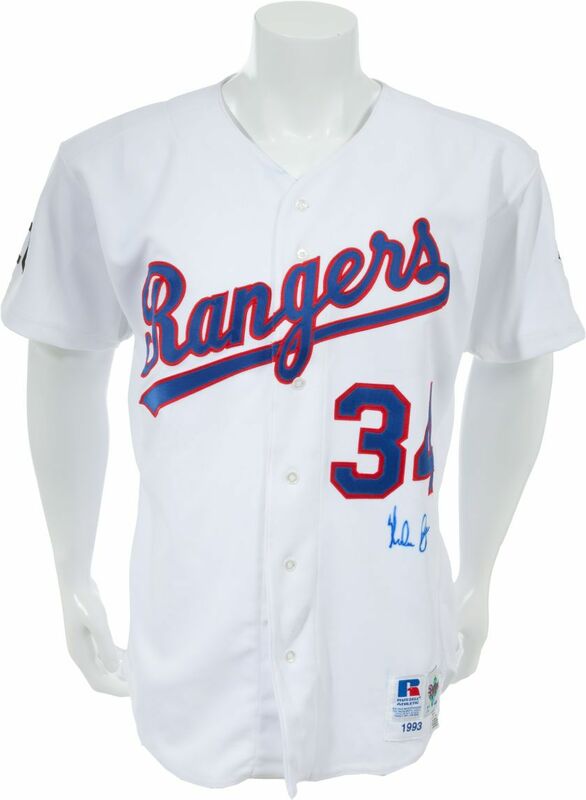 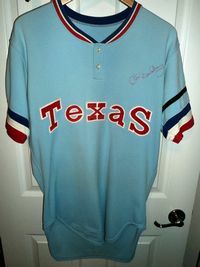 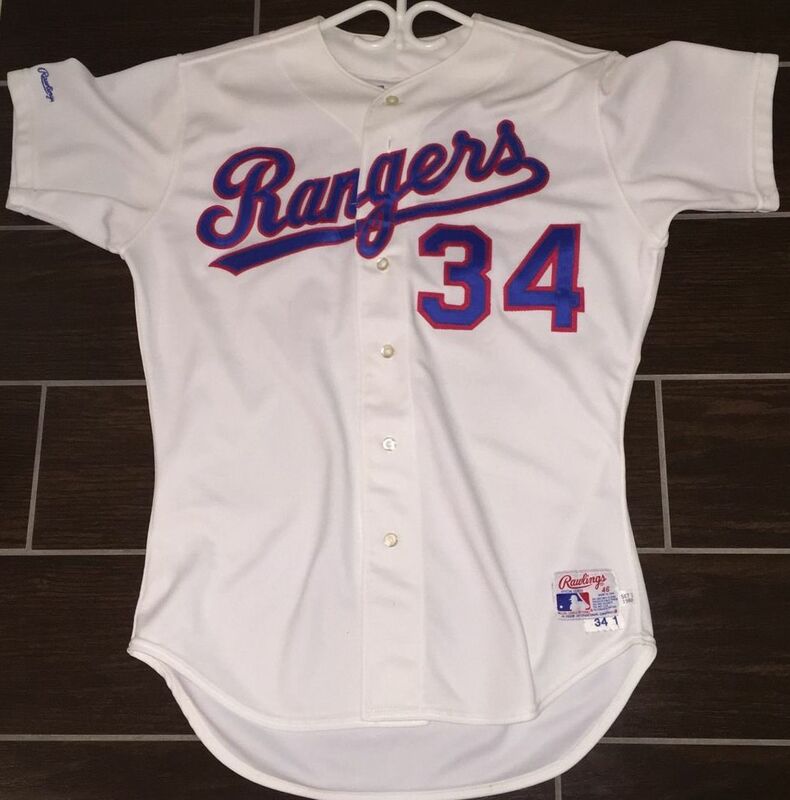 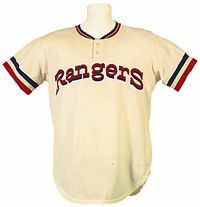 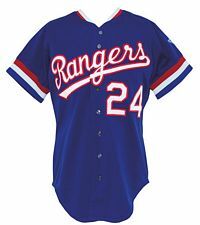 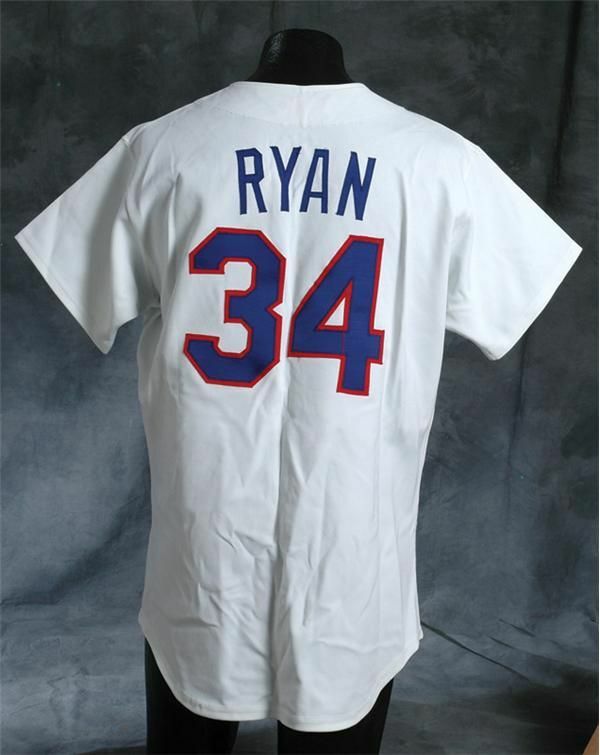 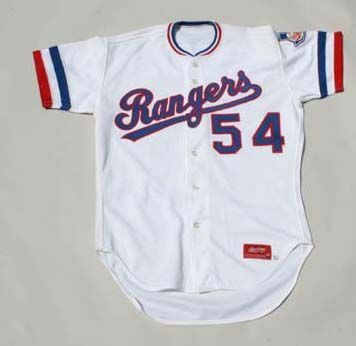 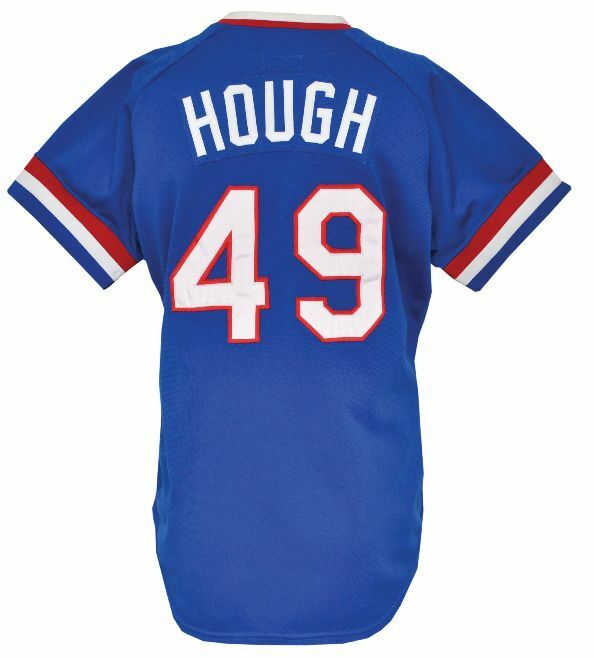 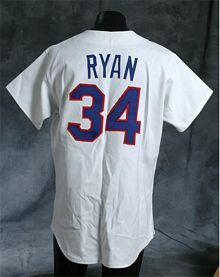 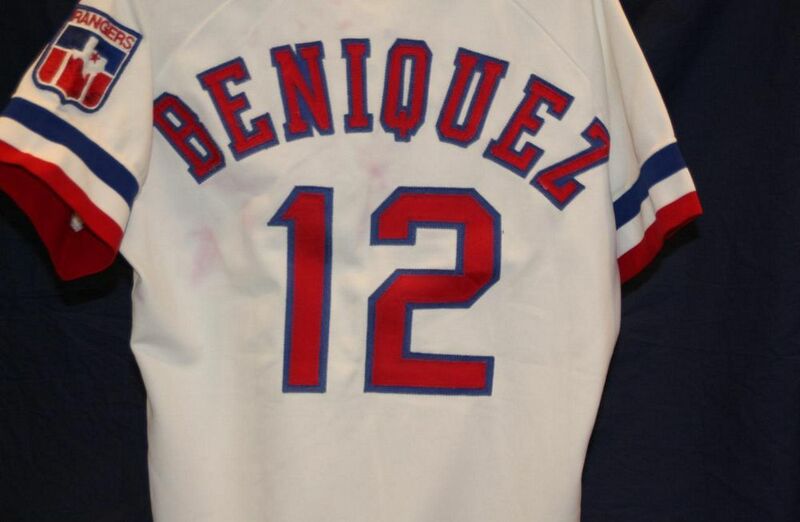 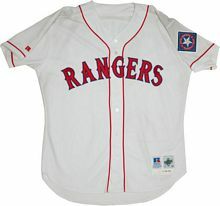 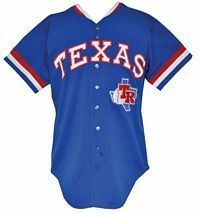 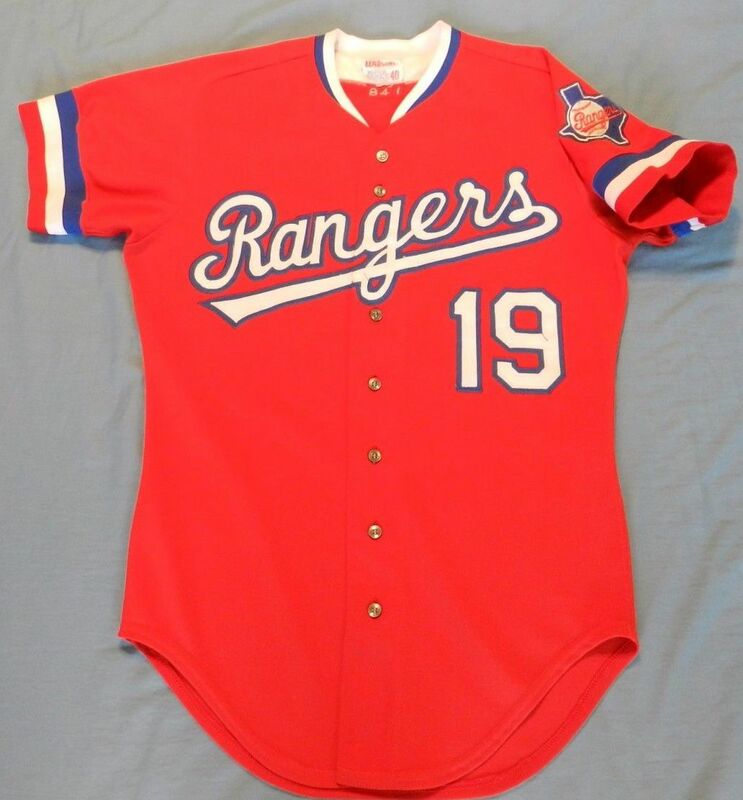 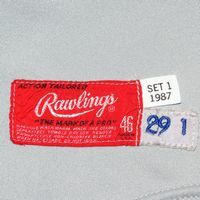 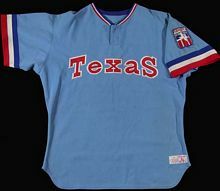 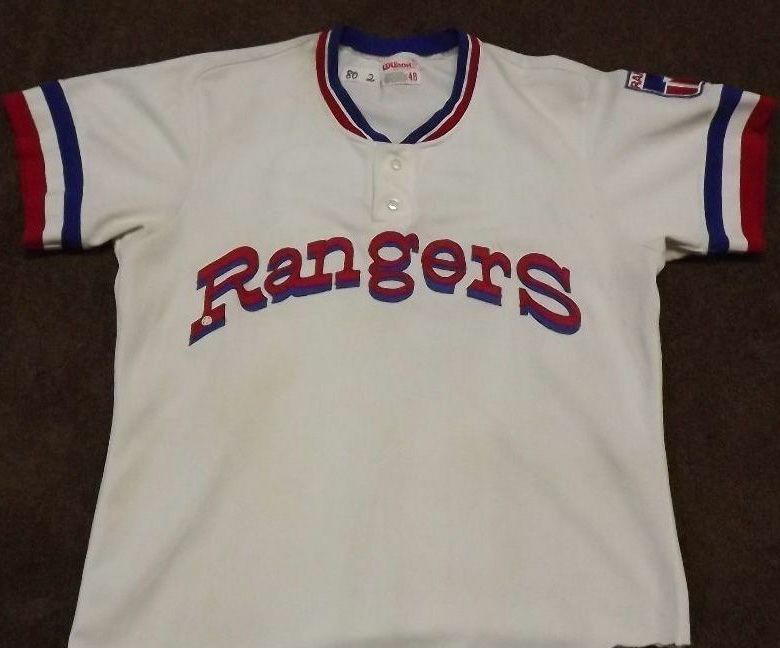 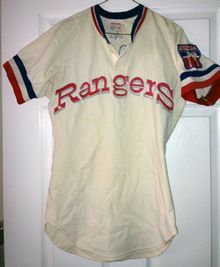 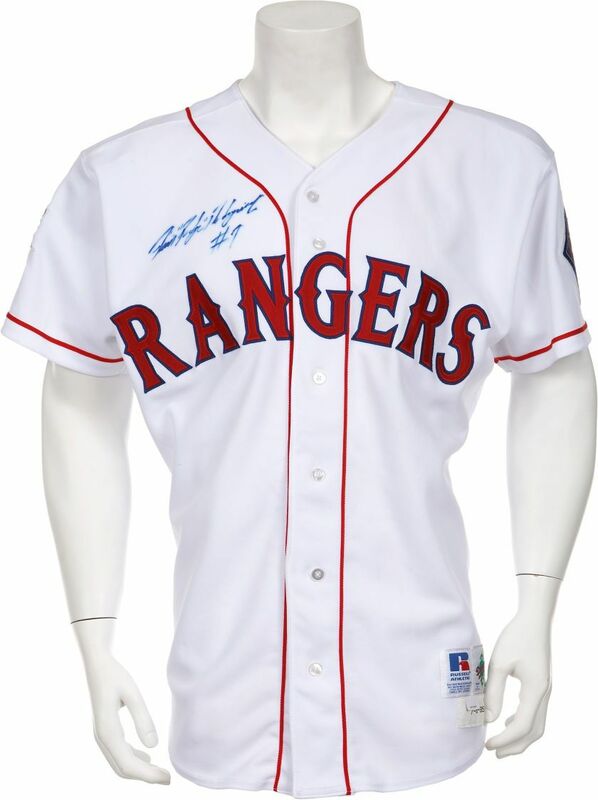 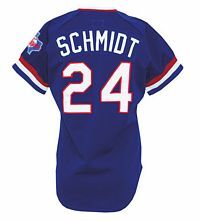 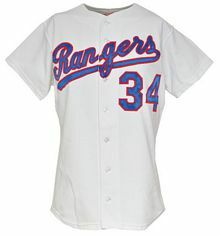 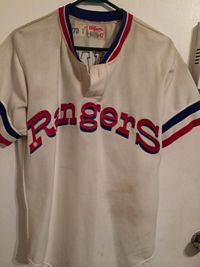 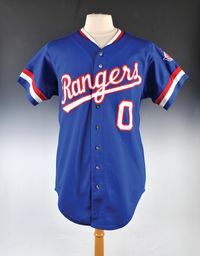 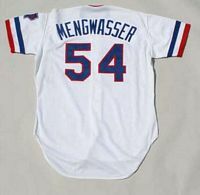 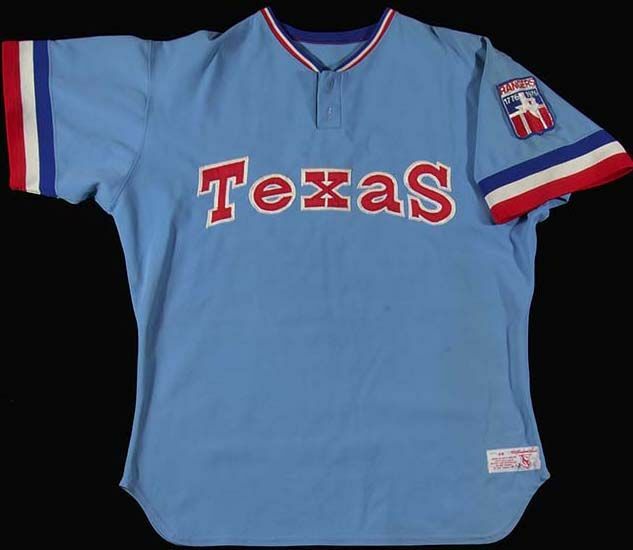 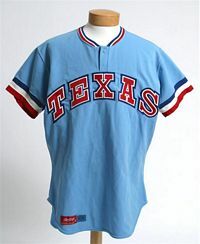 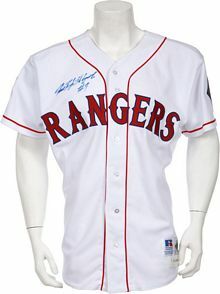 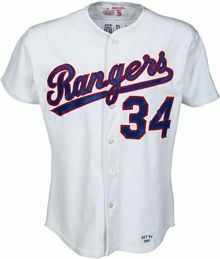 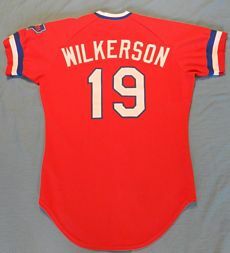 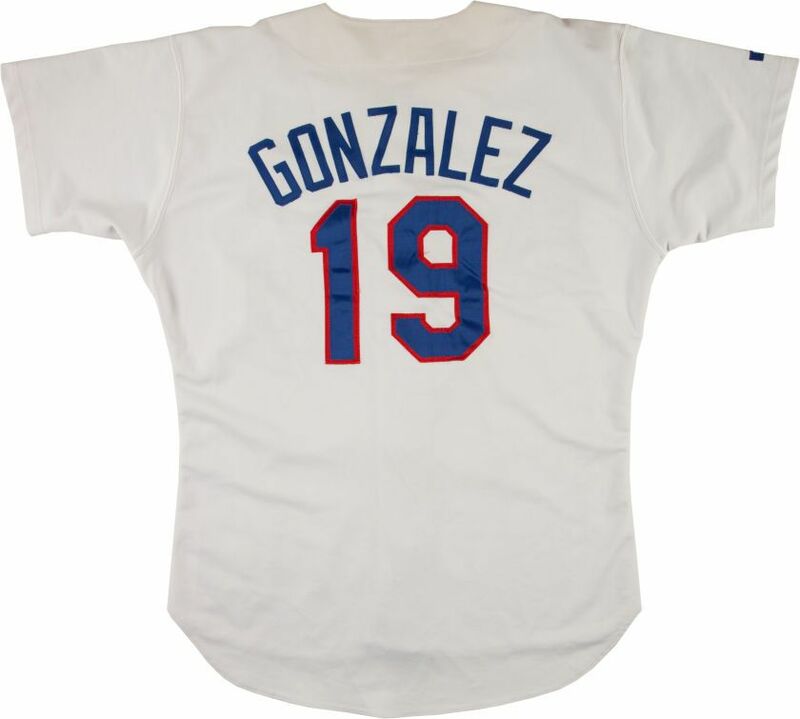 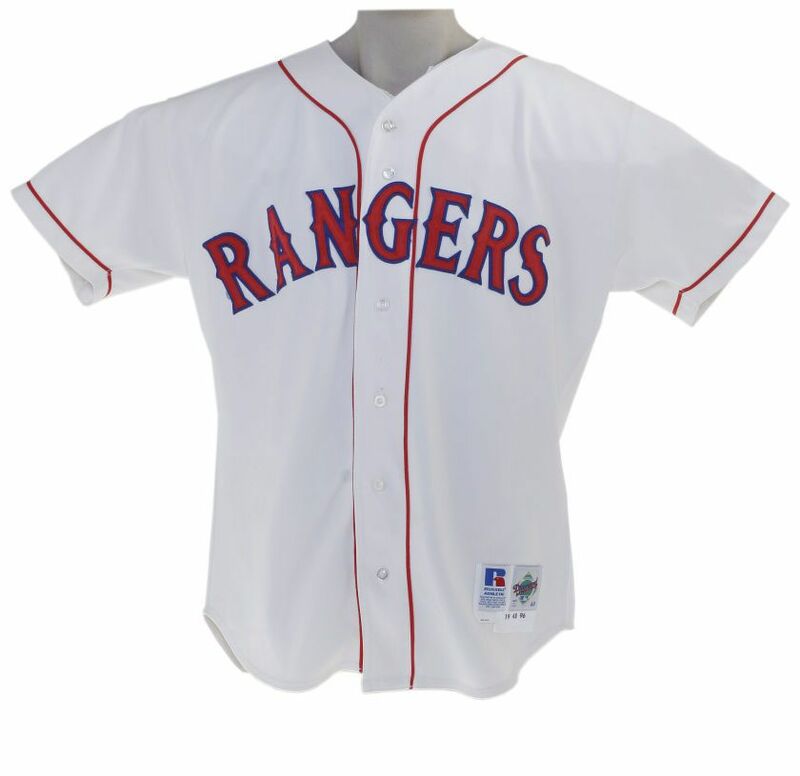 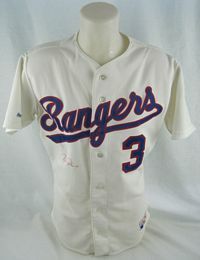 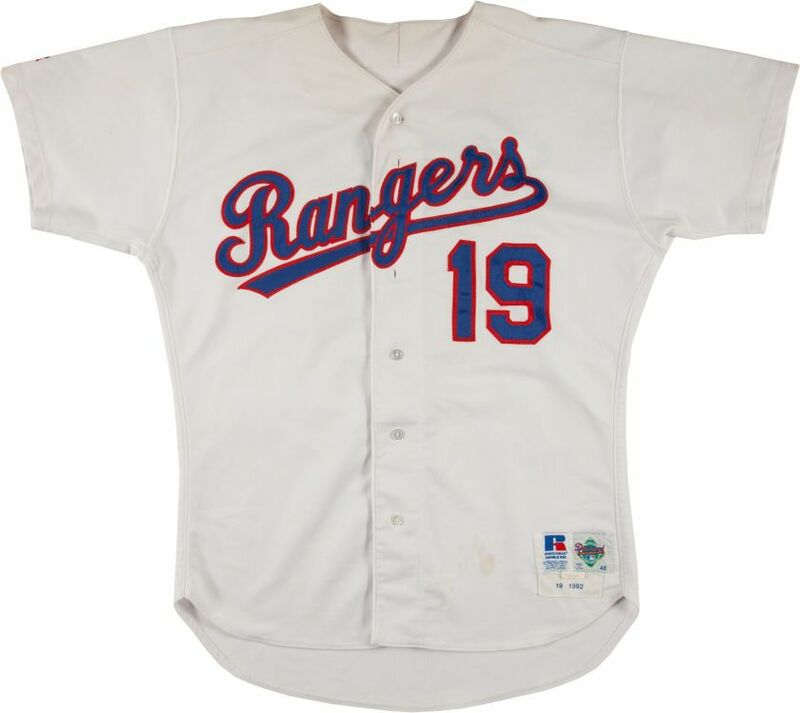 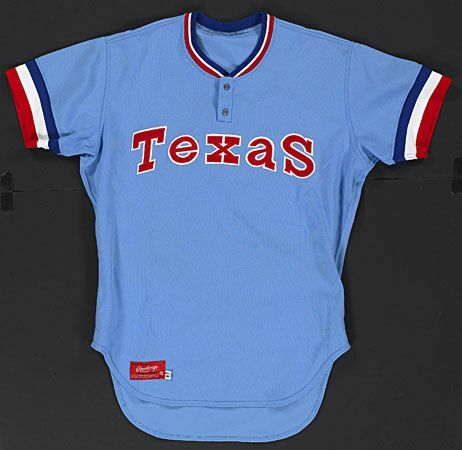 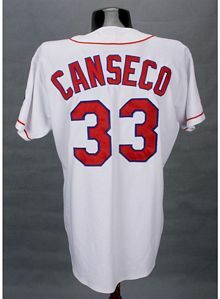 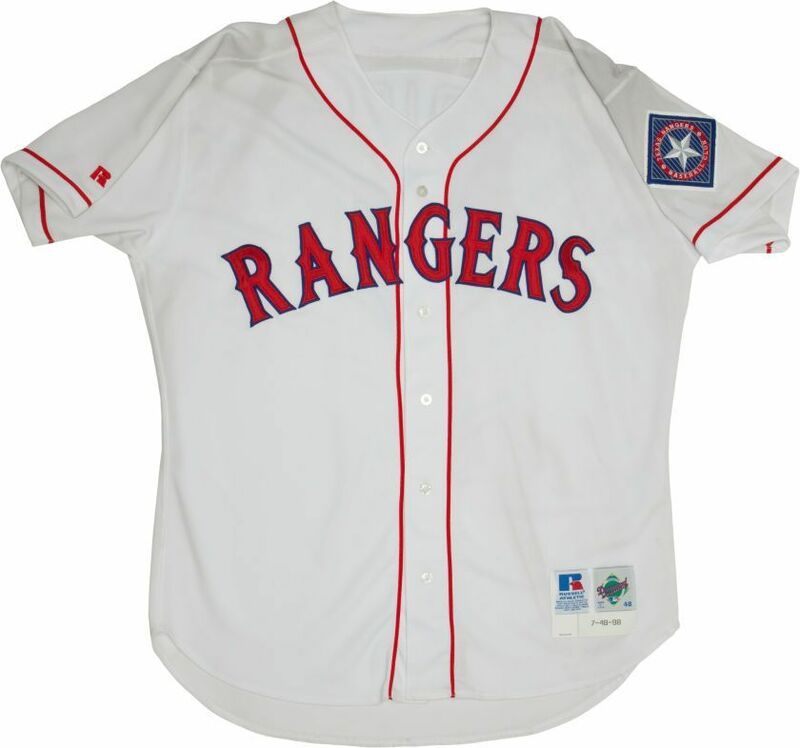 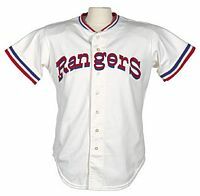 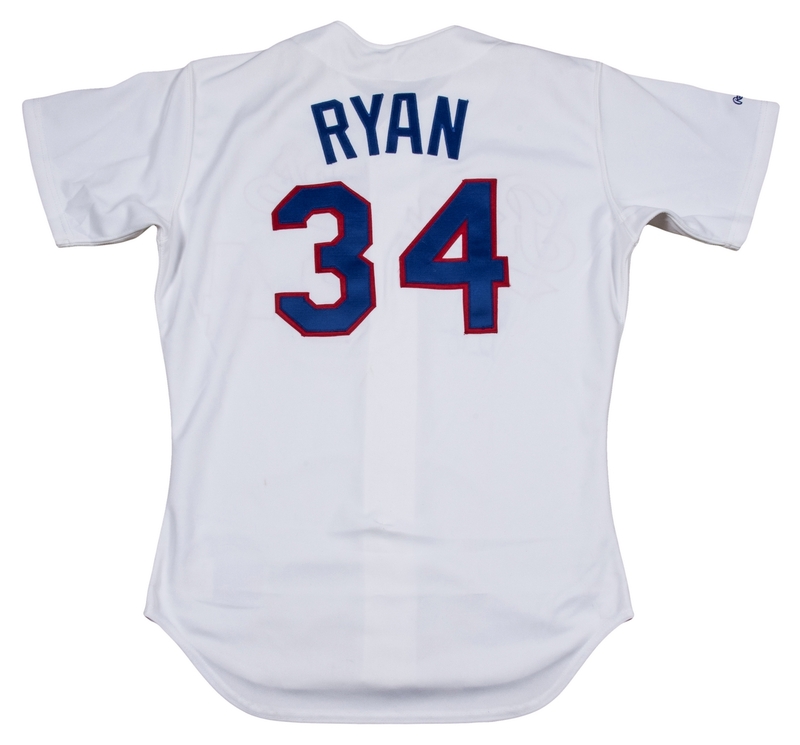 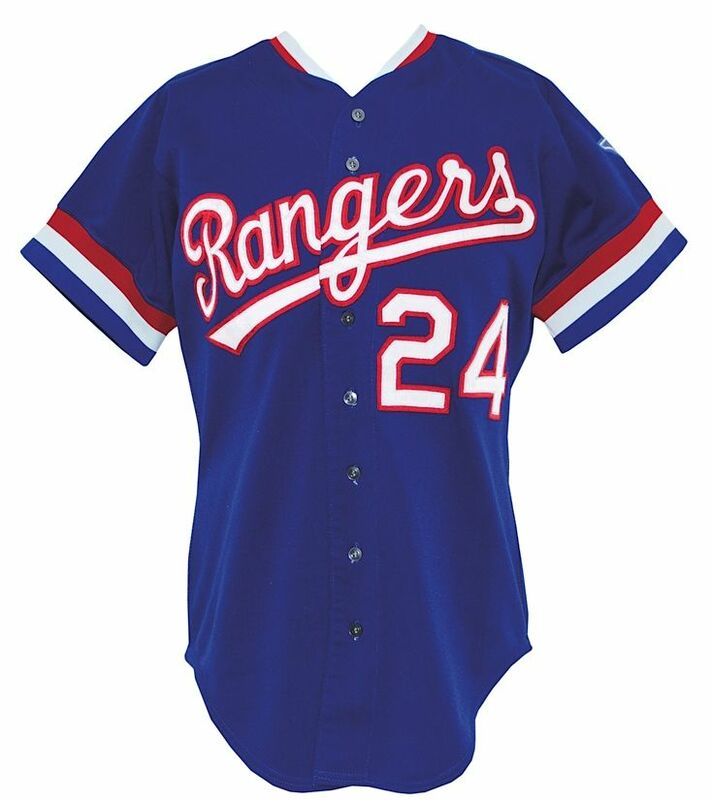 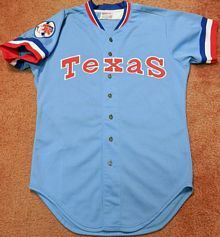 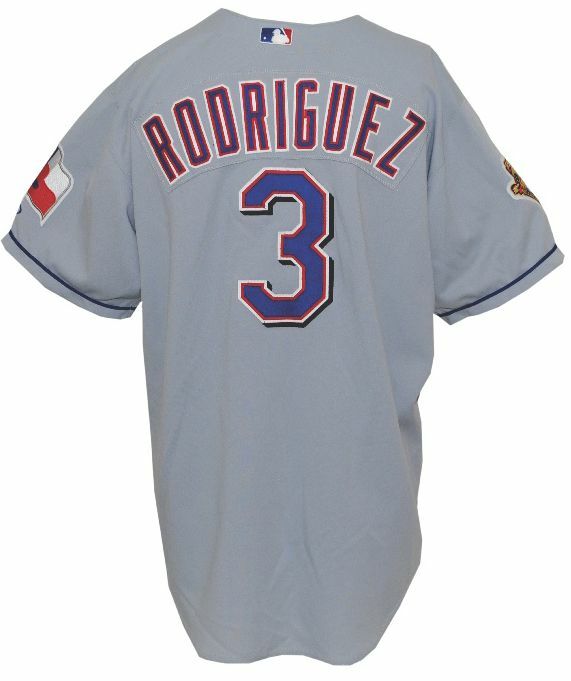 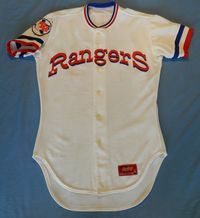 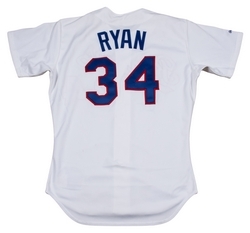 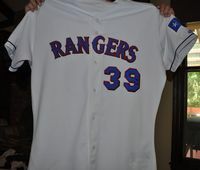 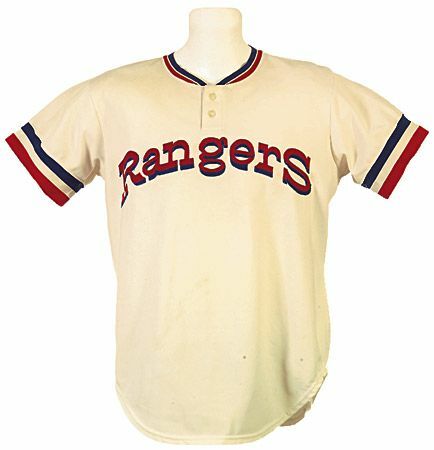 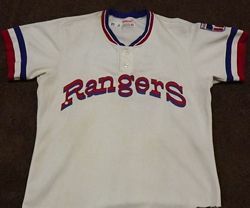 Towards the end of the 1985 season the Rangers debut their 1986 road jerseys. 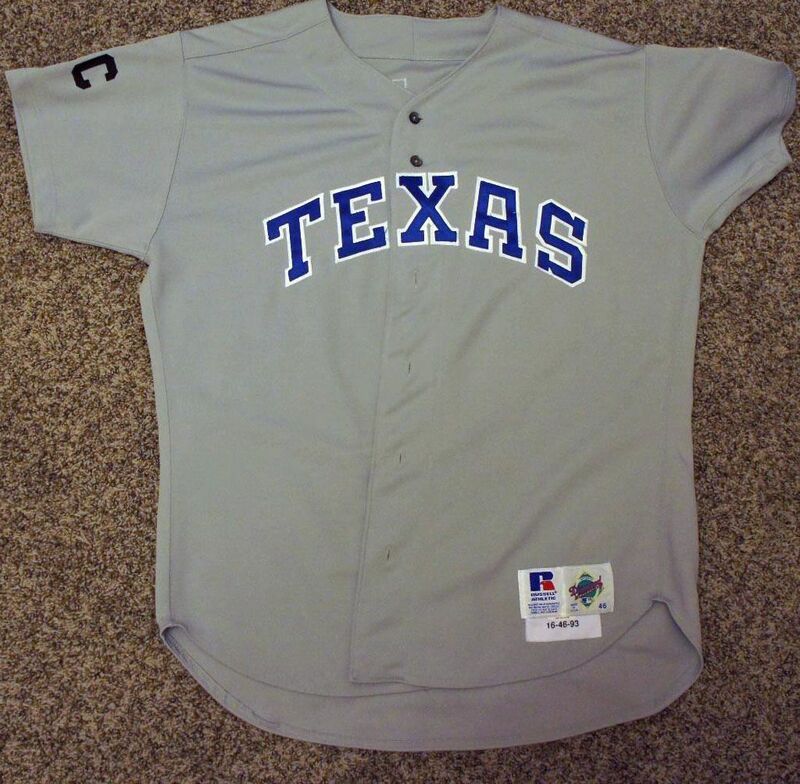 Sleeve and collar trim are dropped, alternate jersey dropped, road jersey becomes grey. 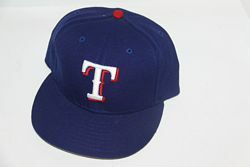 The all-blue cap returns and the blue-red cap is dropped. 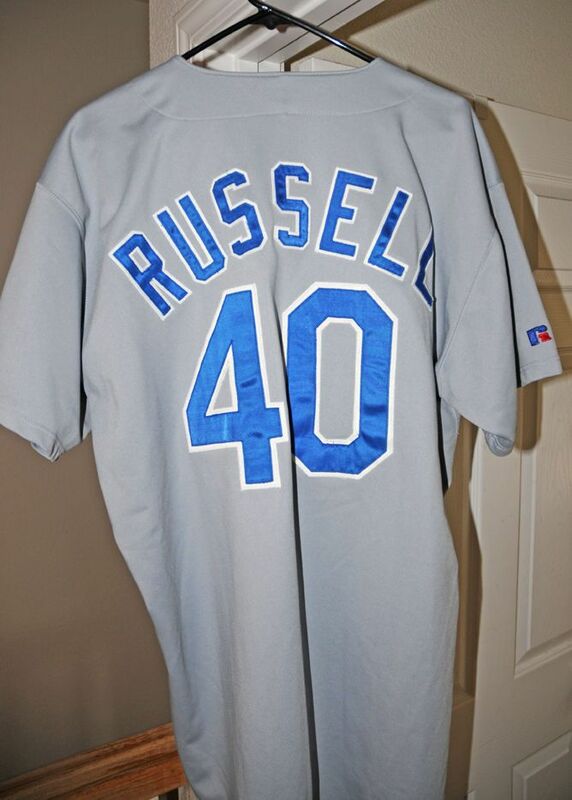 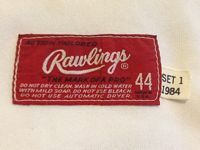 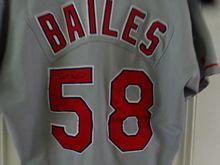 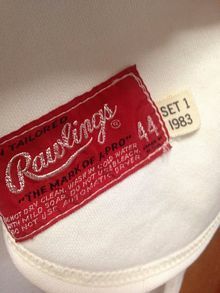 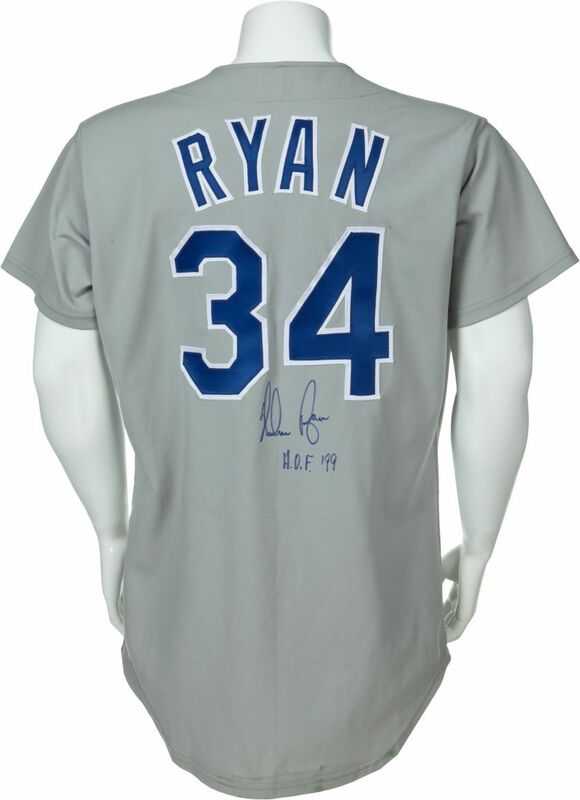 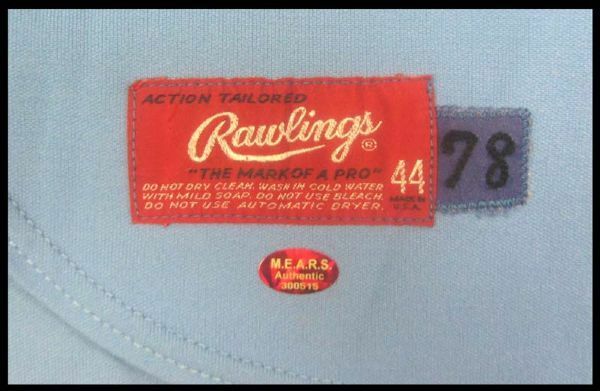 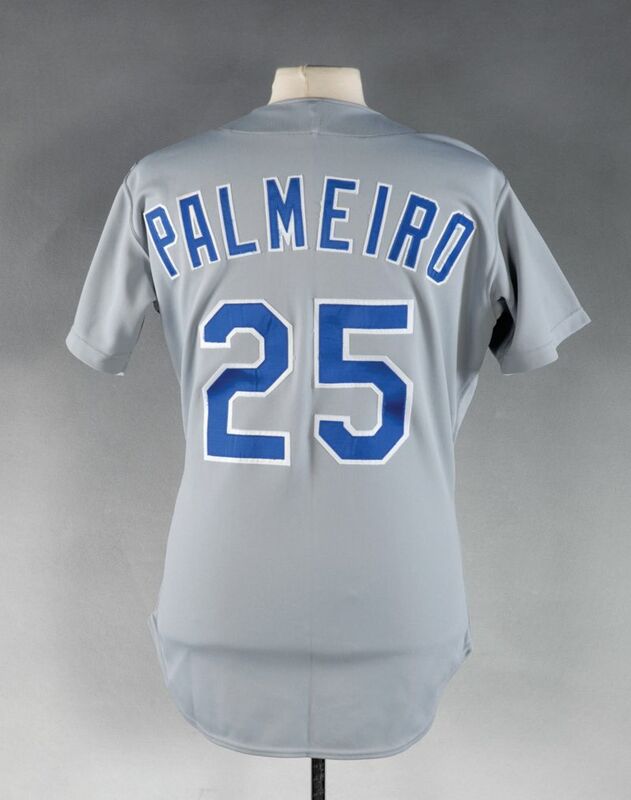 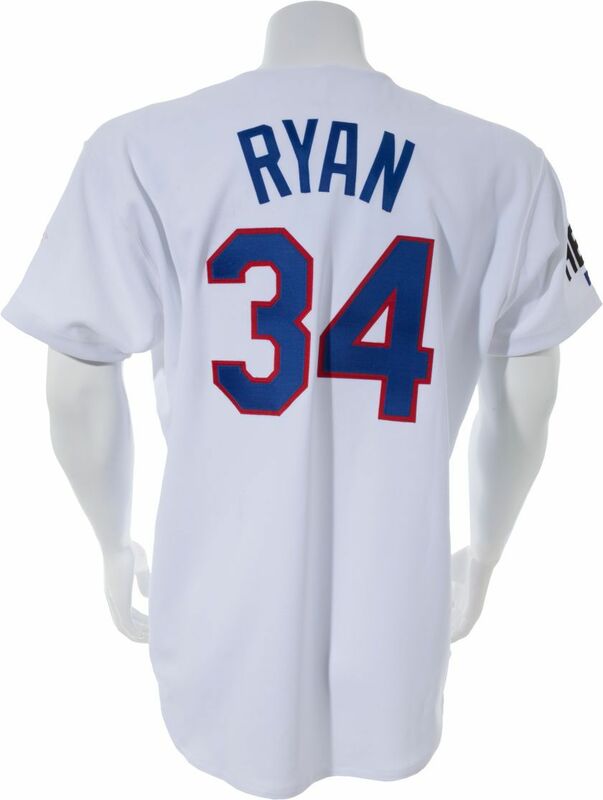 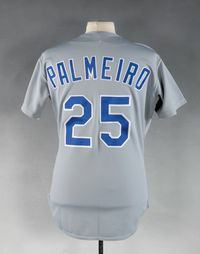 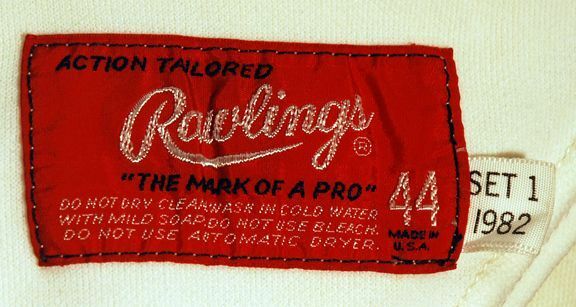 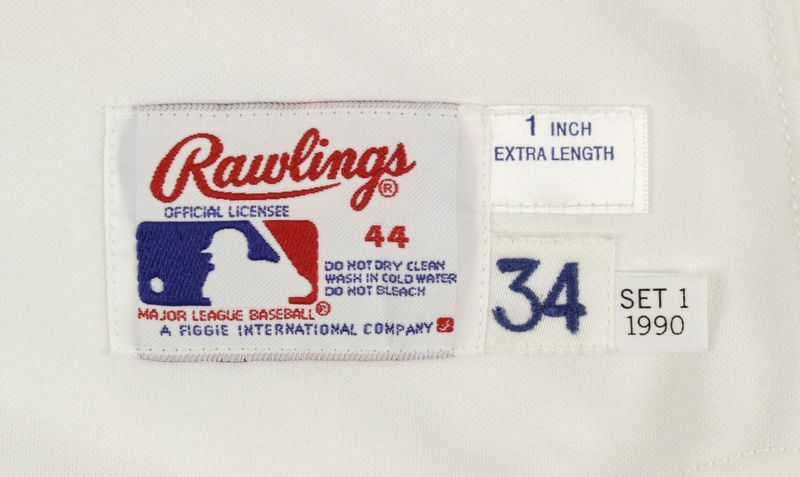 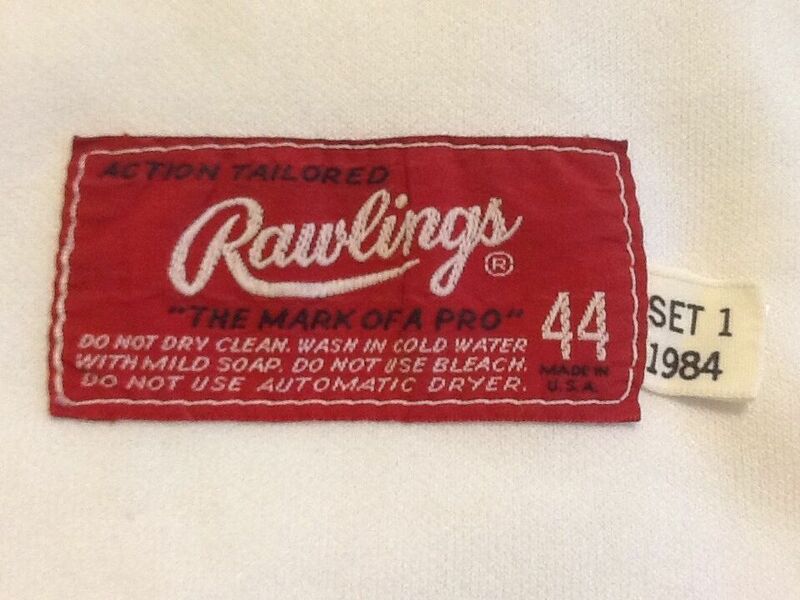 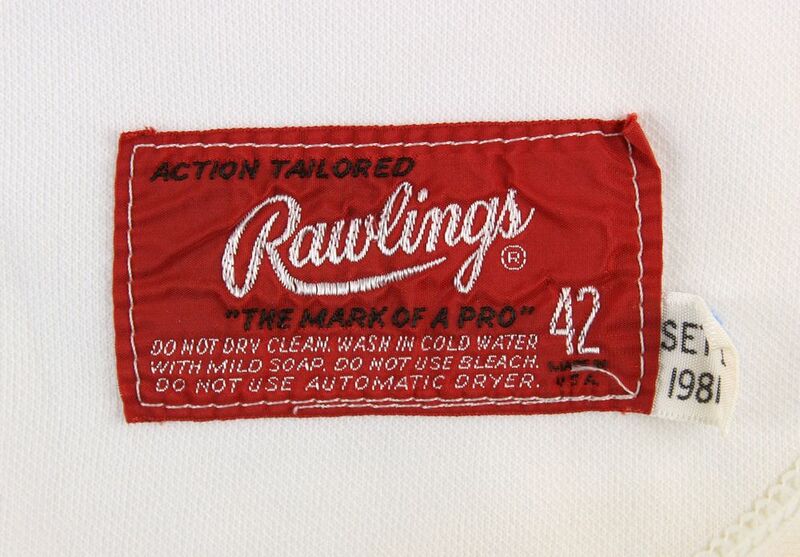 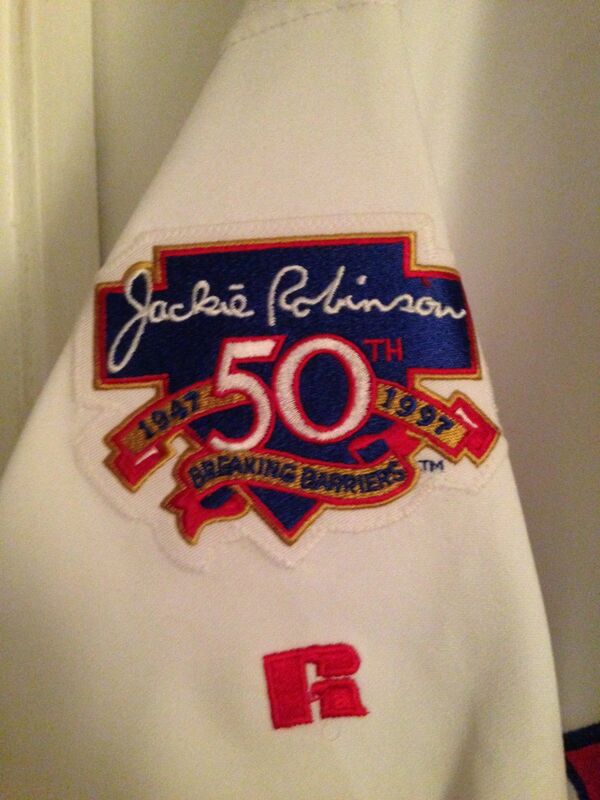 No nameplate on the Rawlings home jersey. 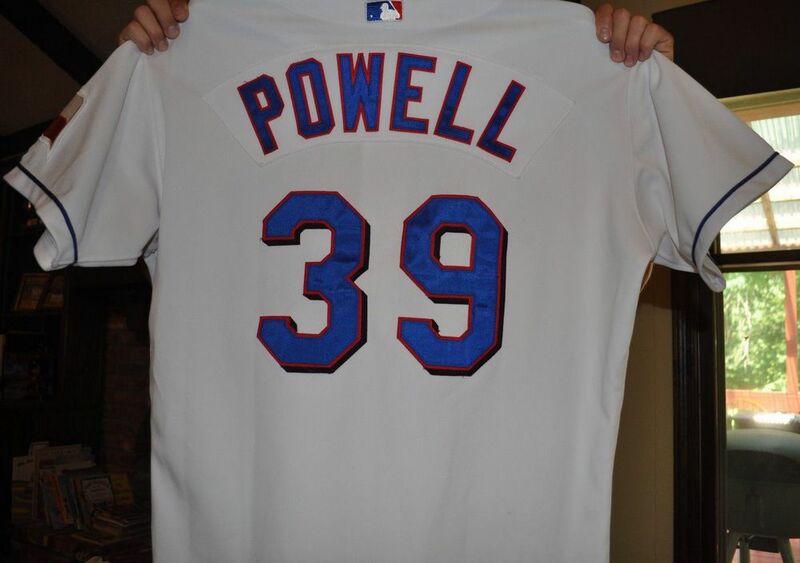 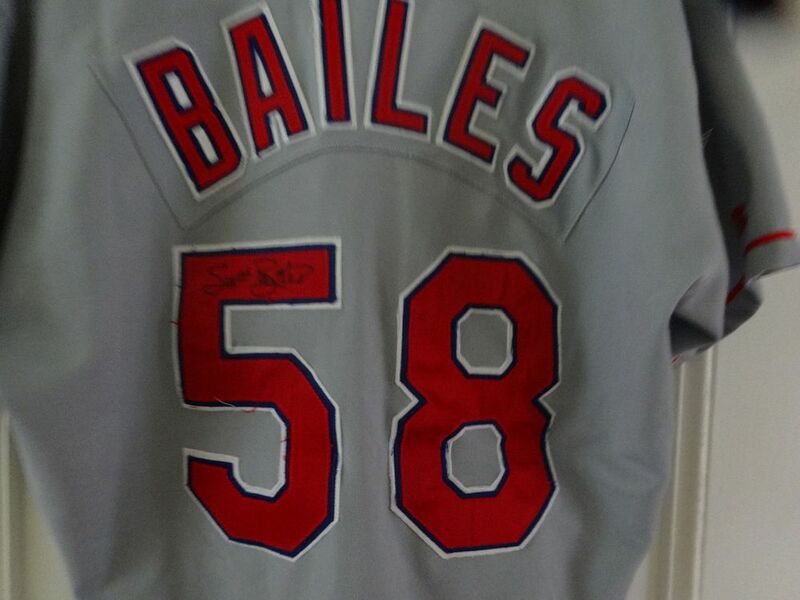 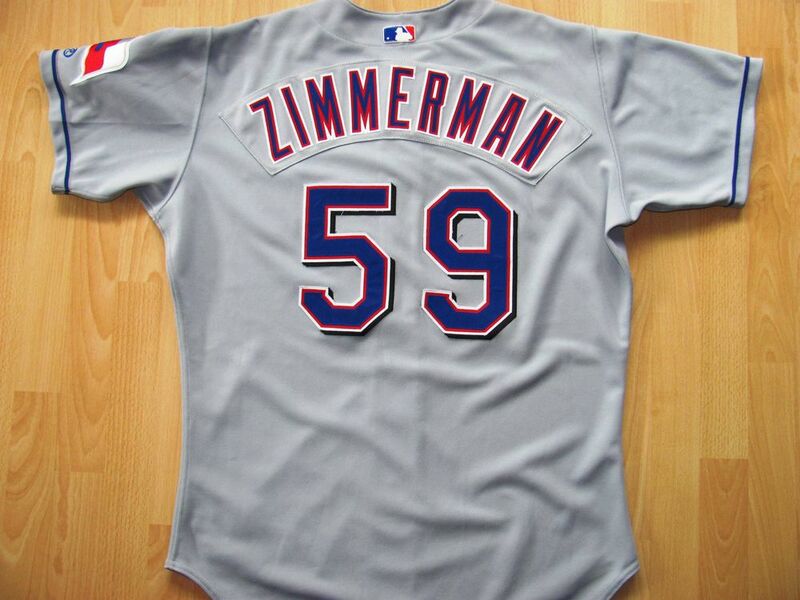 Nameplate dropped from road jersey with the switch to Rawlings. 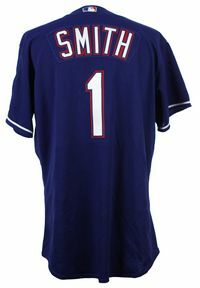 Here's an interesting number switch. Players (at least some) could choose from either supplier. 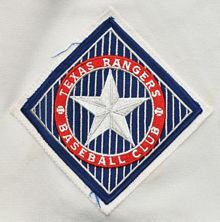 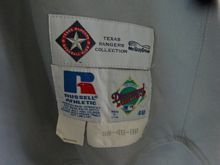 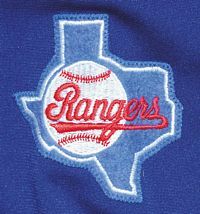 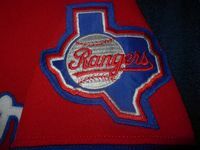 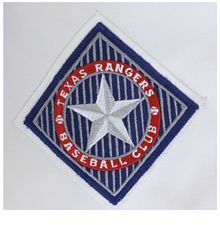 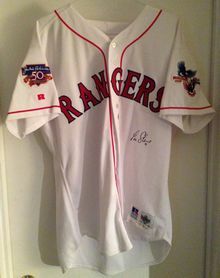 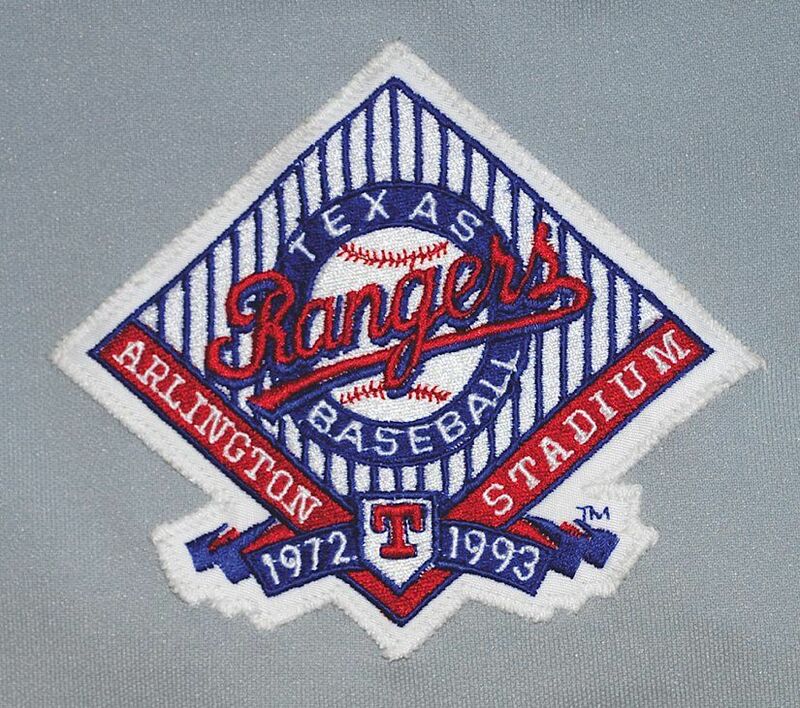 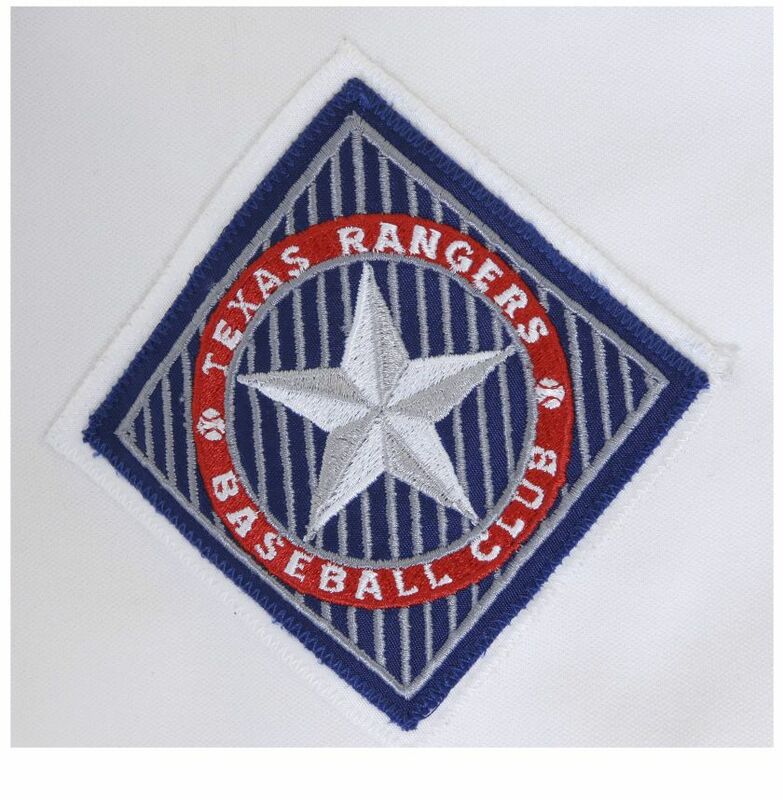 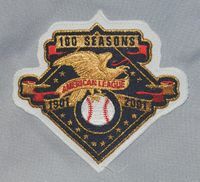 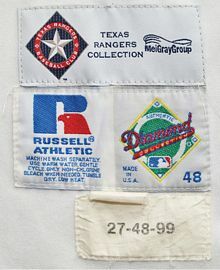 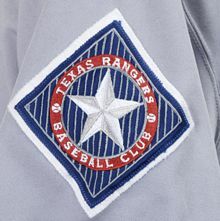 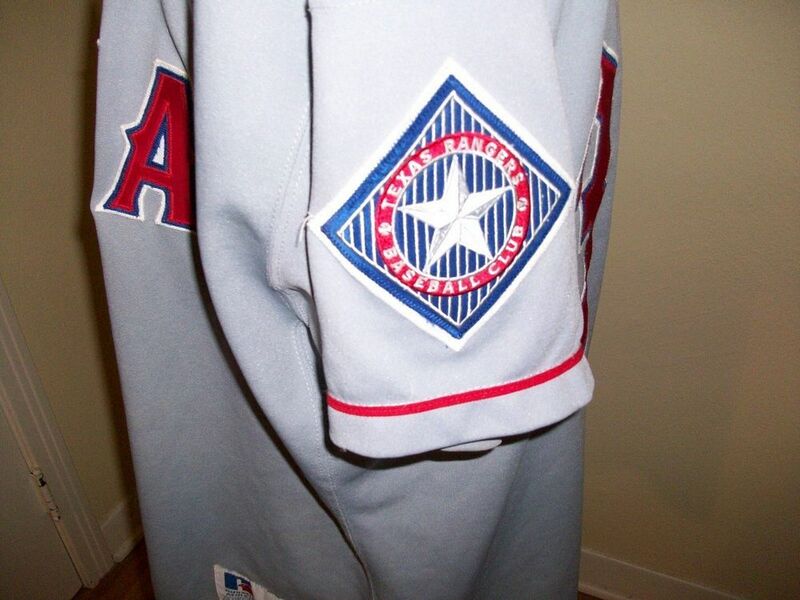 Arlington Stadium patch worn in 1993. 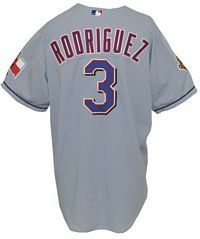 A new design with red becoming the primary color and blue the accent. 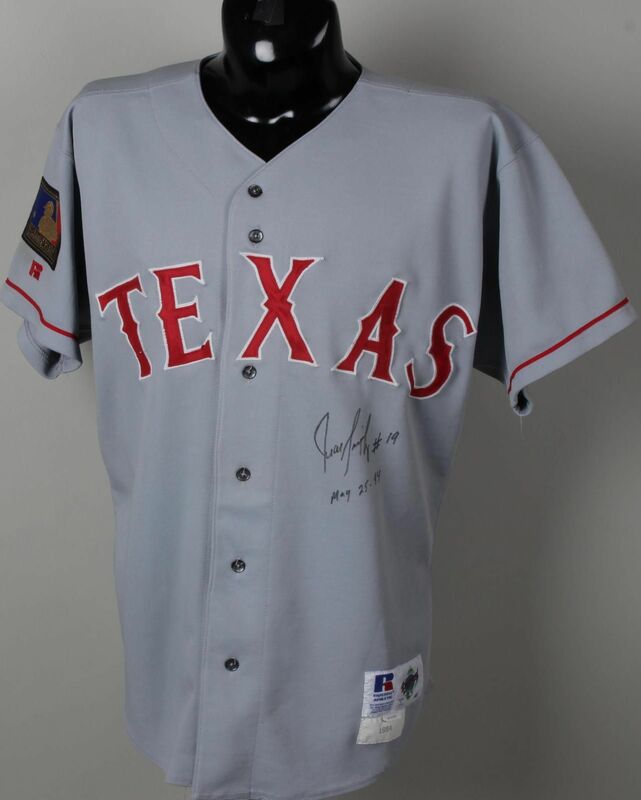 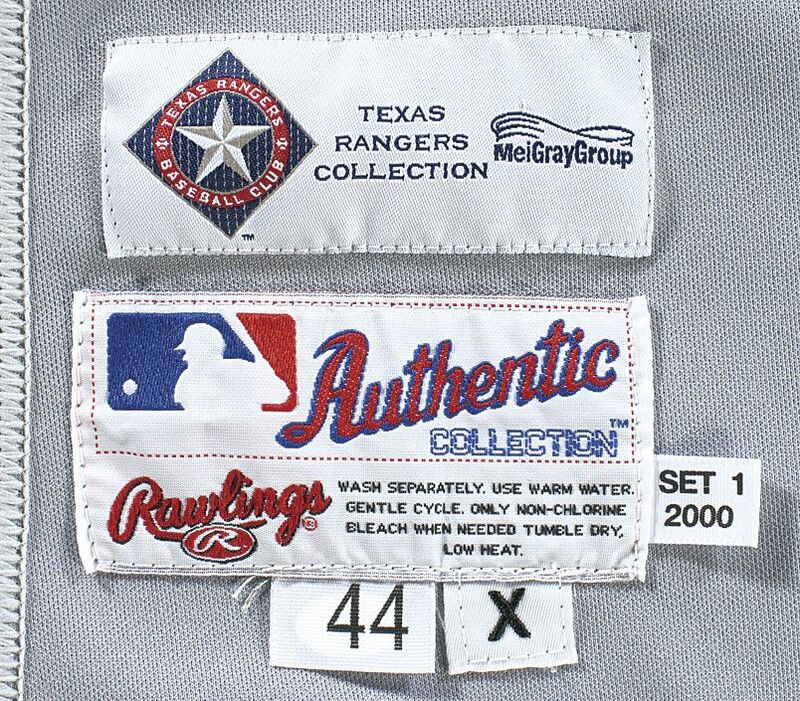 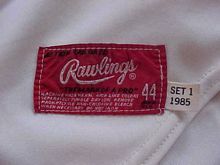 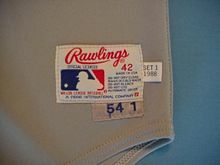 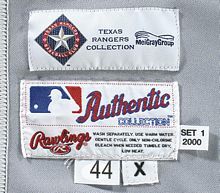 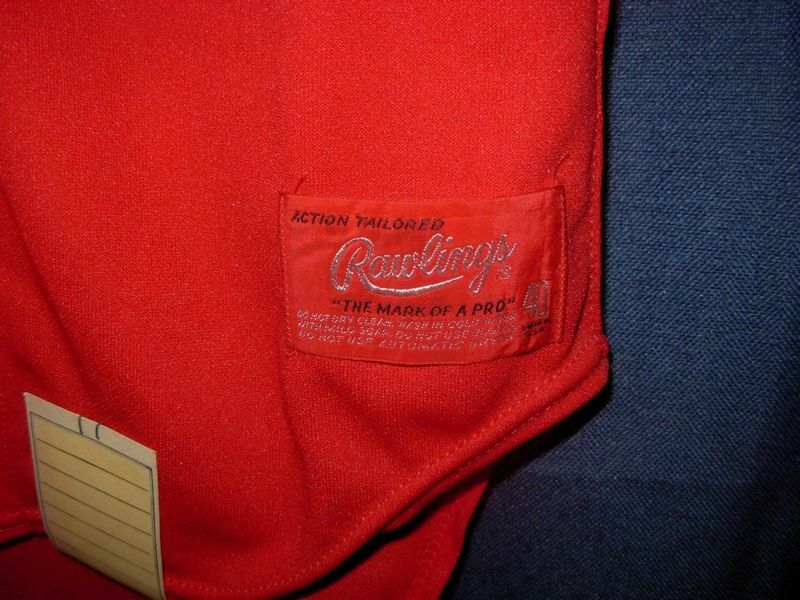 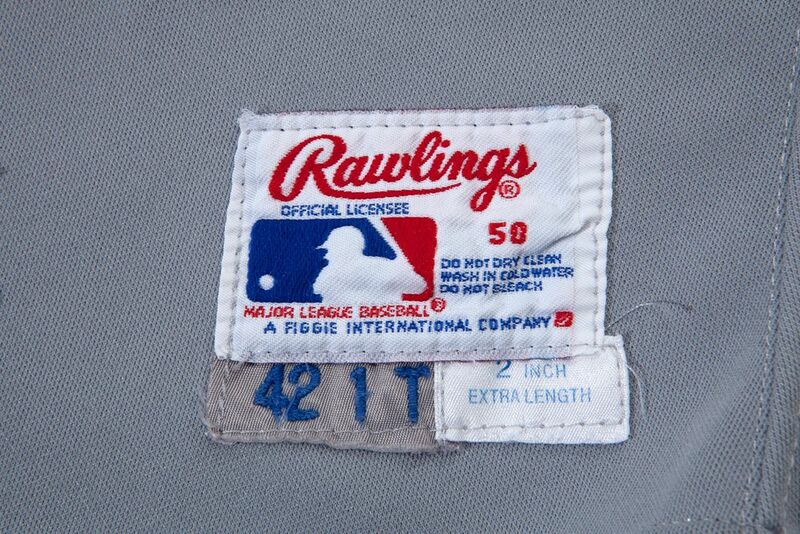 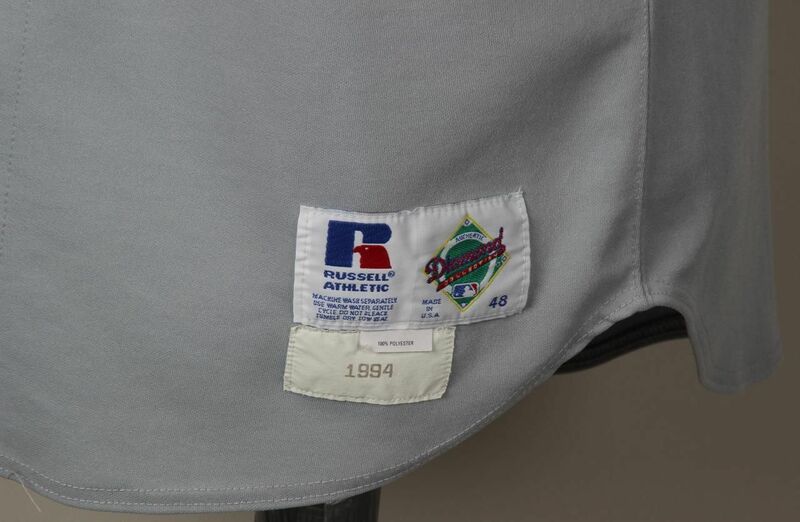 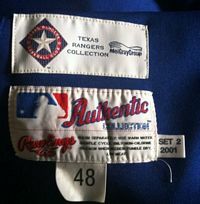 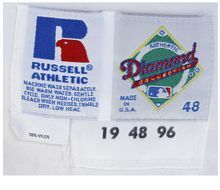 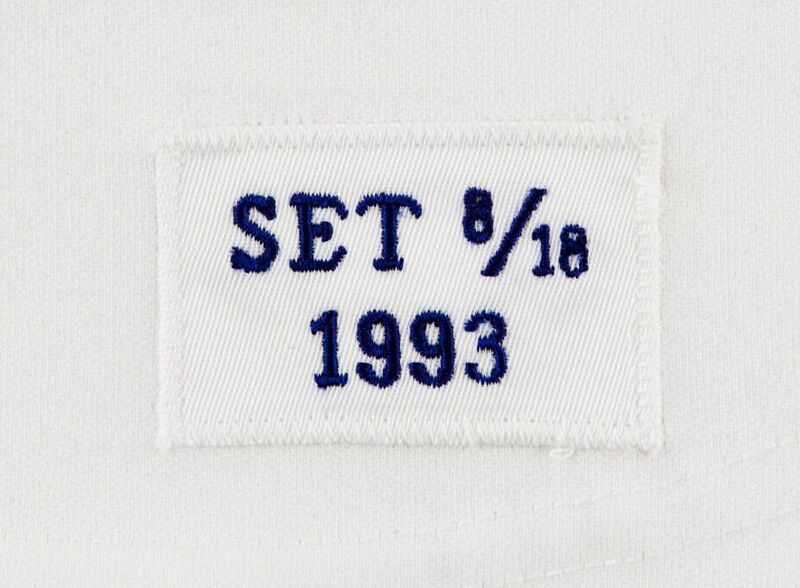 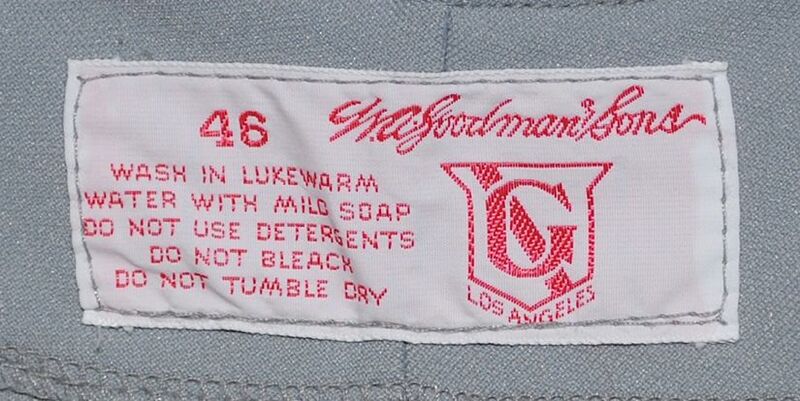 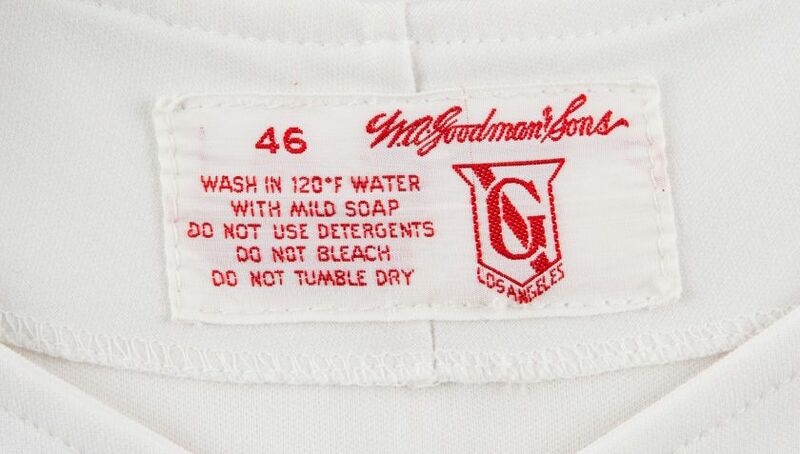 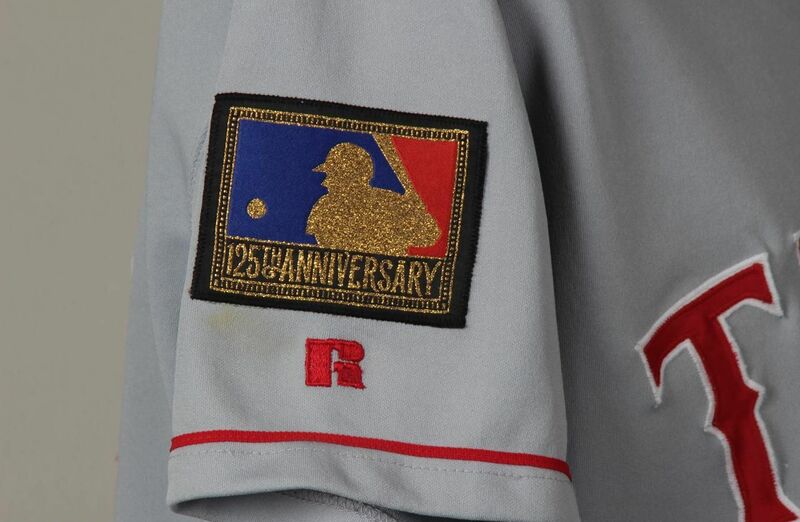 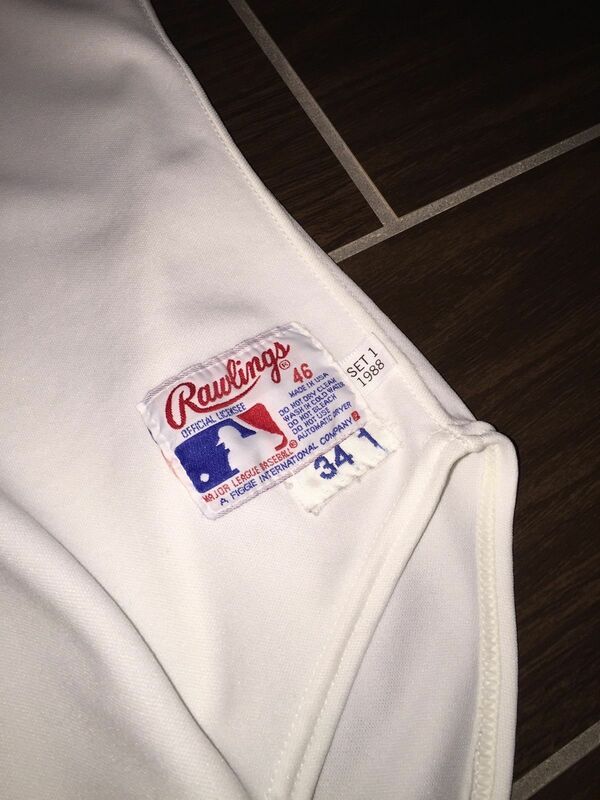 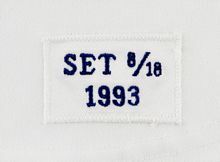 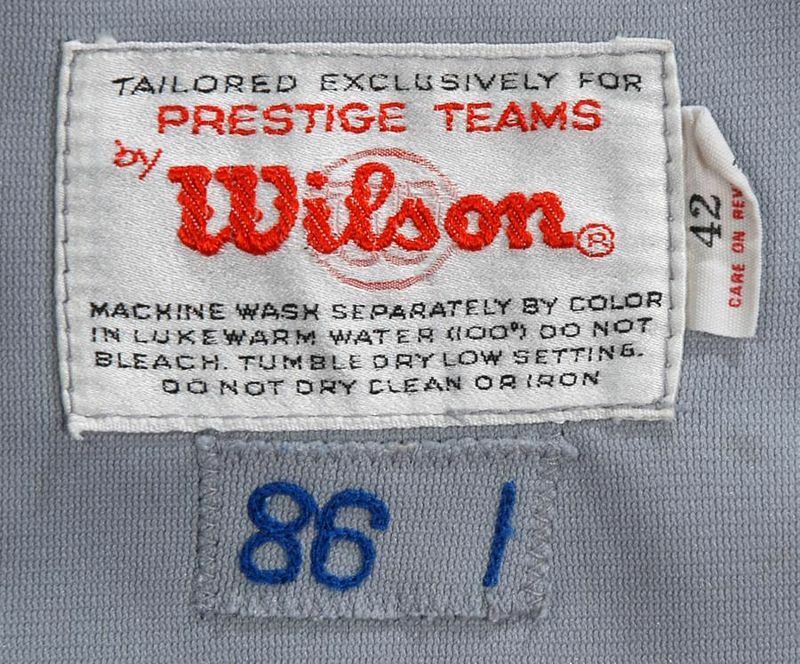 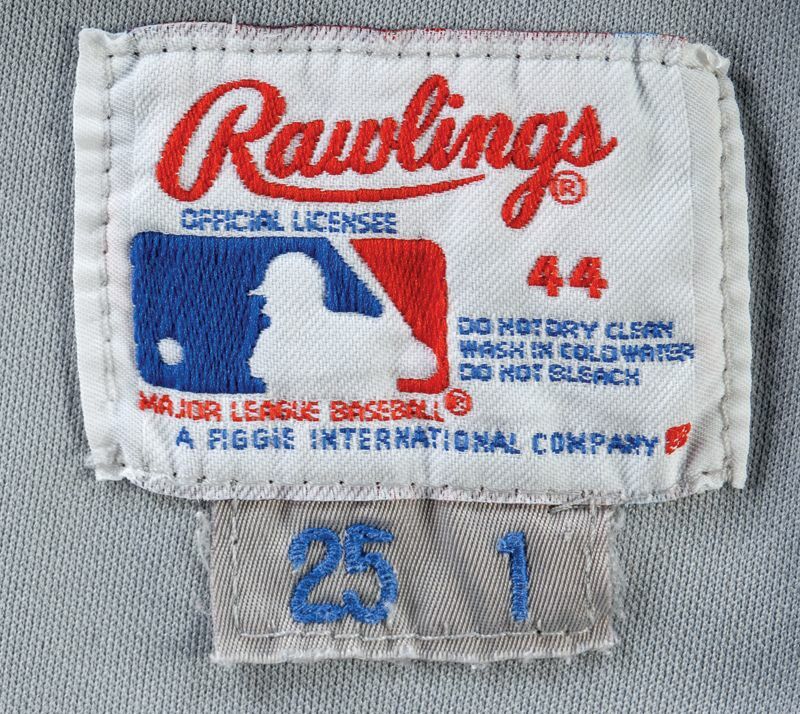 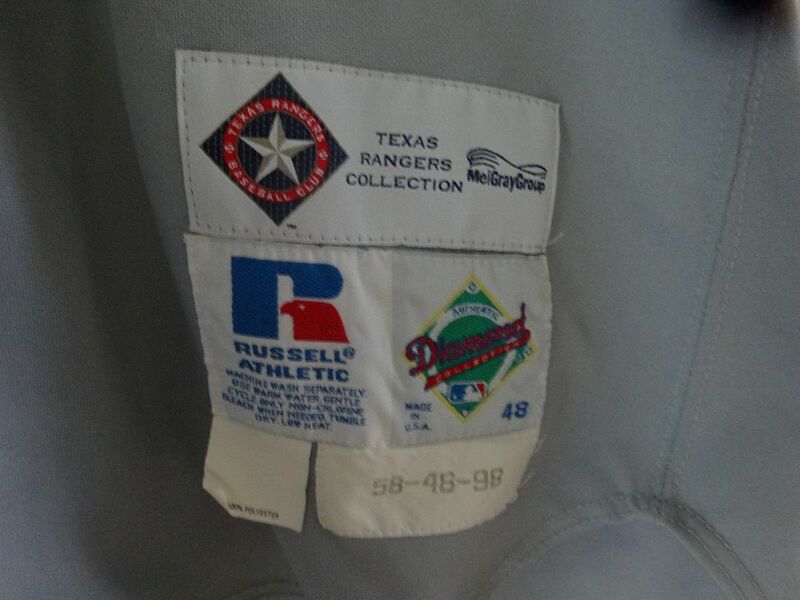 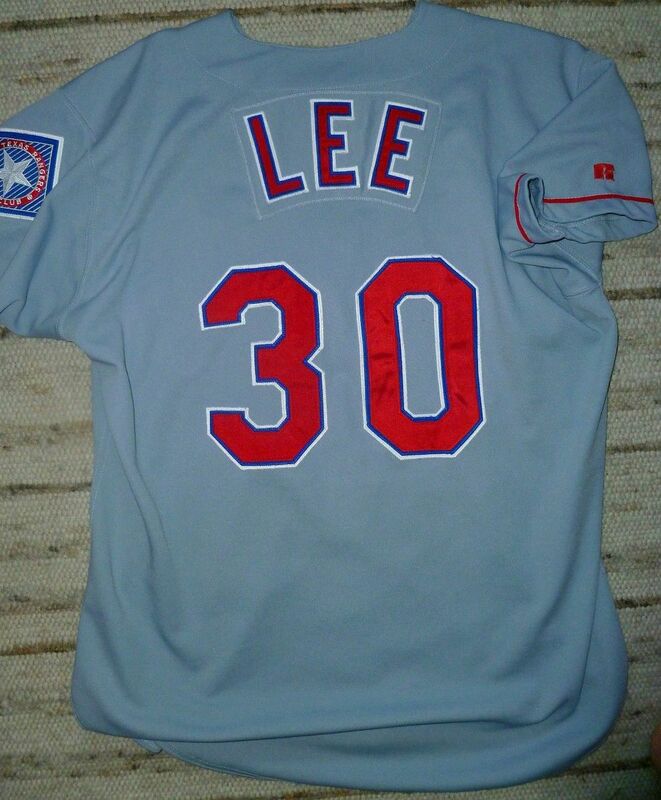 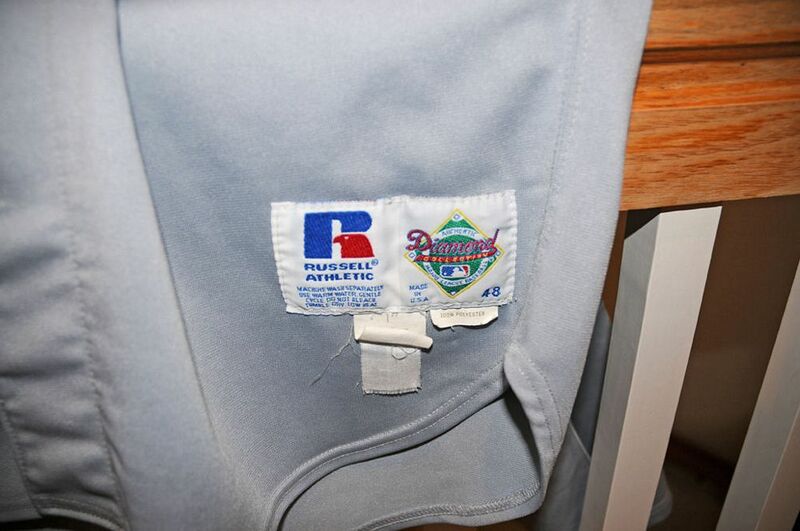 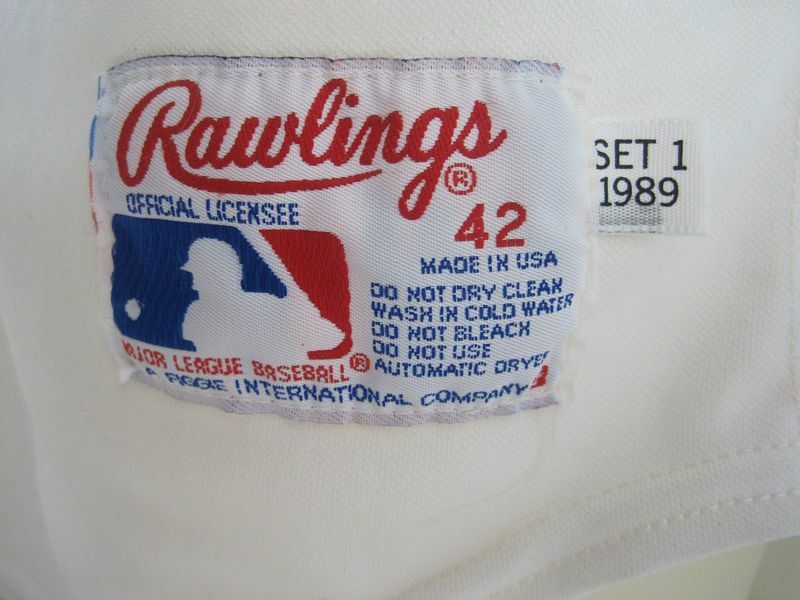 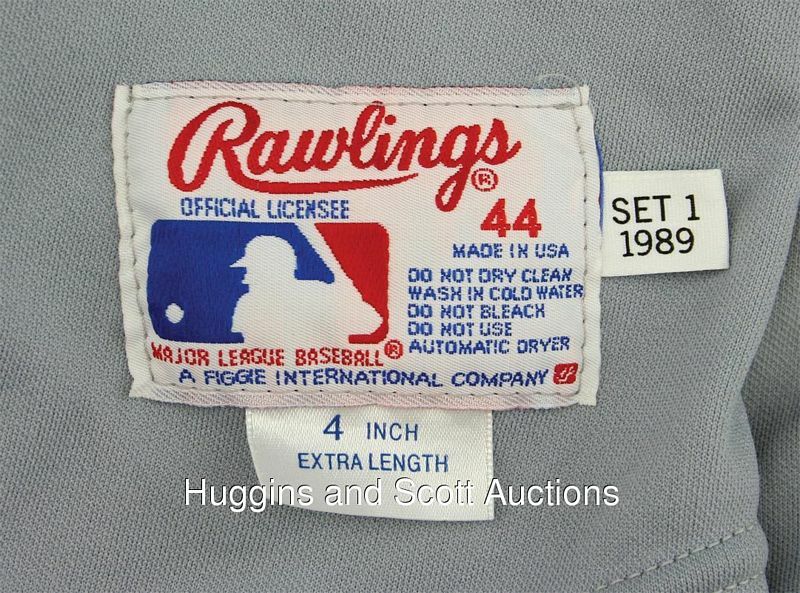 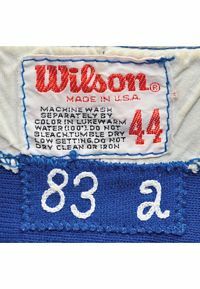 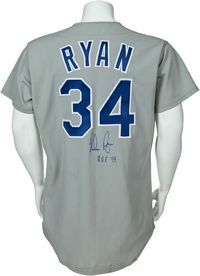 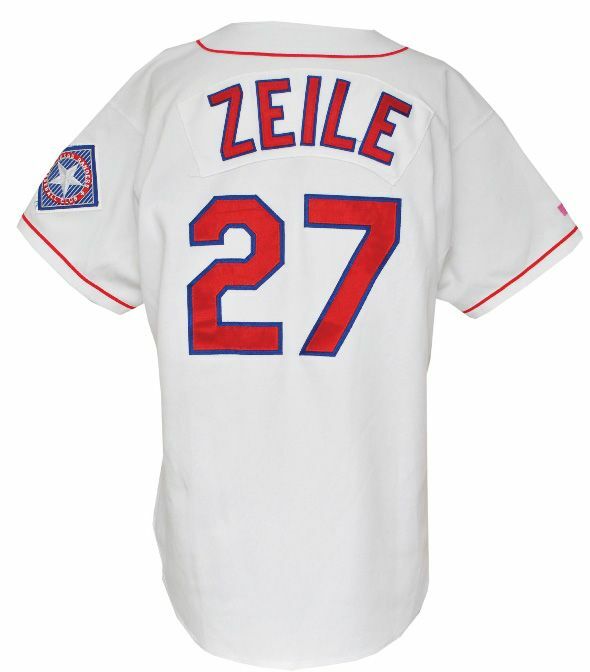 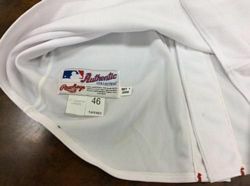 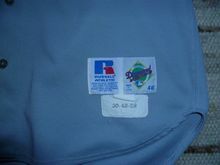 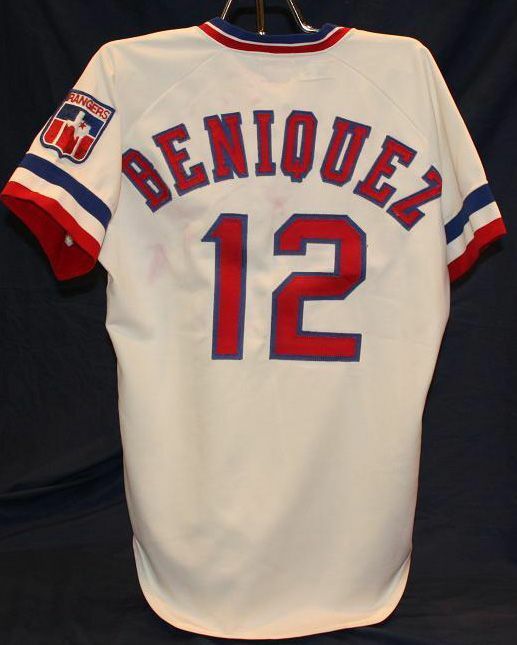 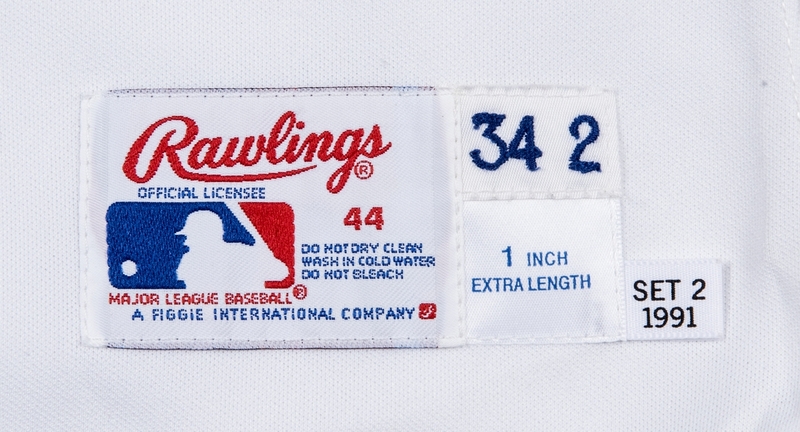 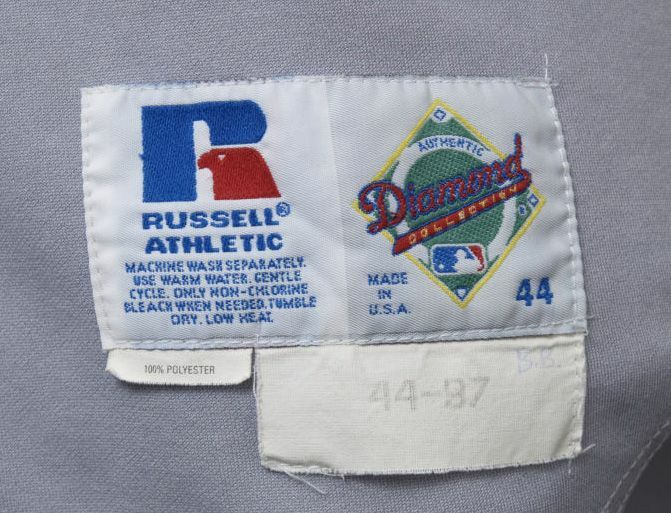 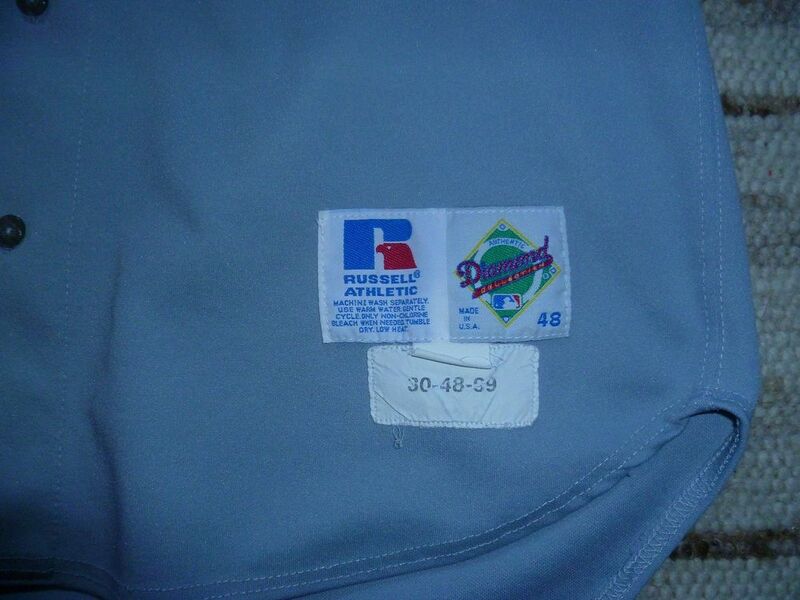 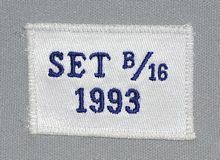 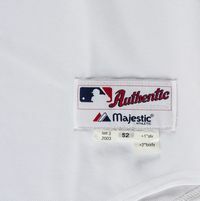 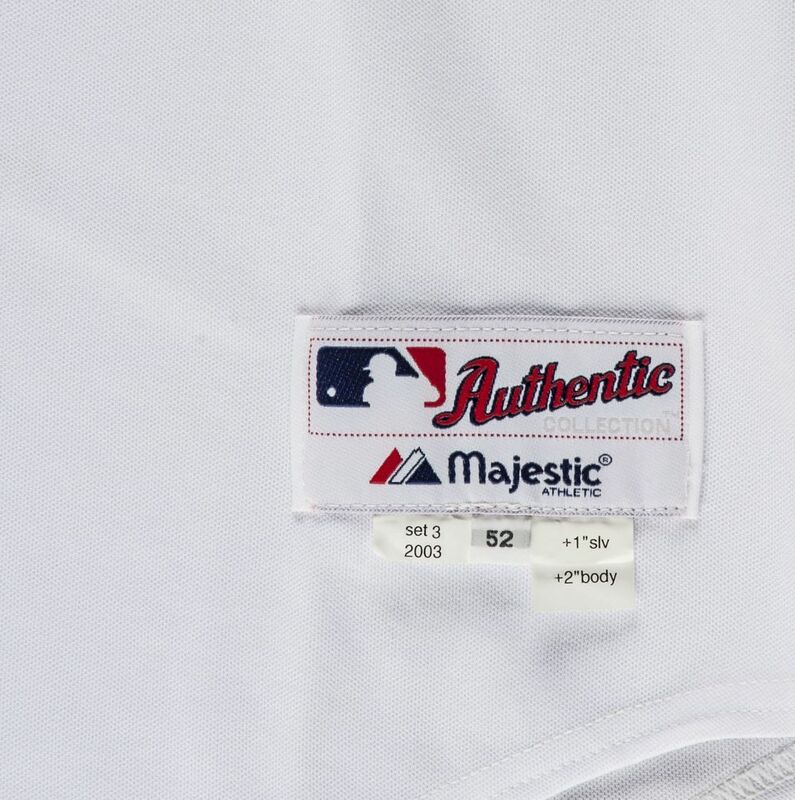 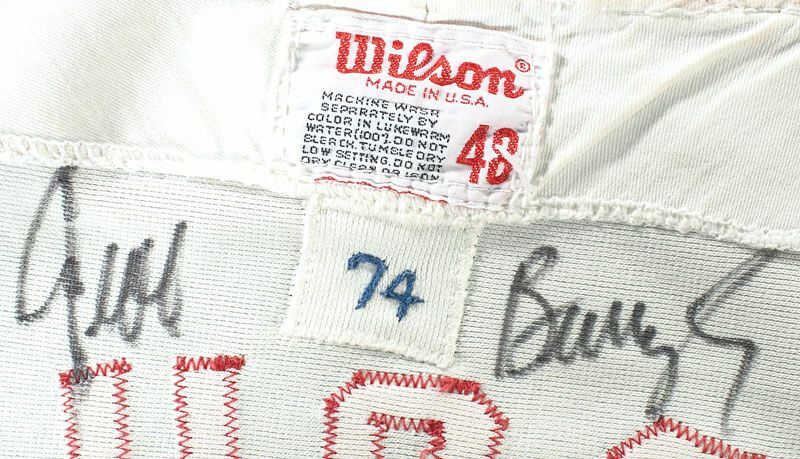 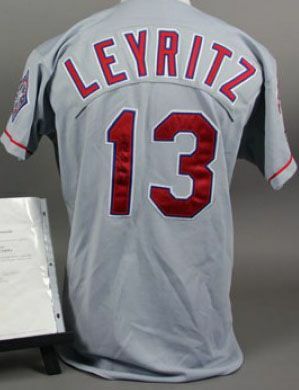 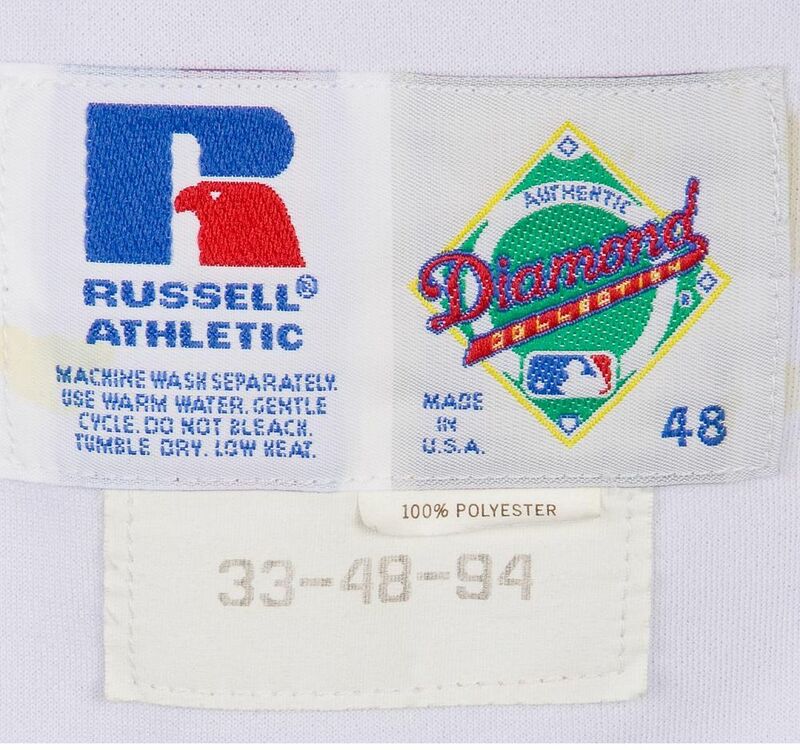 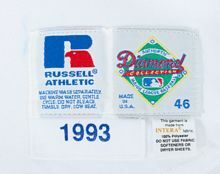 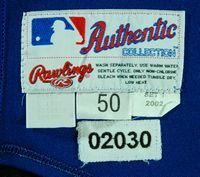 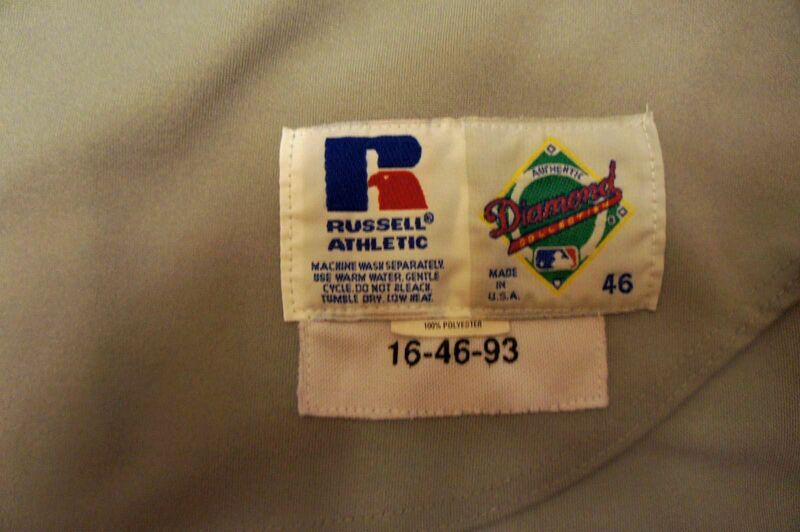 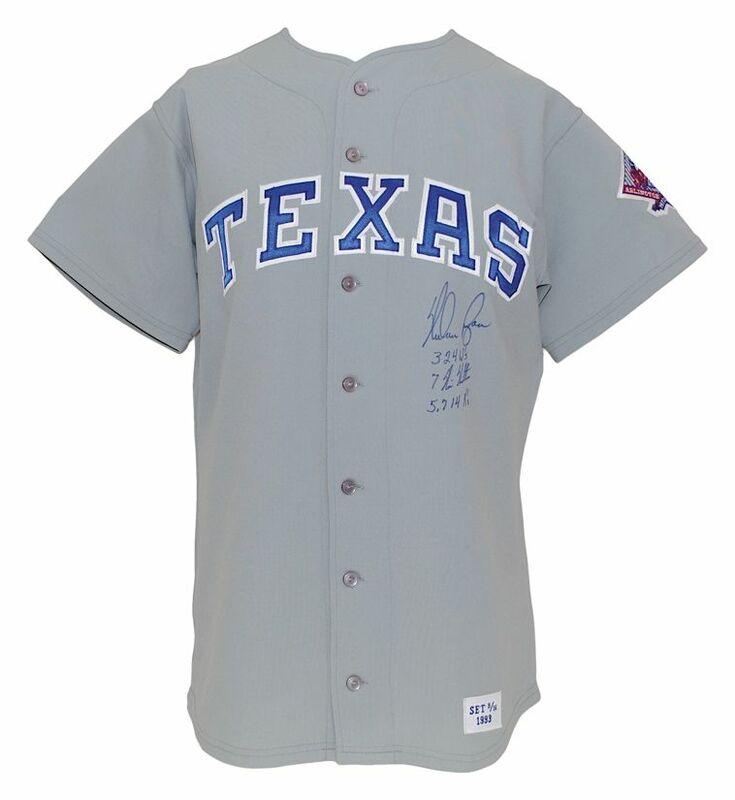 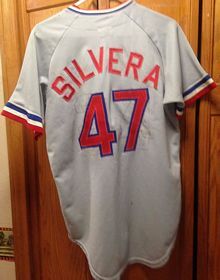 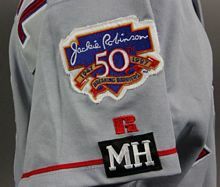 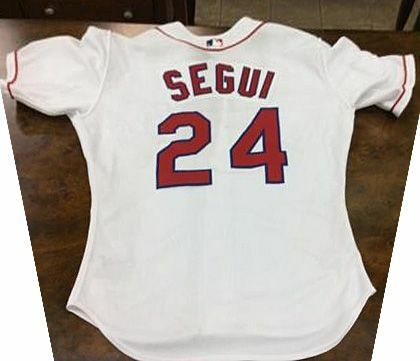 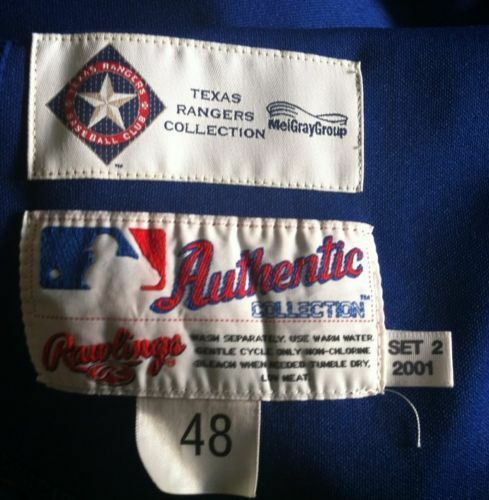 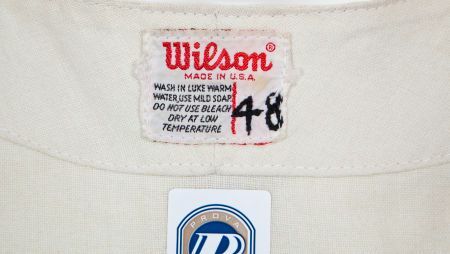 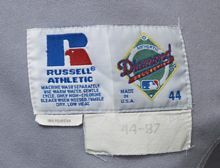 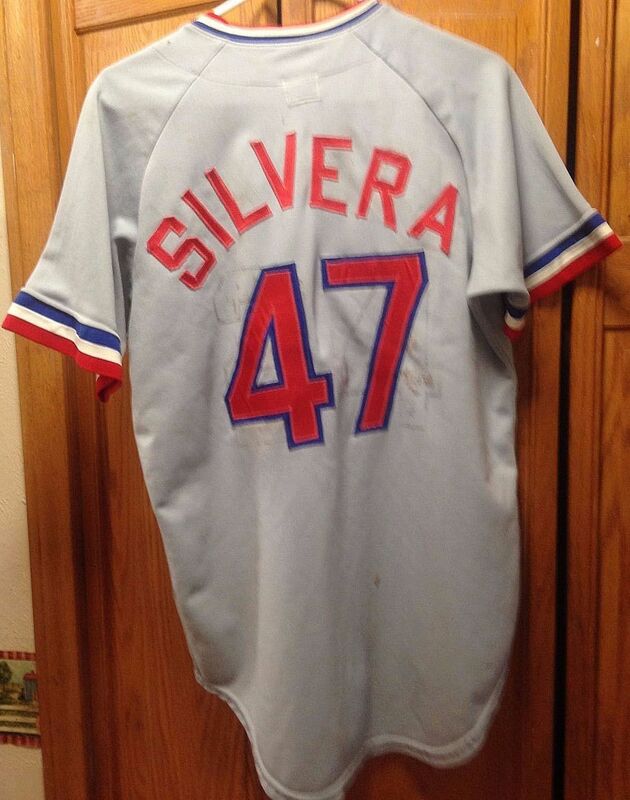 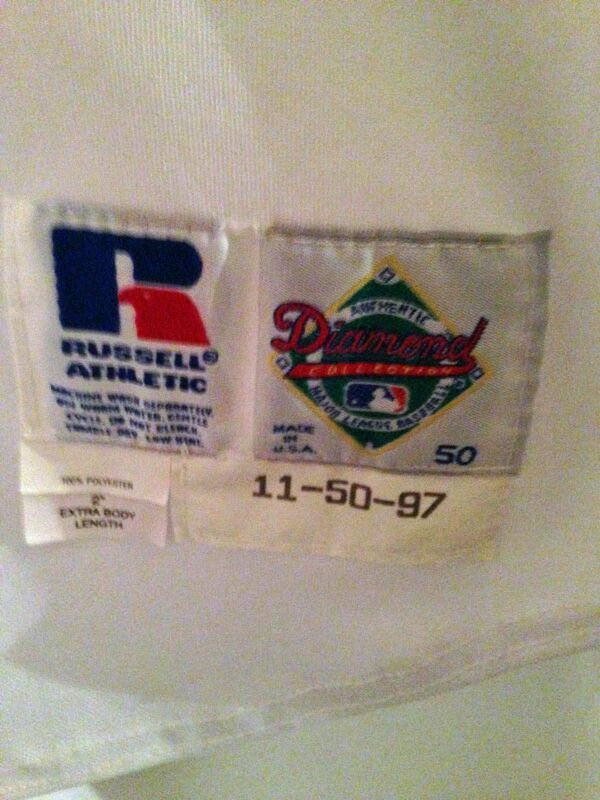 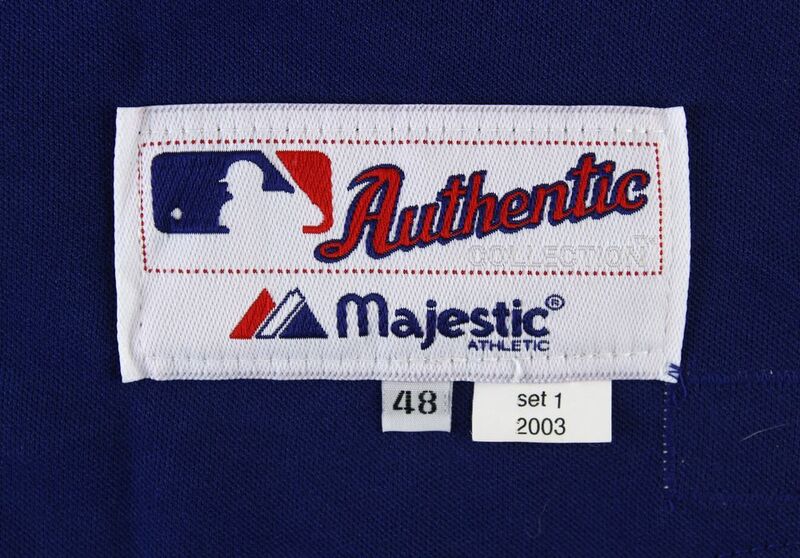 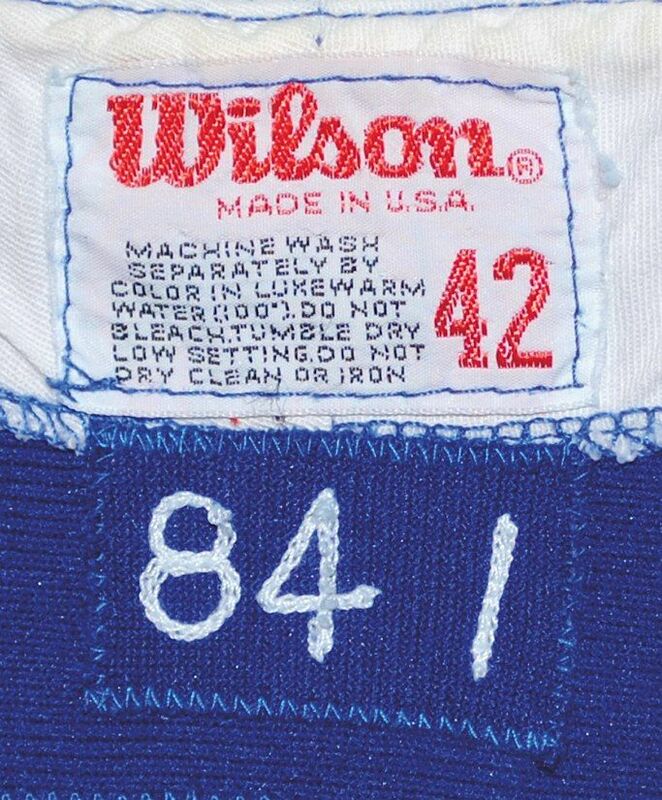 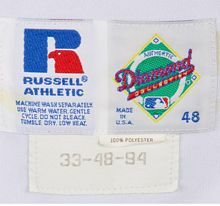 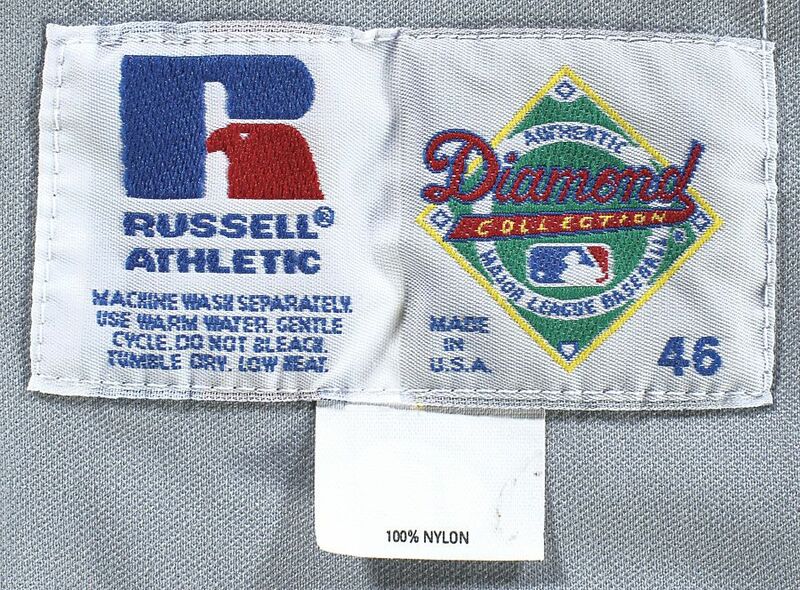 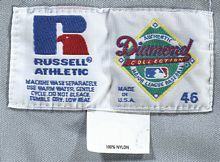 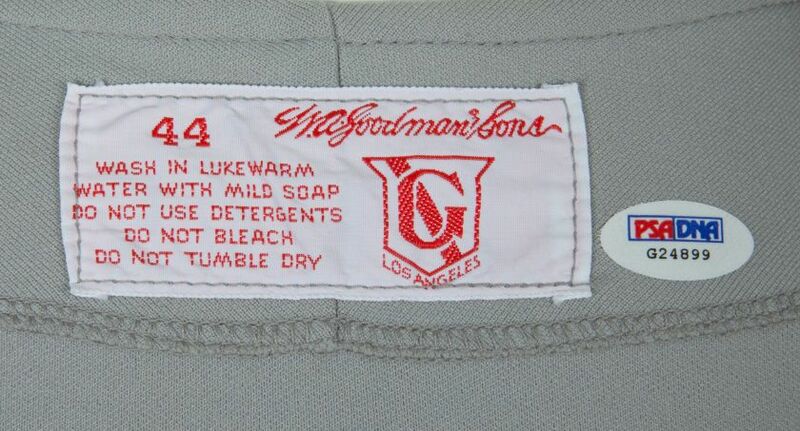 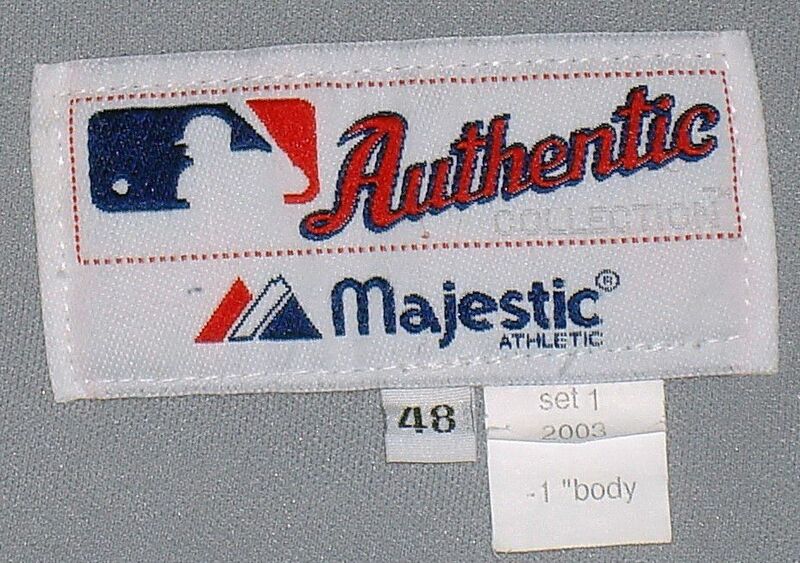 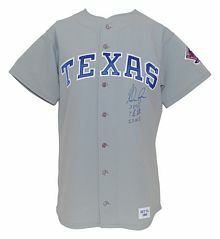 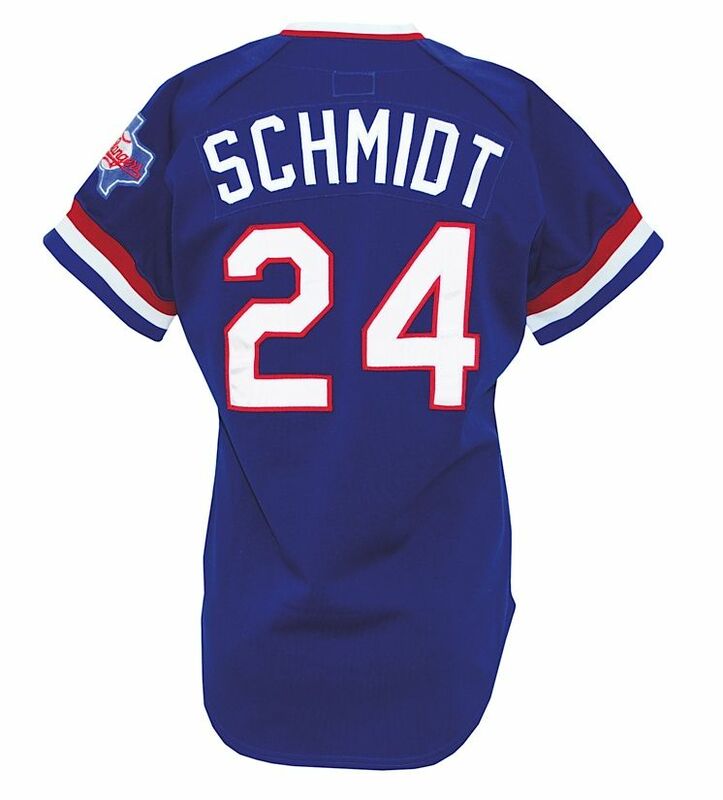 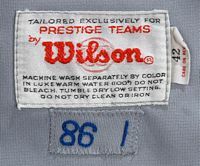 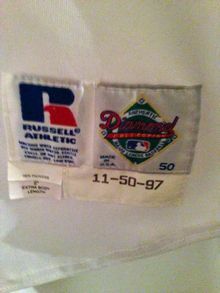 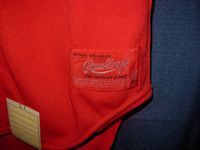 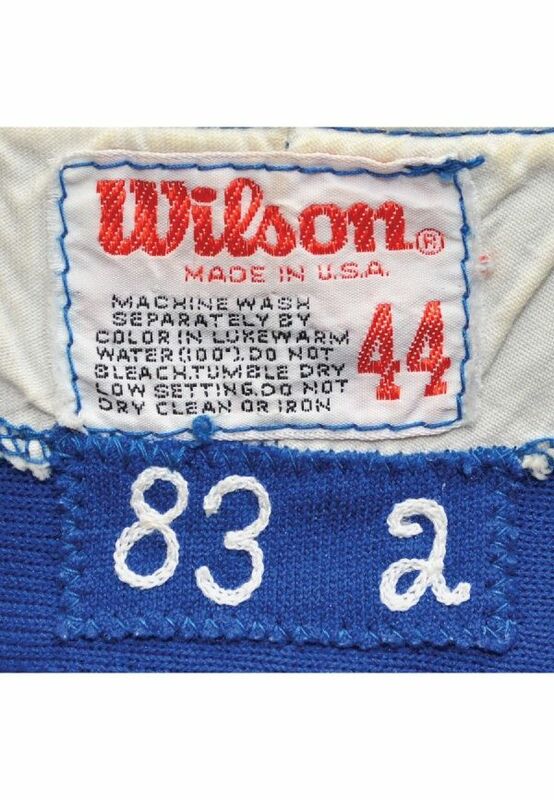 The 1994 MLB 125th anniversary patch is worn only on the road jersey. 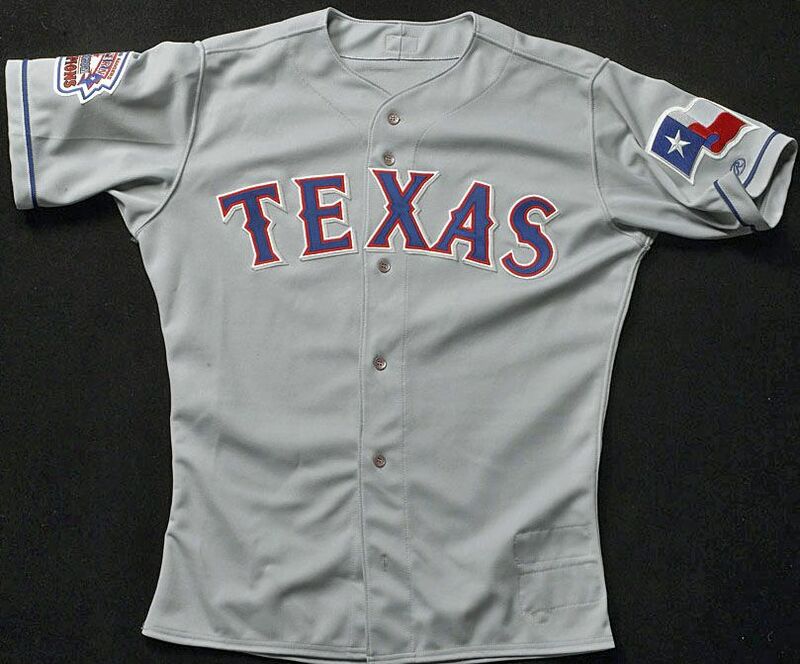 Blue trim added to the road jersey, sleeve patch debuts. Nameplates return. 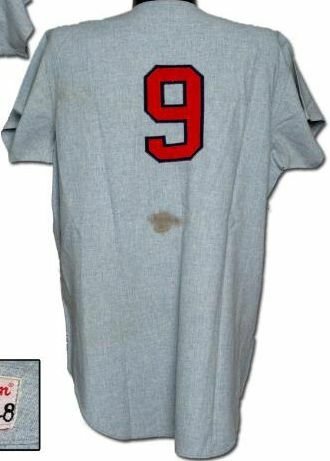 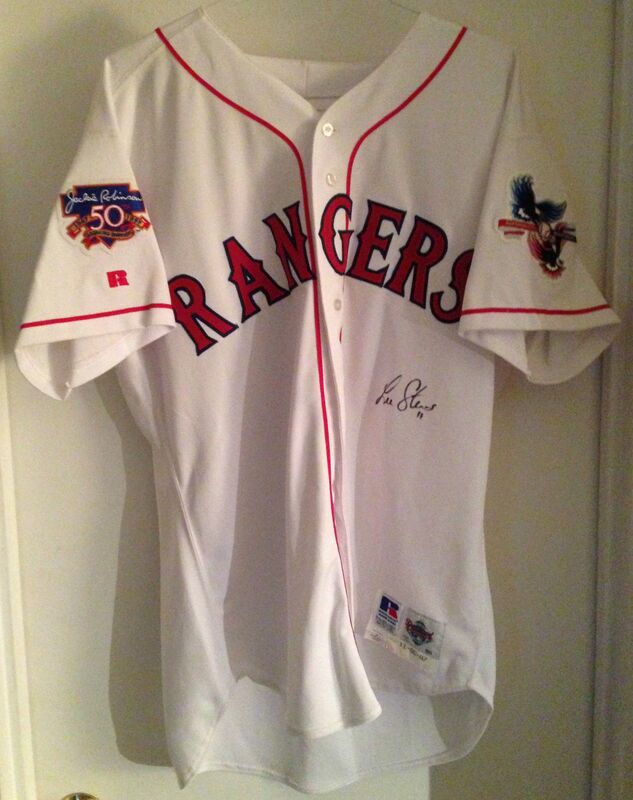 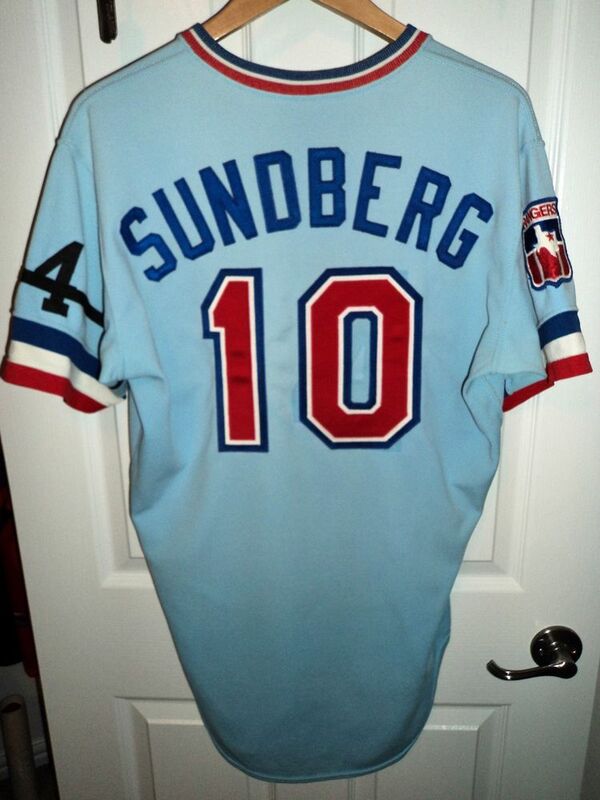 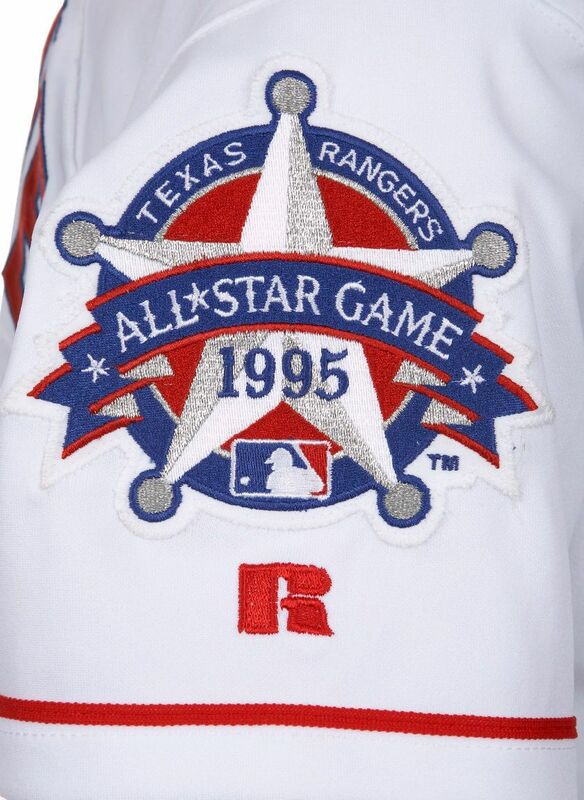 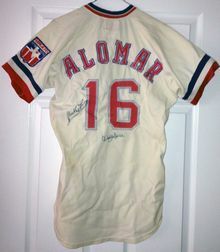 All Star game patch worn on 1995 home jerseys. 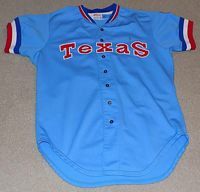 Blue becomes the primary color on road jerseys. 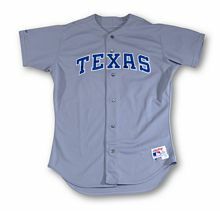 Alternate blue jersey introduced. 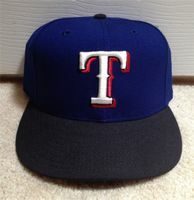 Road cap turns blue. Division Champions patch on 2000 jerseys. 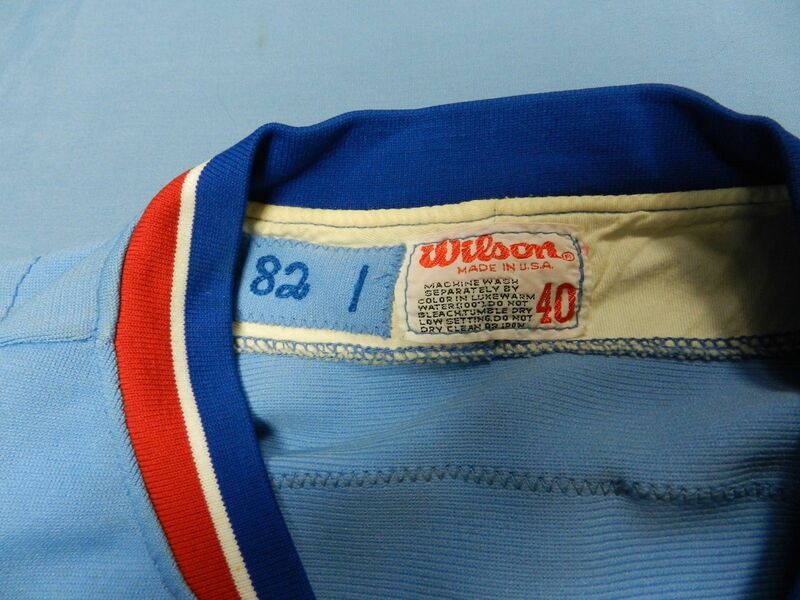 Blue also becomes the primary color on home jerseys. 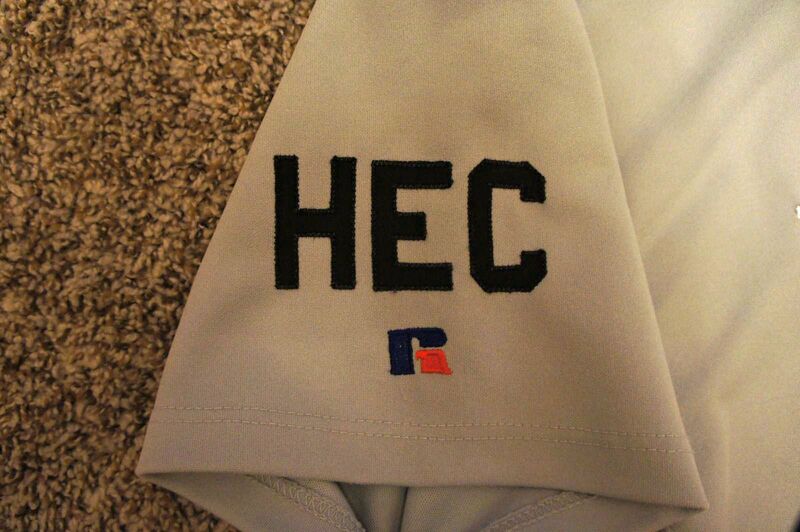 Front piping dropped. 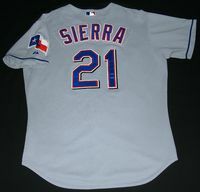 Black drop shadow added to lettering. 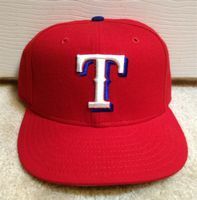 Another alternate cap with black bill introduced.